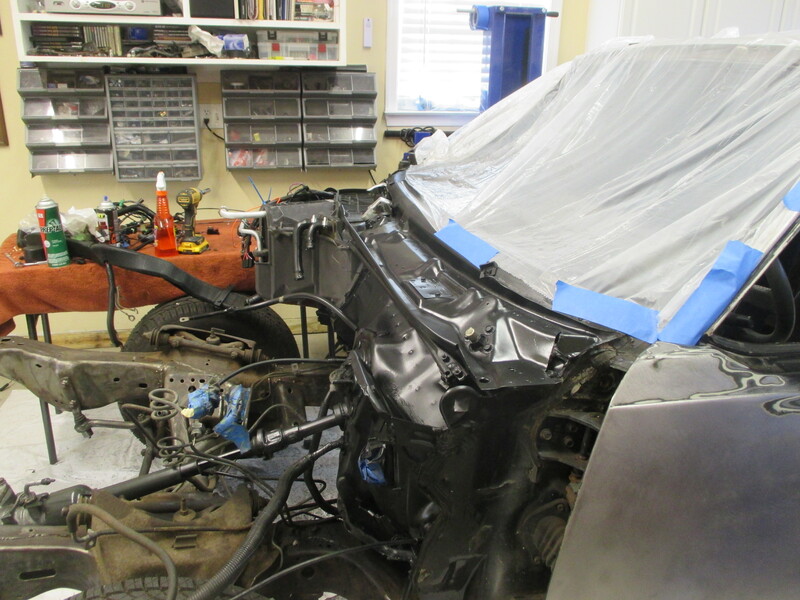 This car is entering into its final stages. 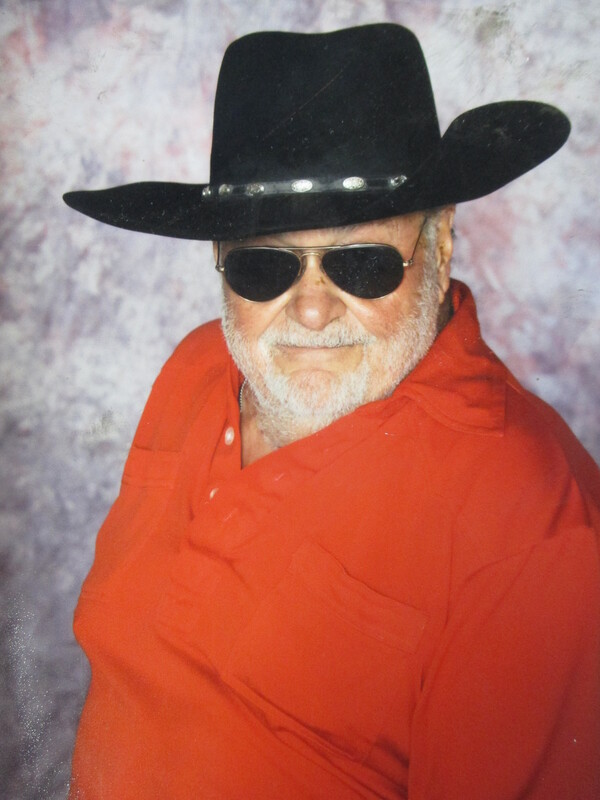 Before we continue we would like to take a moment to remember my Dad. It has been a while since we posted pictures as the better part of 2018 we spend much time with our Dad as his illness progressed. Sadly he passed away in January 2019. 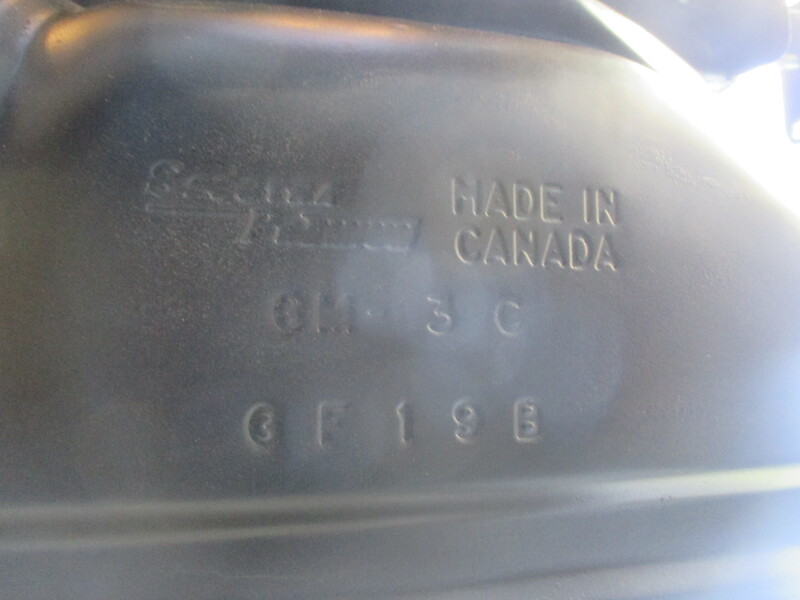 Dad was a man of many talents, Farmer, Baker, Lawyer and a great Dad. He also loved hobbies and took a genuine interest in other peoples hobbies. 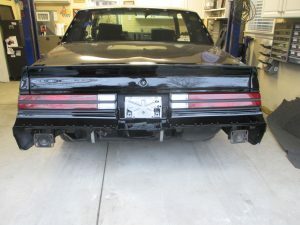 This car was interesting to him because it came from Long Island and he grew up in the Newark, NJ /New York area. 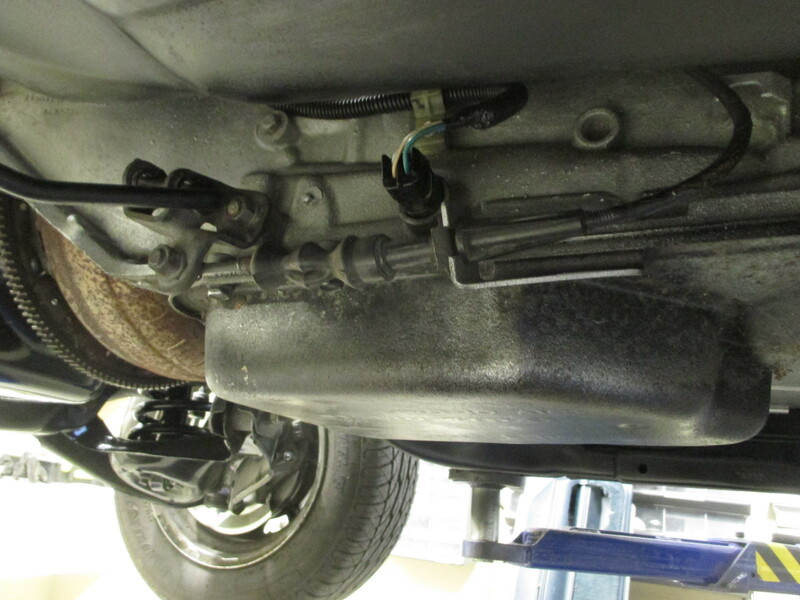 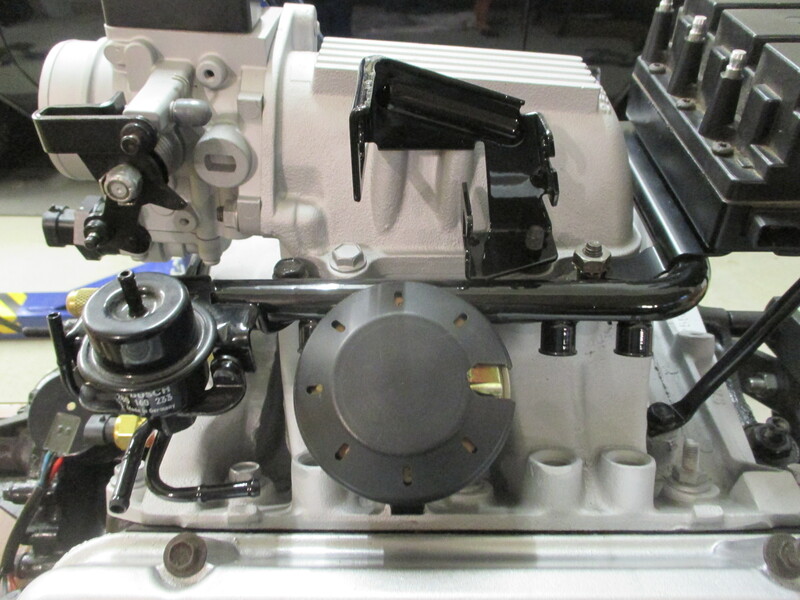 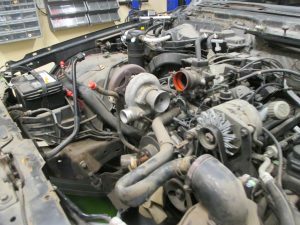 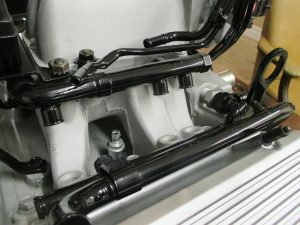 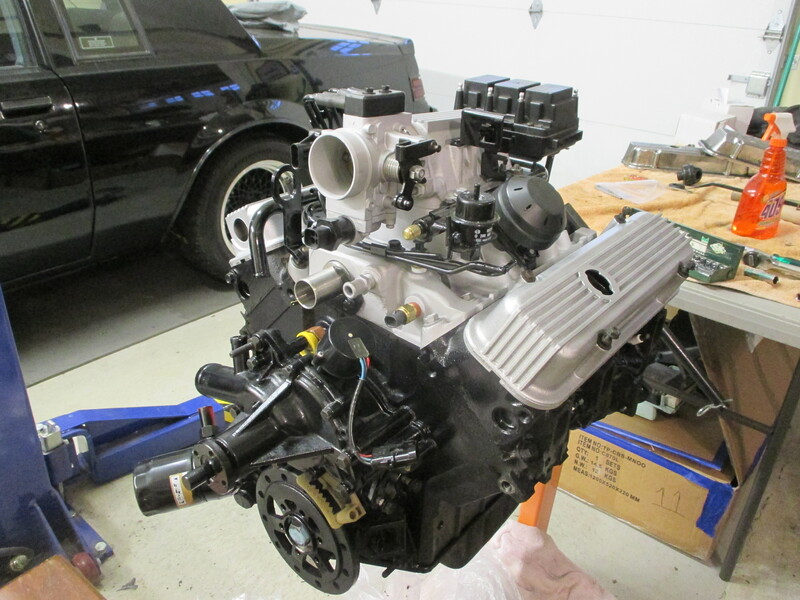 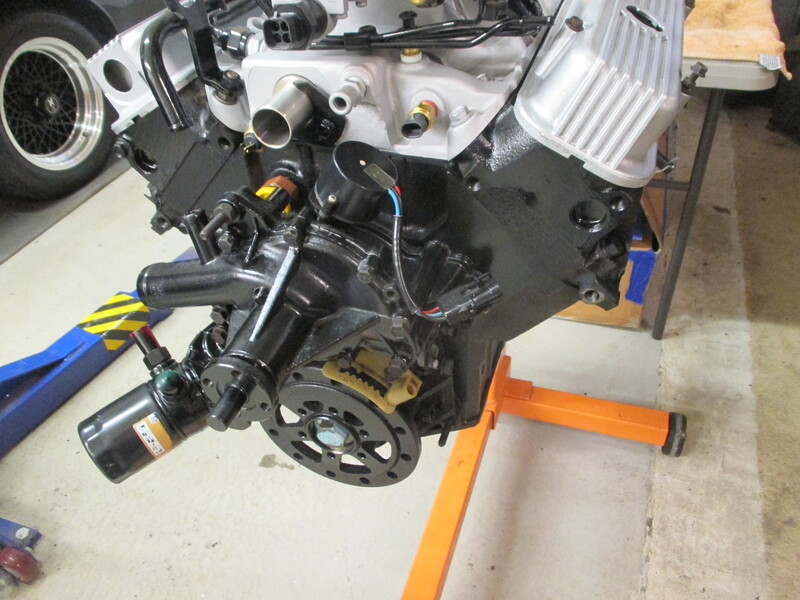 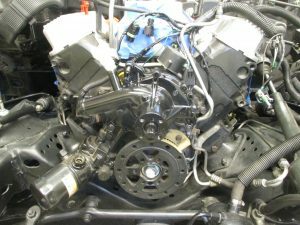 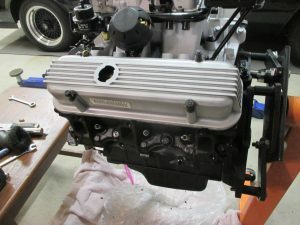 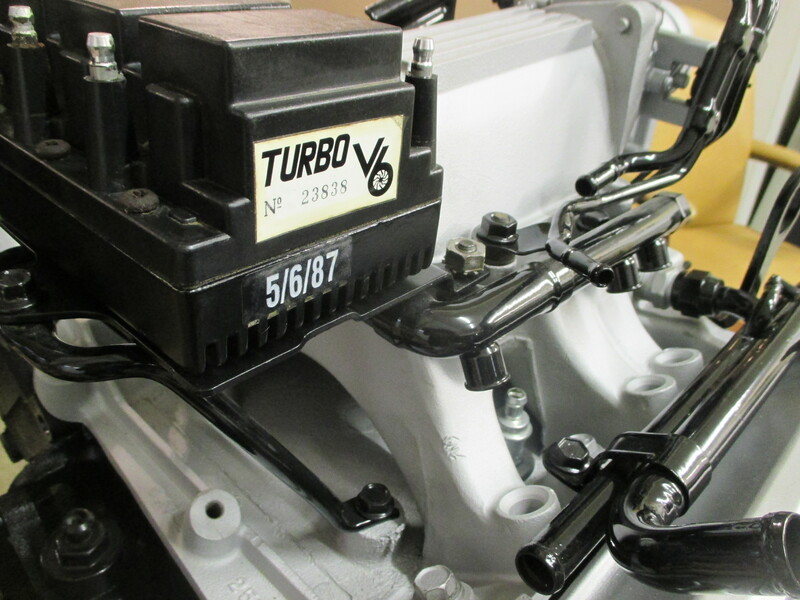 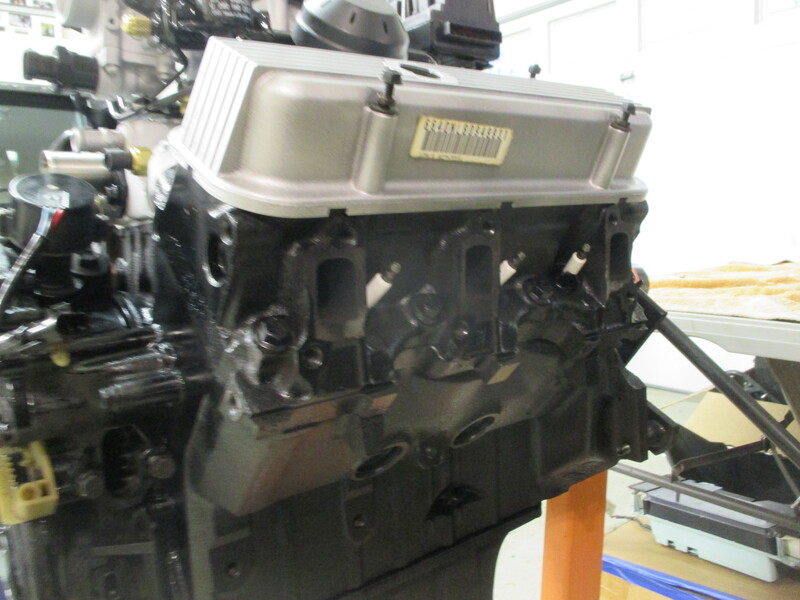 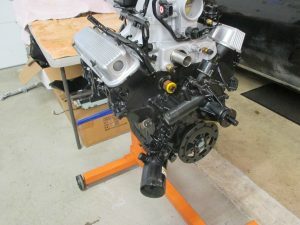 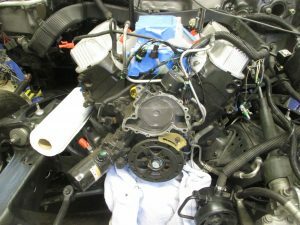 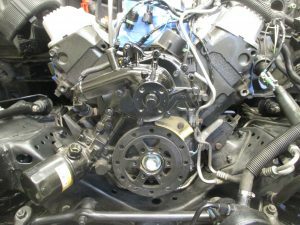 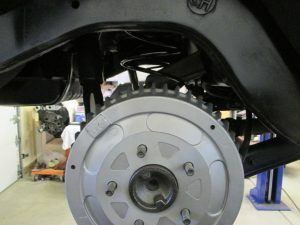 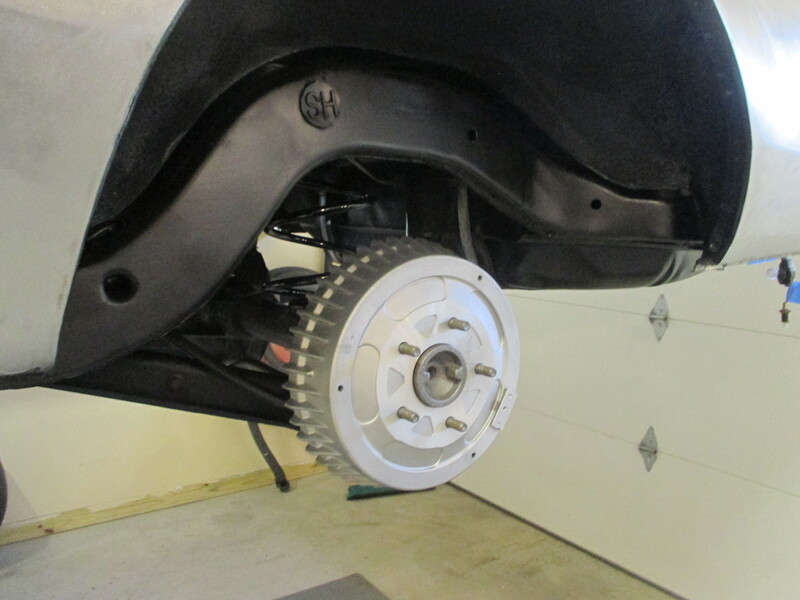 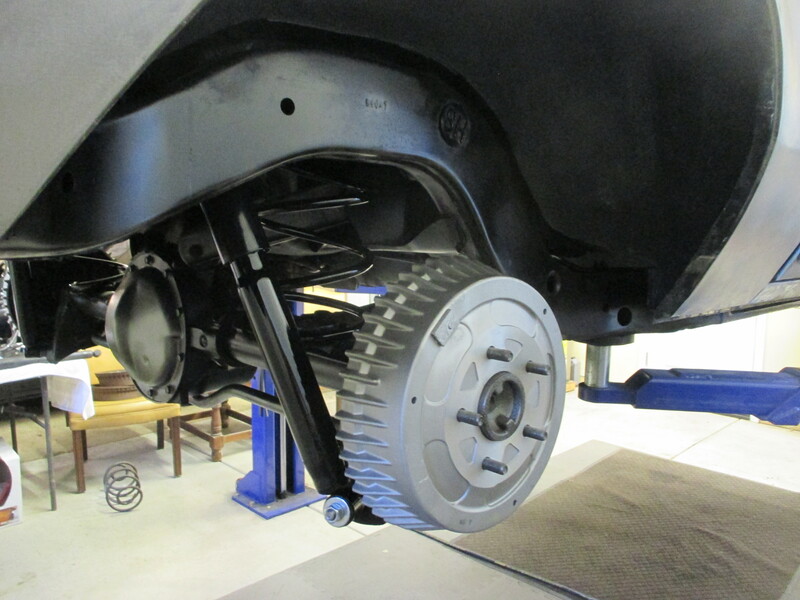 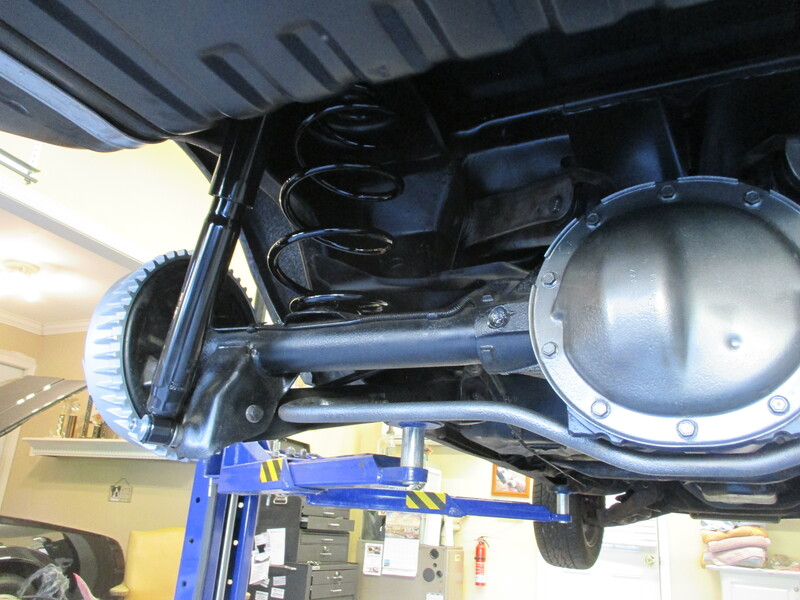 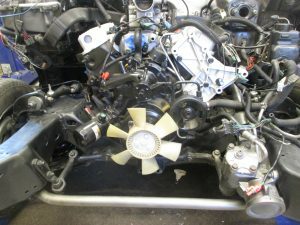 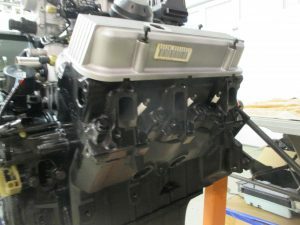 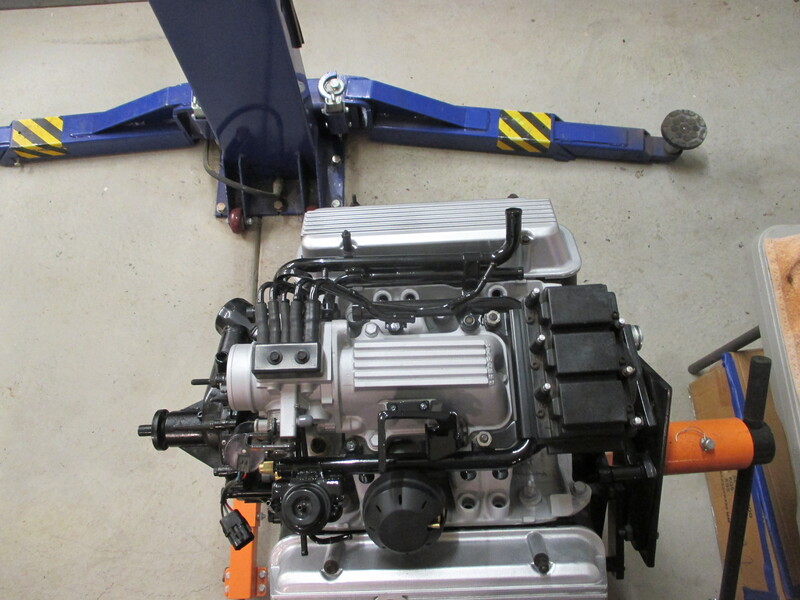 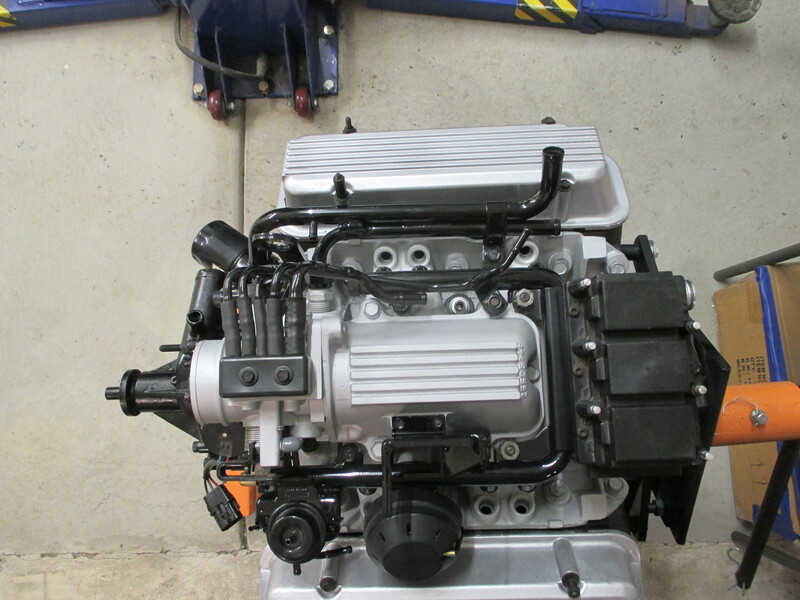 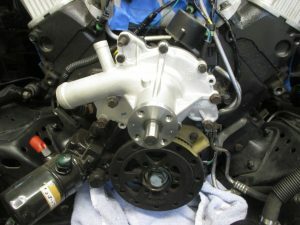 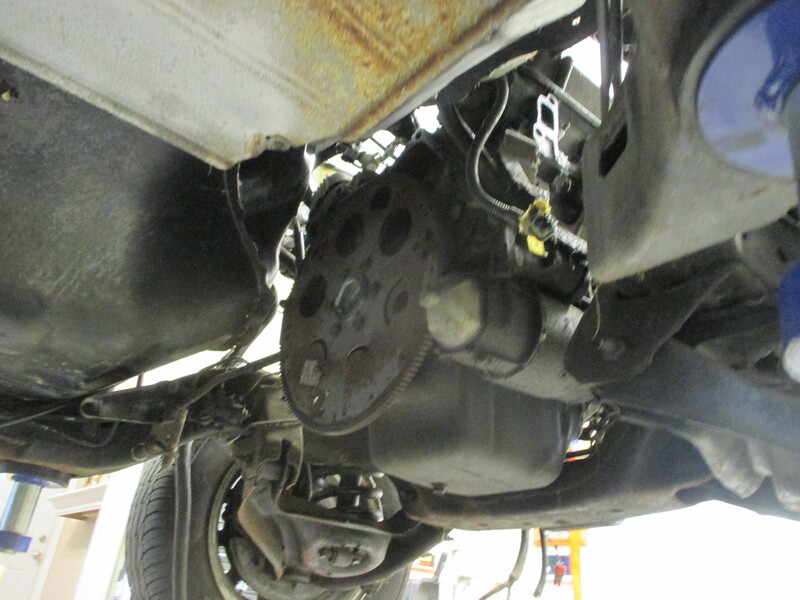 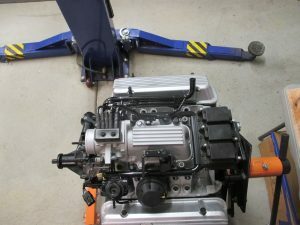 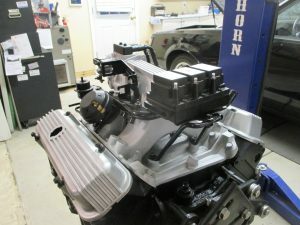 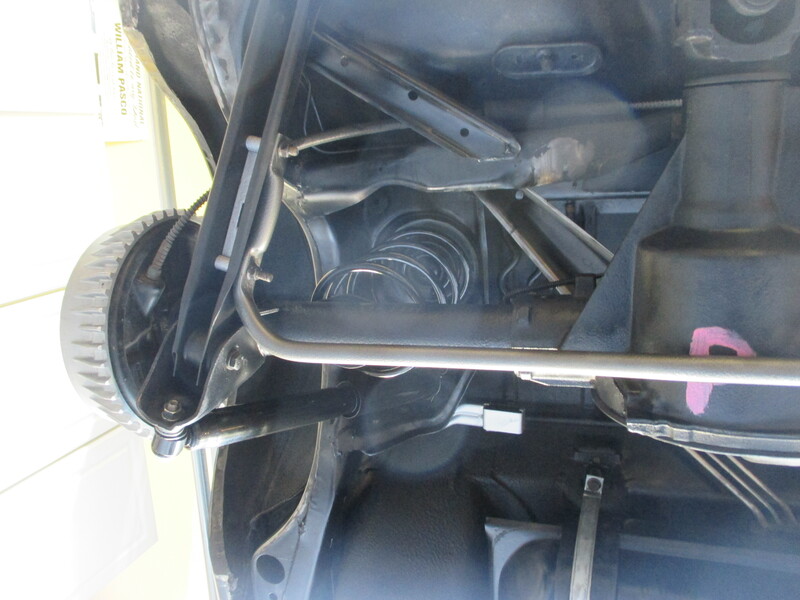 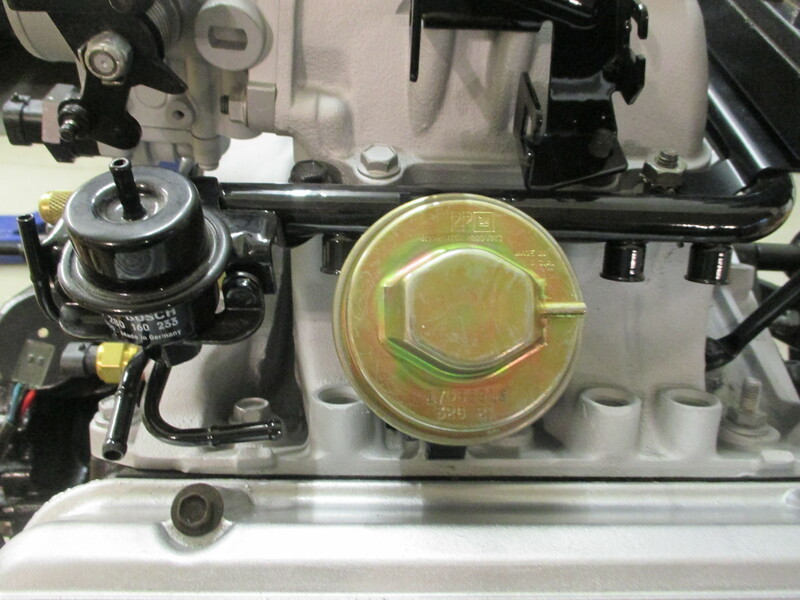 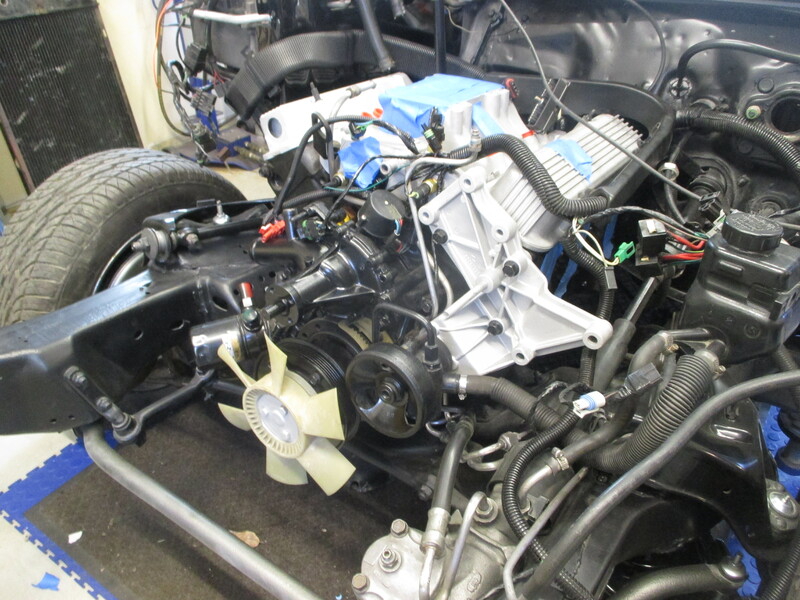 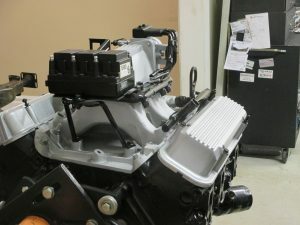 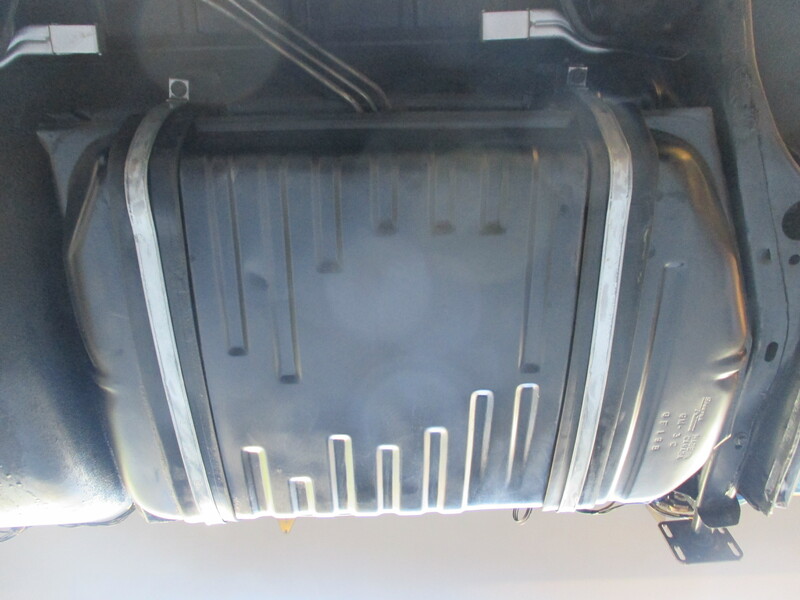 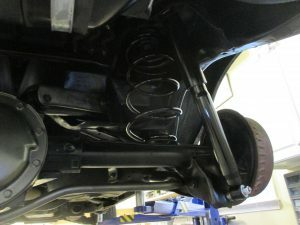 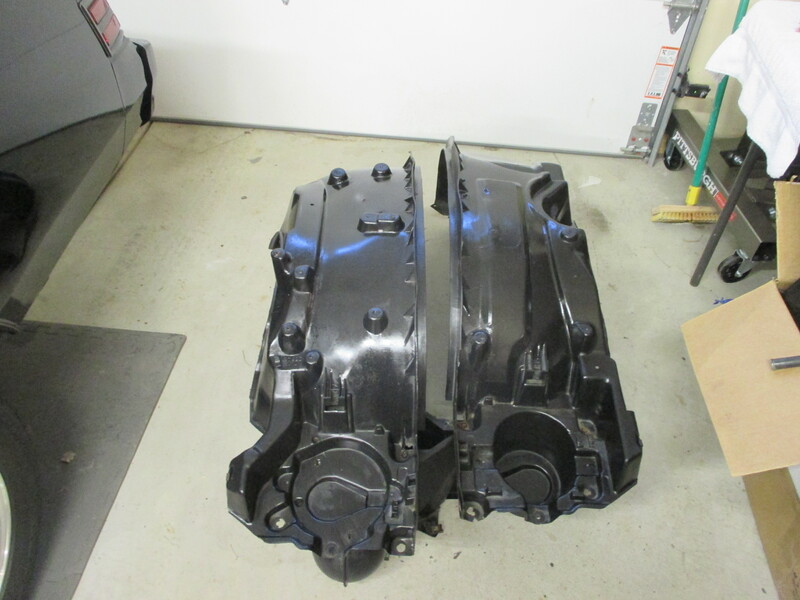 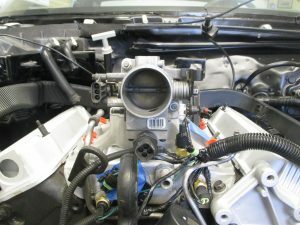 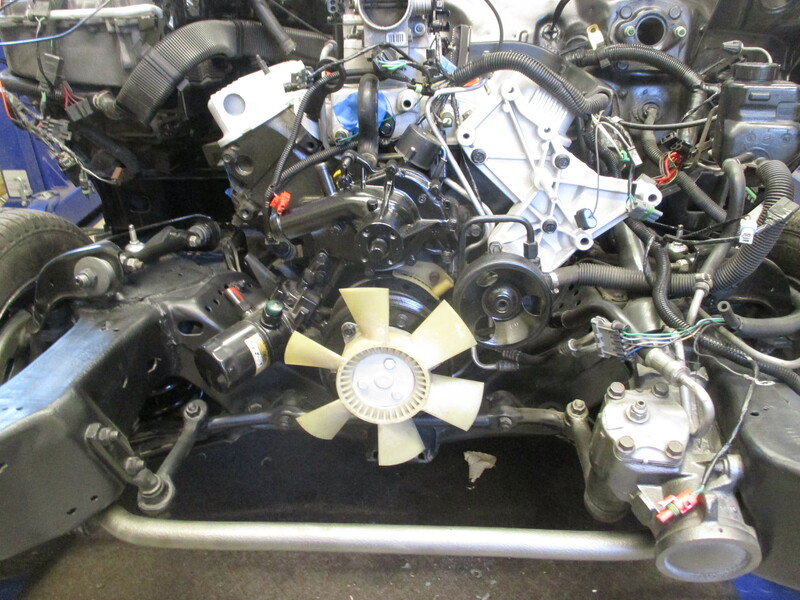 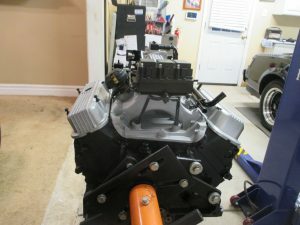 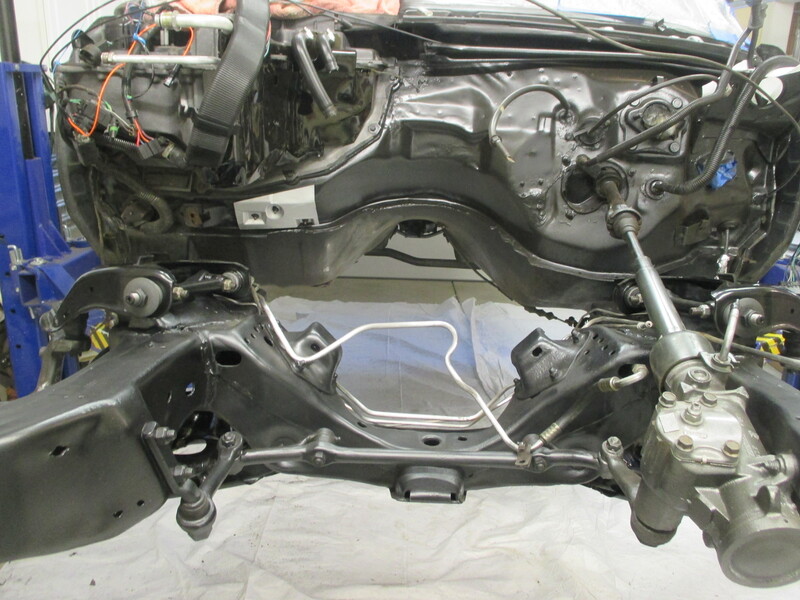 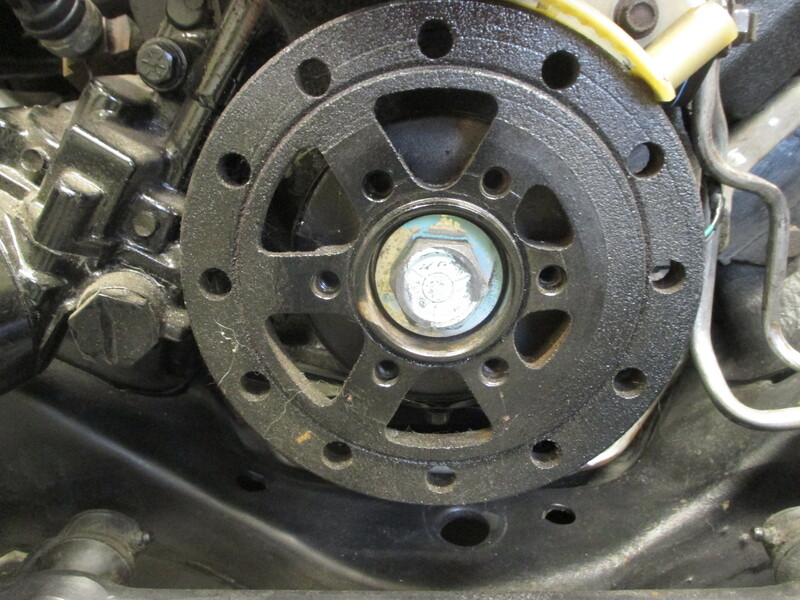 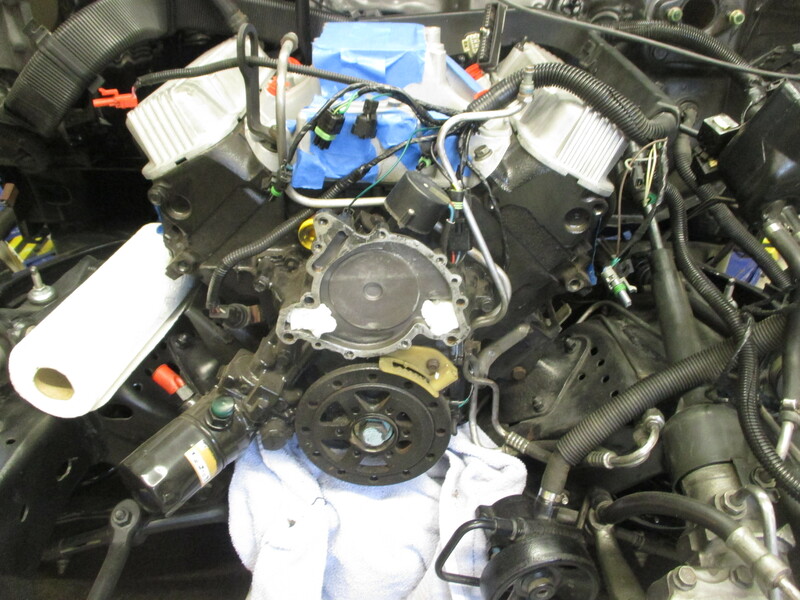 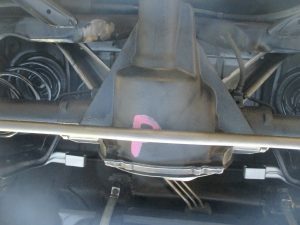 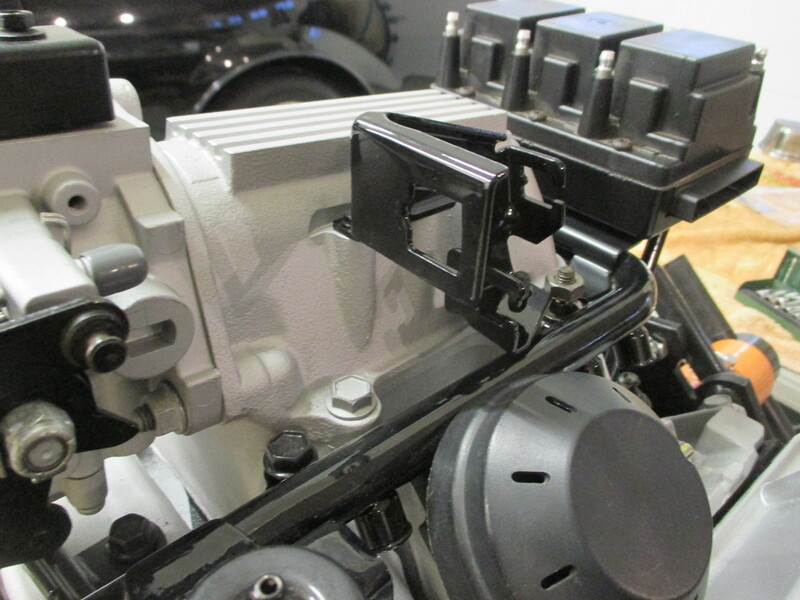 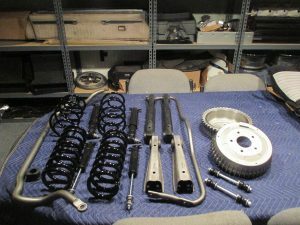 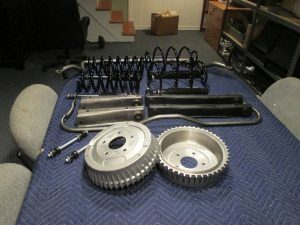 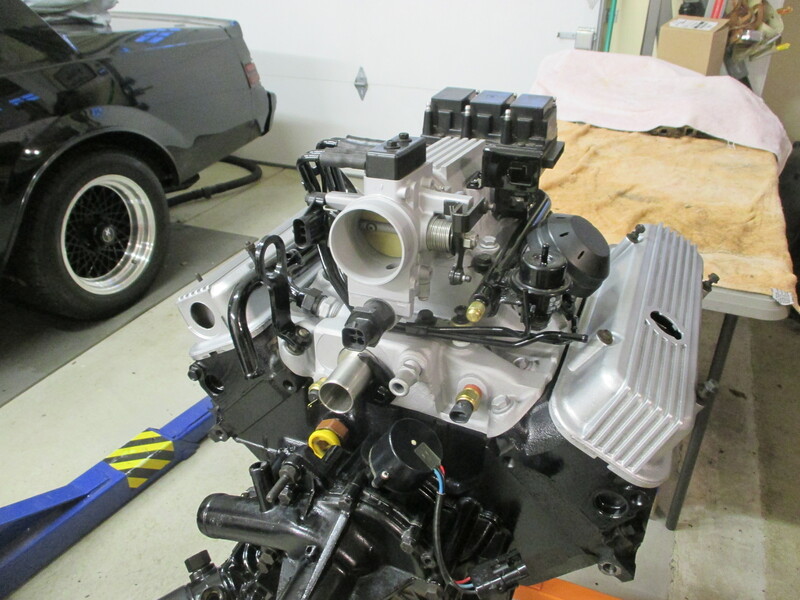 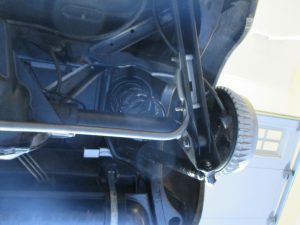 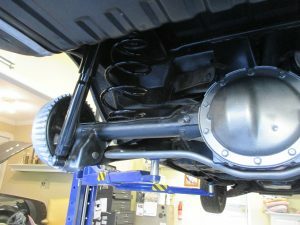 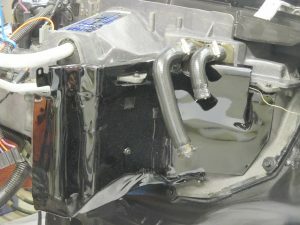 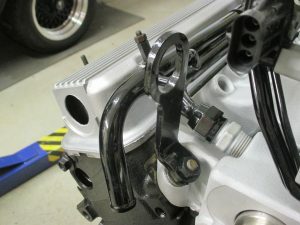 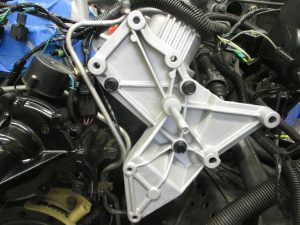 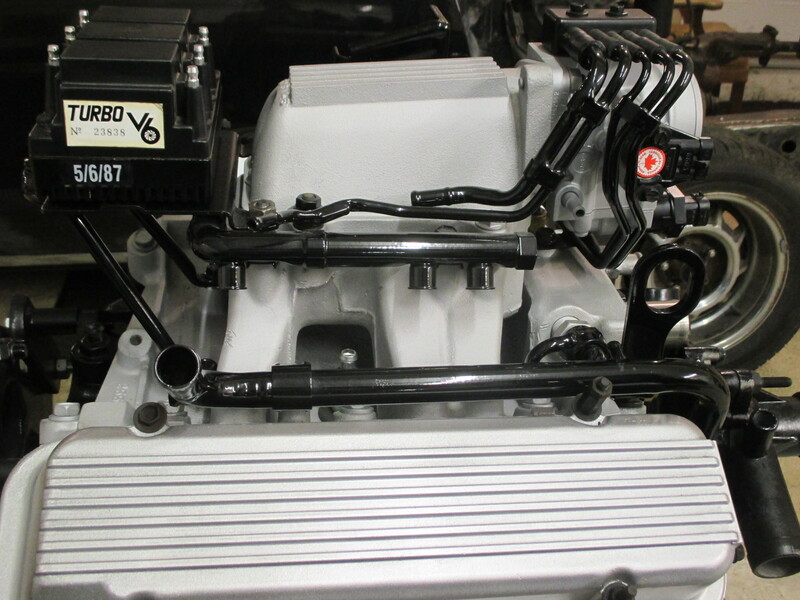 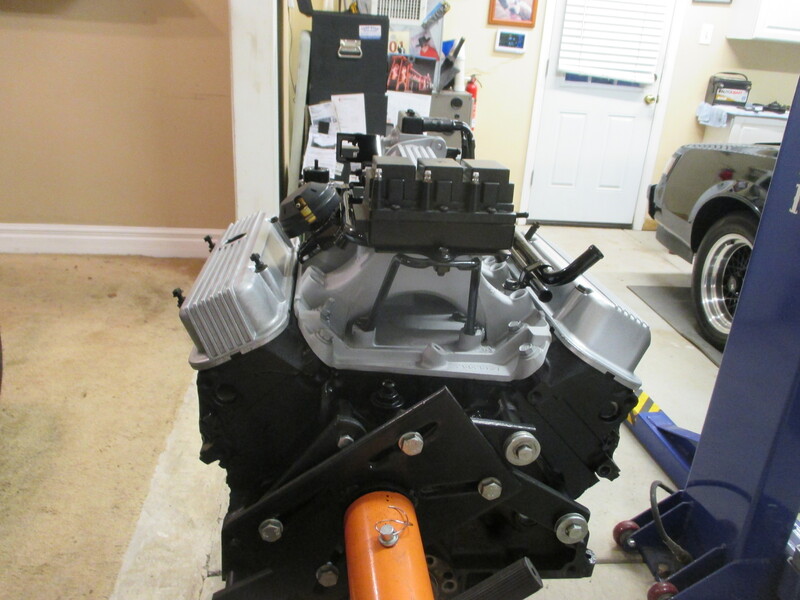 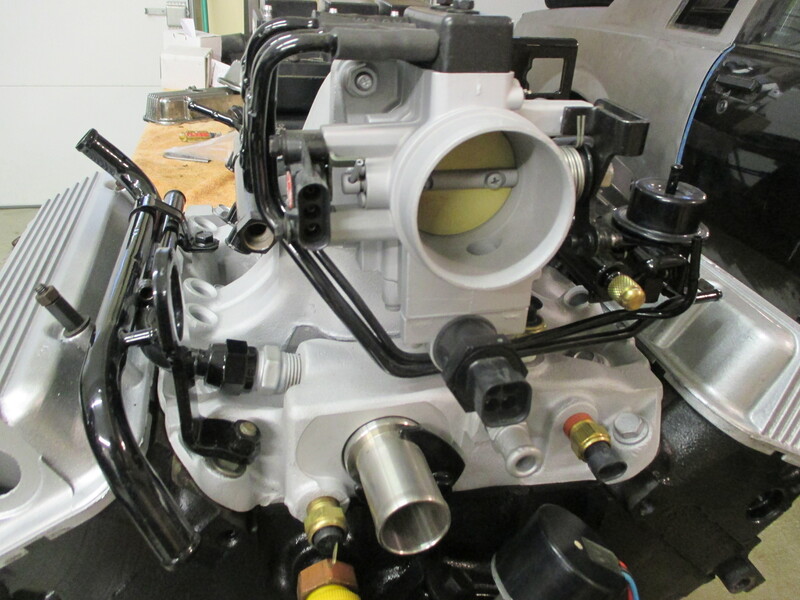 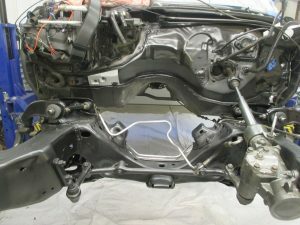 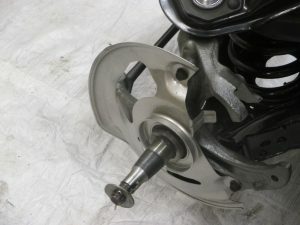 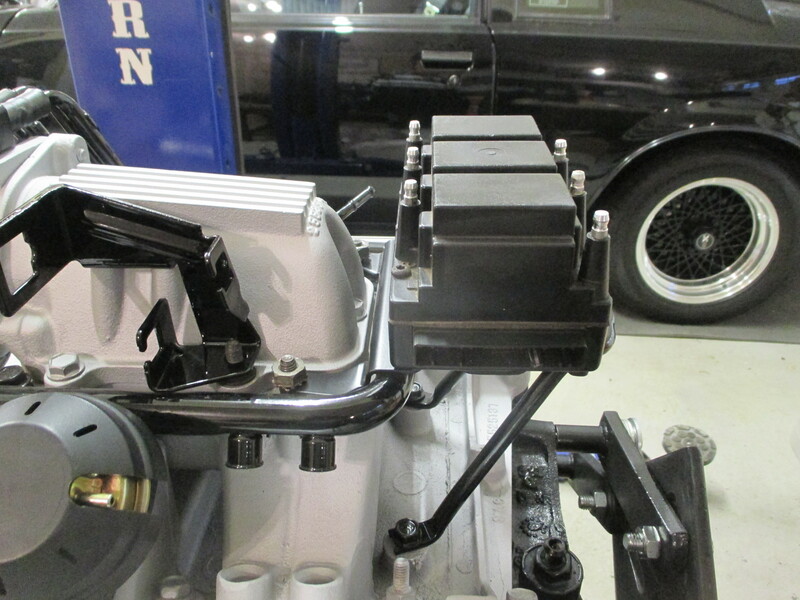 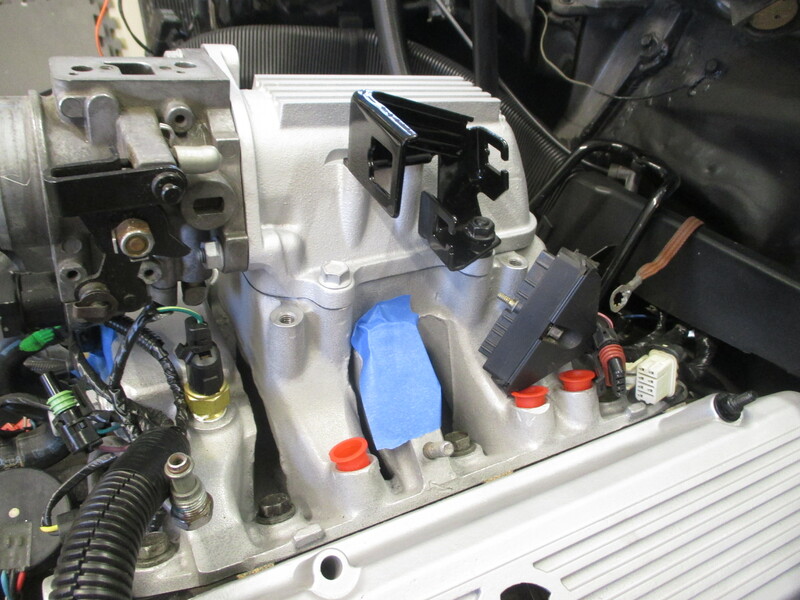 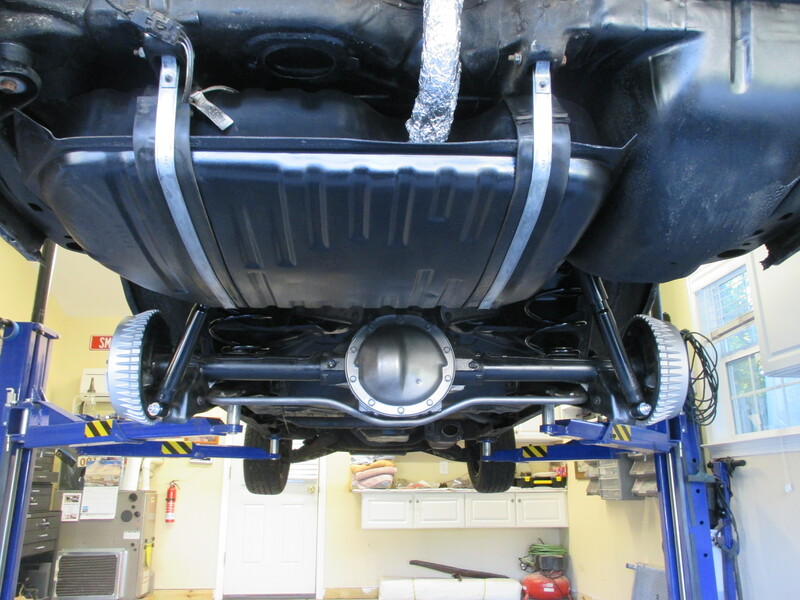 The entire power-train is installed, motor, transmission, driveshaft and rear. 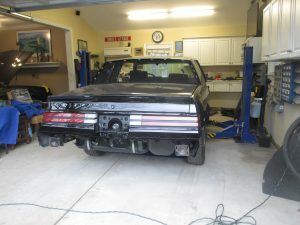 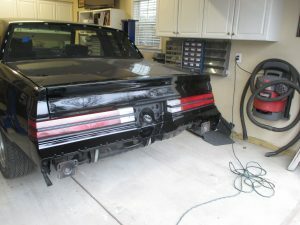 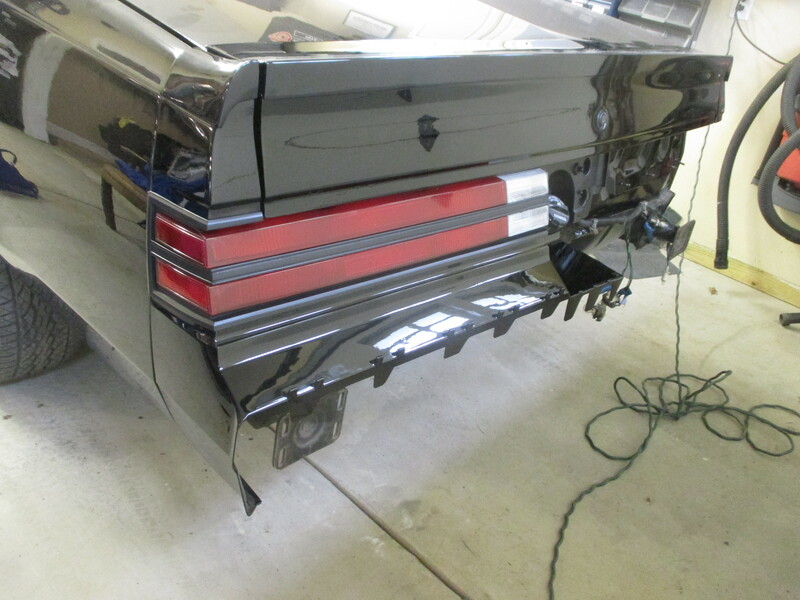 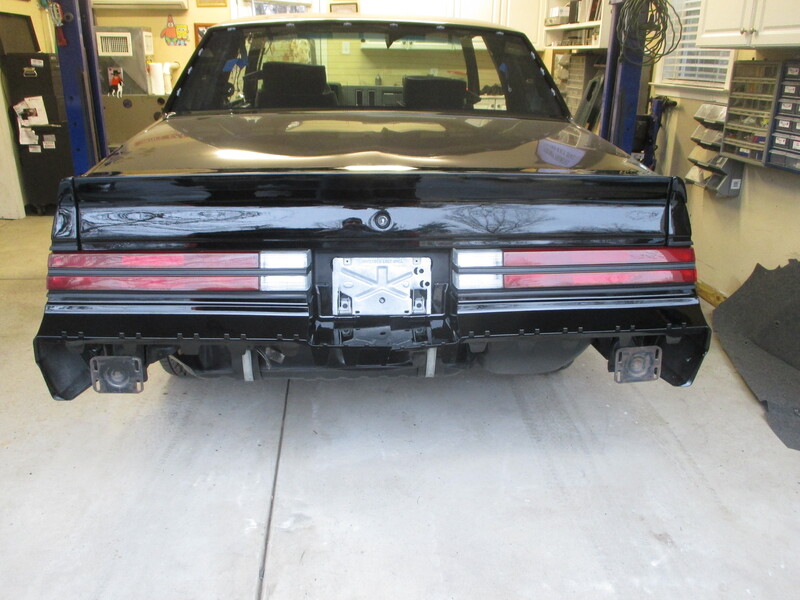 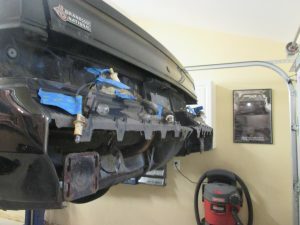 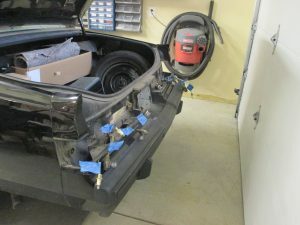 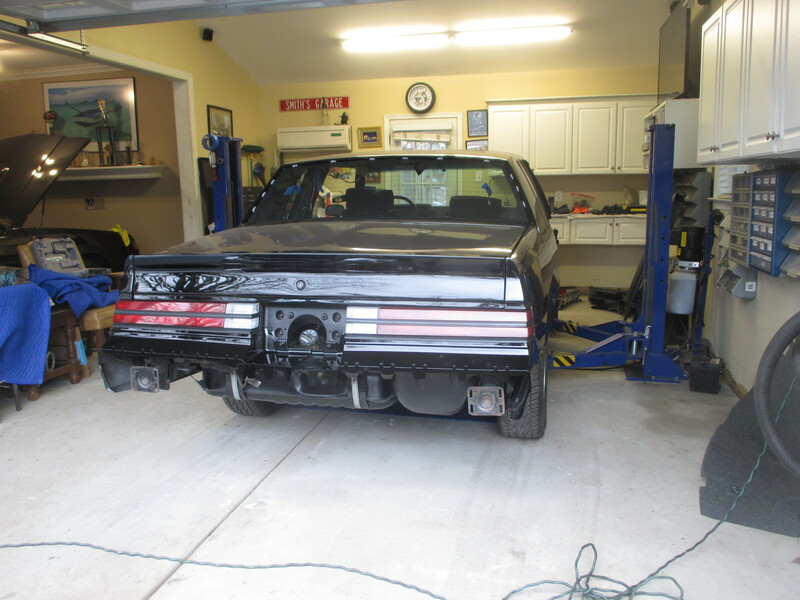 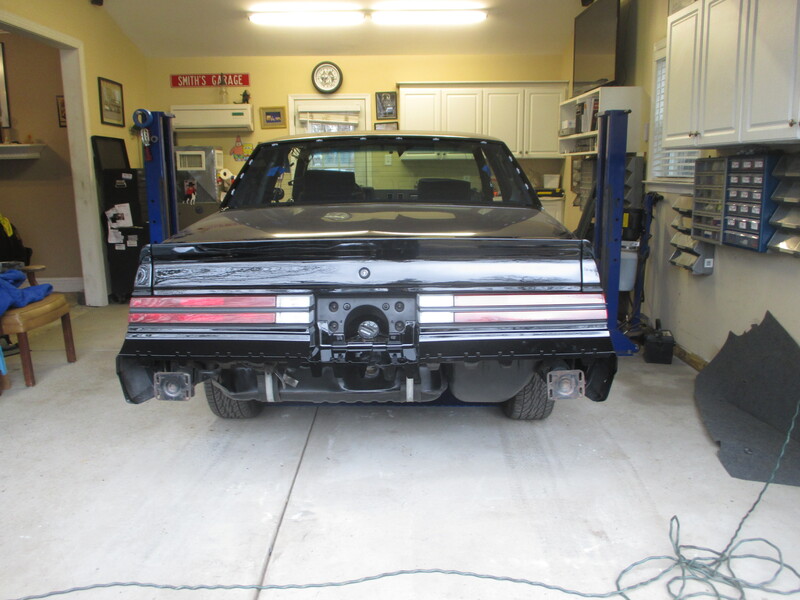 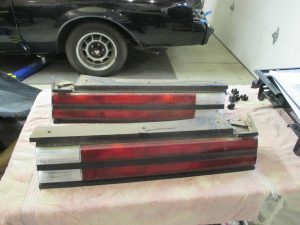 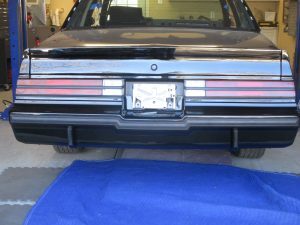 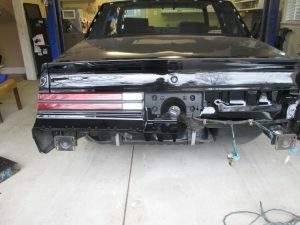 Today the we are putting the rear parts on the car, taillight, bumper fillers and bumper. 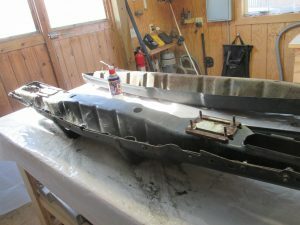 Don’t mind the old transmission pan. 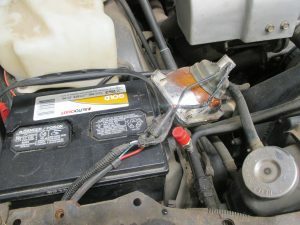 That stays on until the final fluid change. 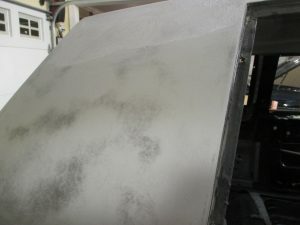 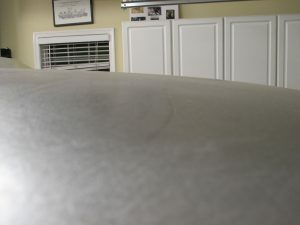 Then we replace it with a fully restored original pan. 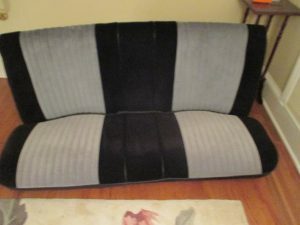 This is another wonderful find from the Great State of New York. 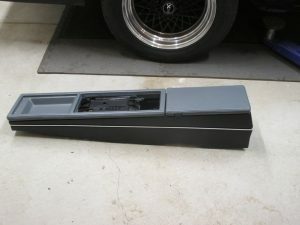 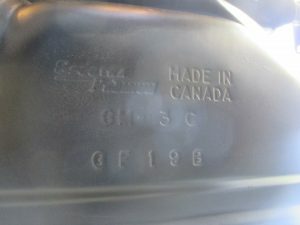 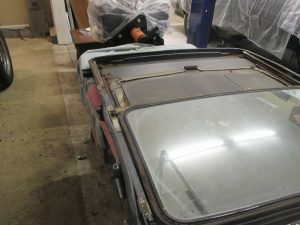 This is a true 8000 original mile factory CF5 sunroof car. 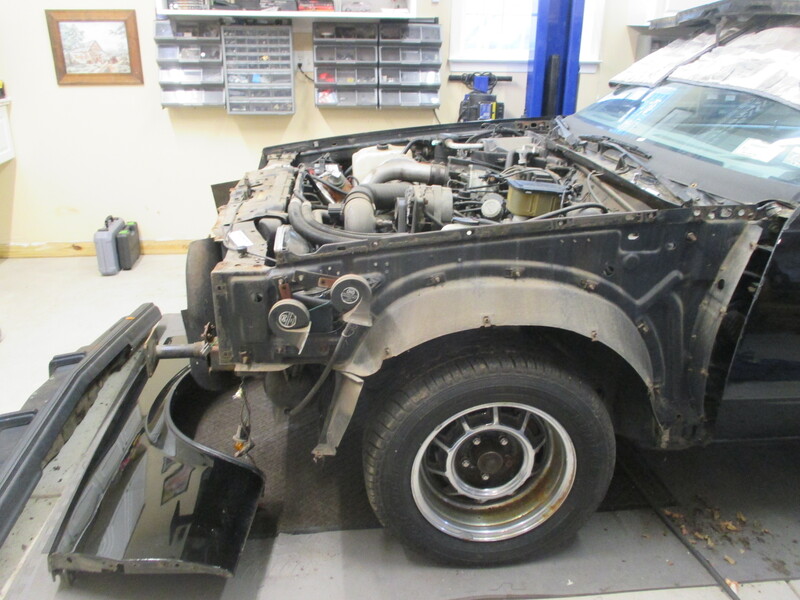 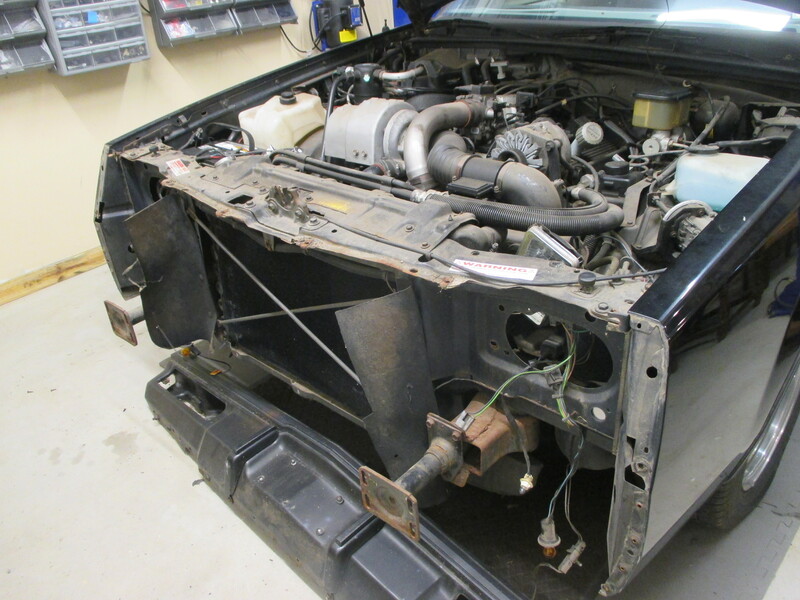 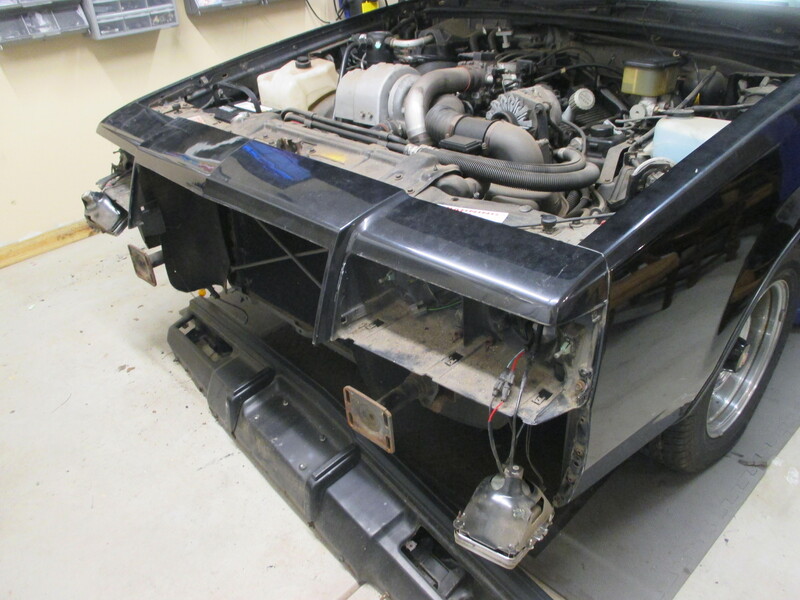 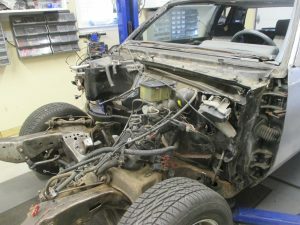 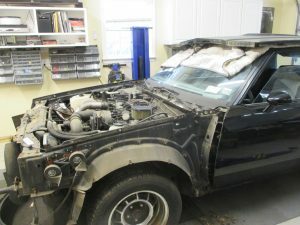 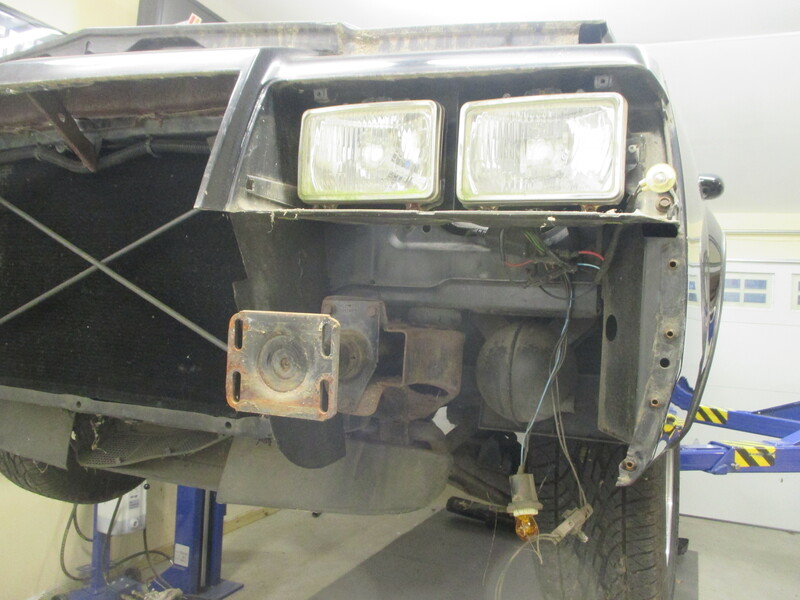 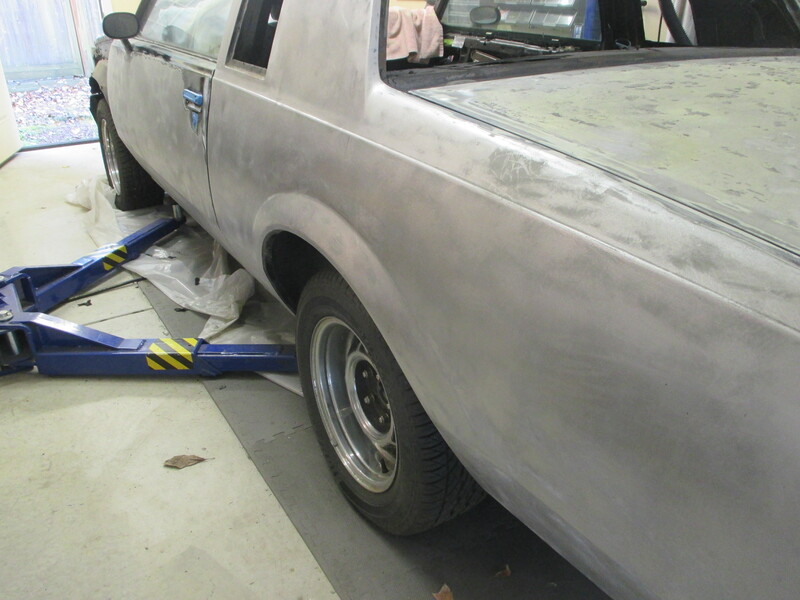 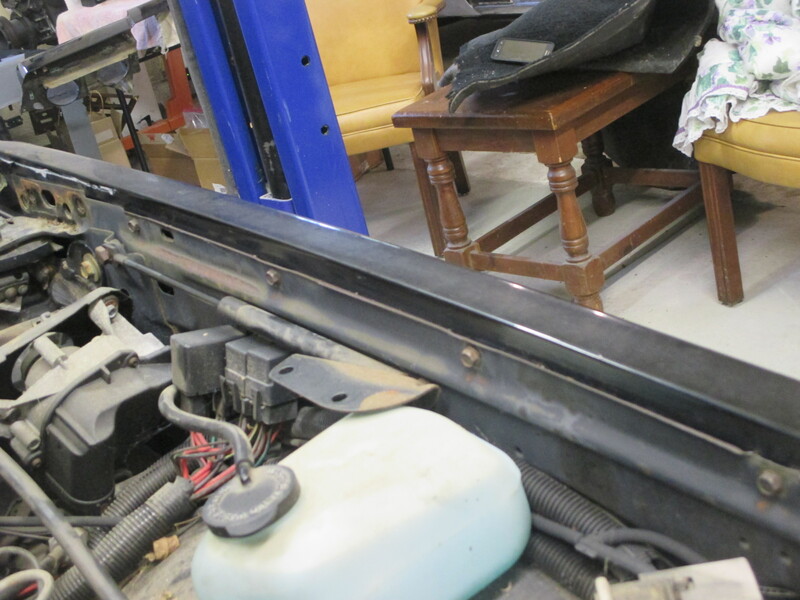 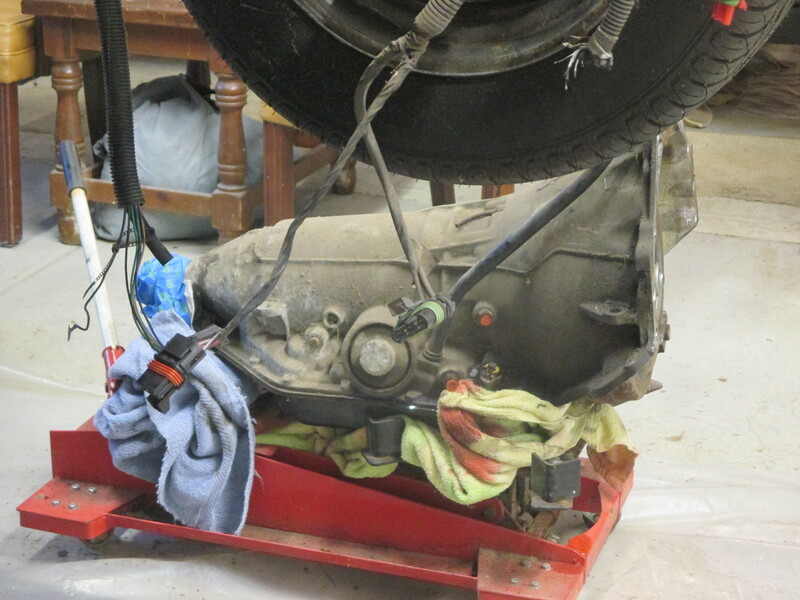 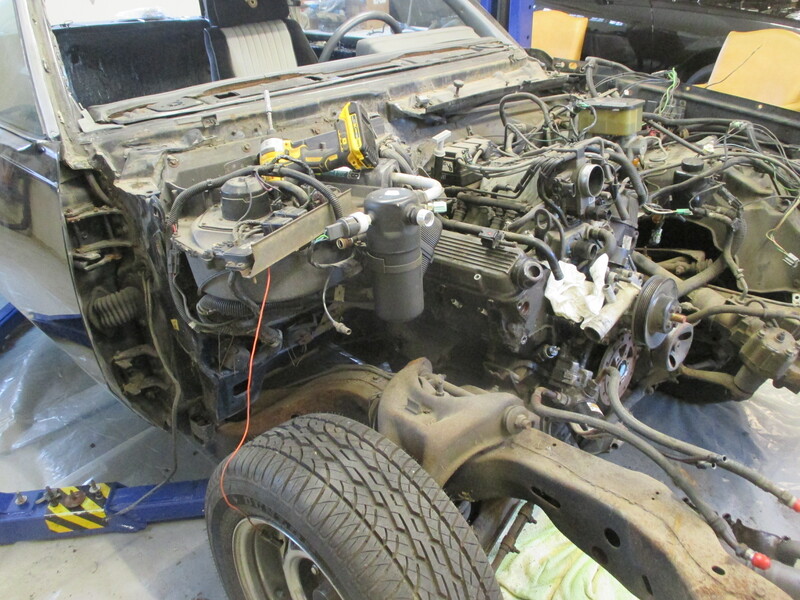 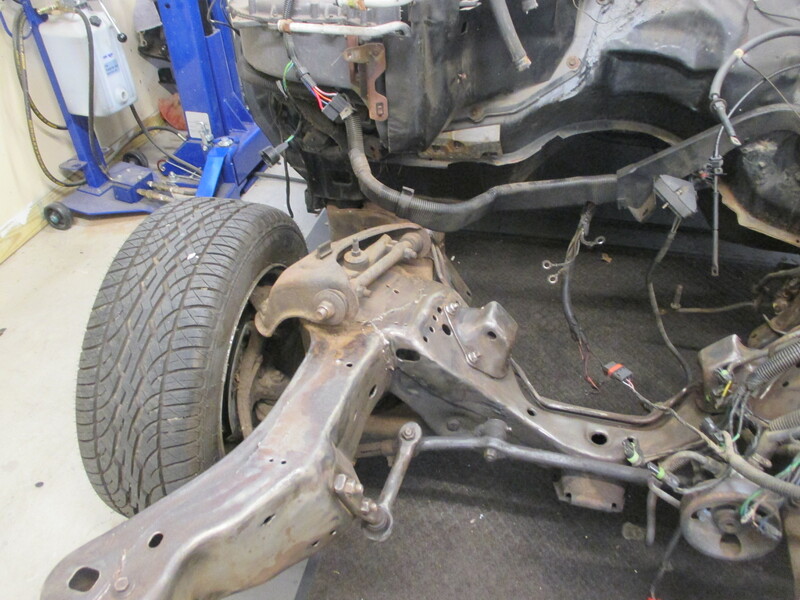 This low mileage car is a real diamond in the ruff, which is going to receive a complete frame-off restoration. 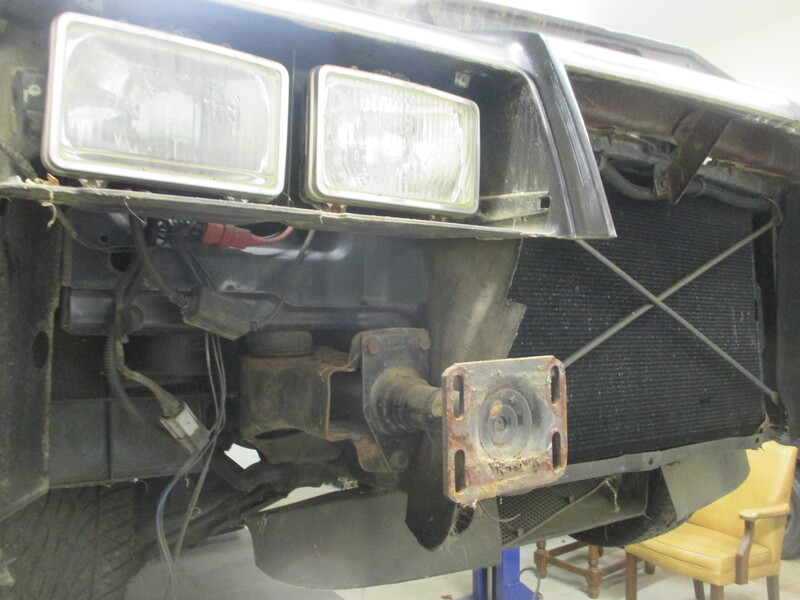 Very little is know about this car thus far so we are working on a complete history to tell the story of this rare vehicle as it gets a new lease on life back to showroom new. 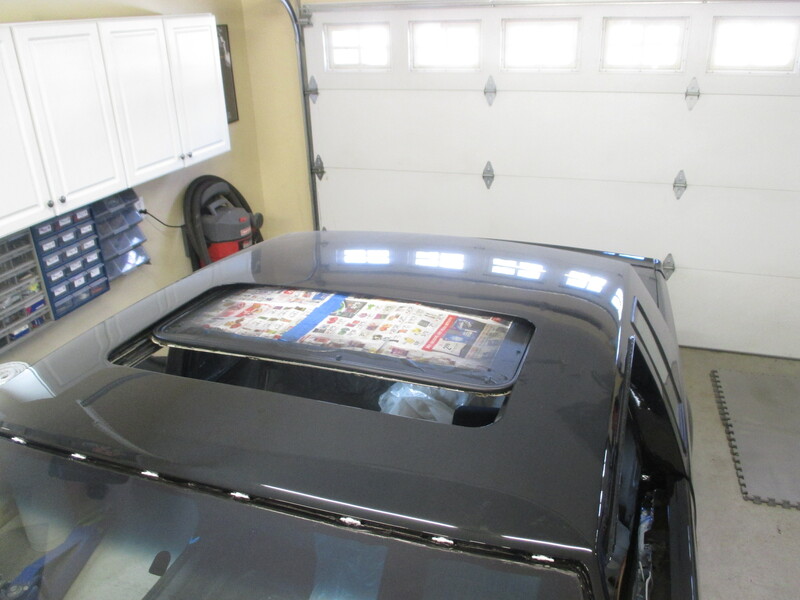 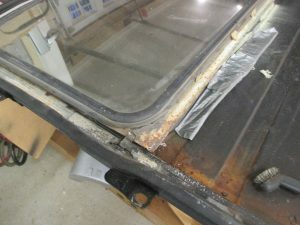 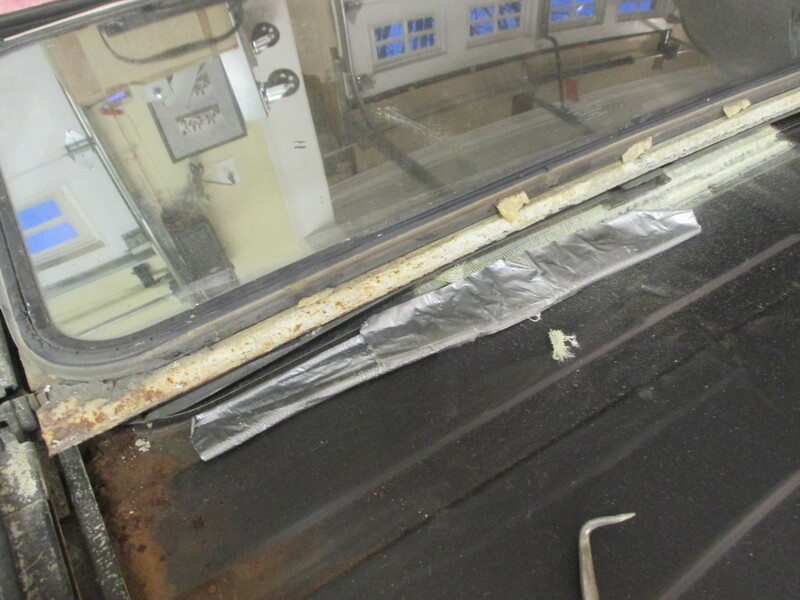 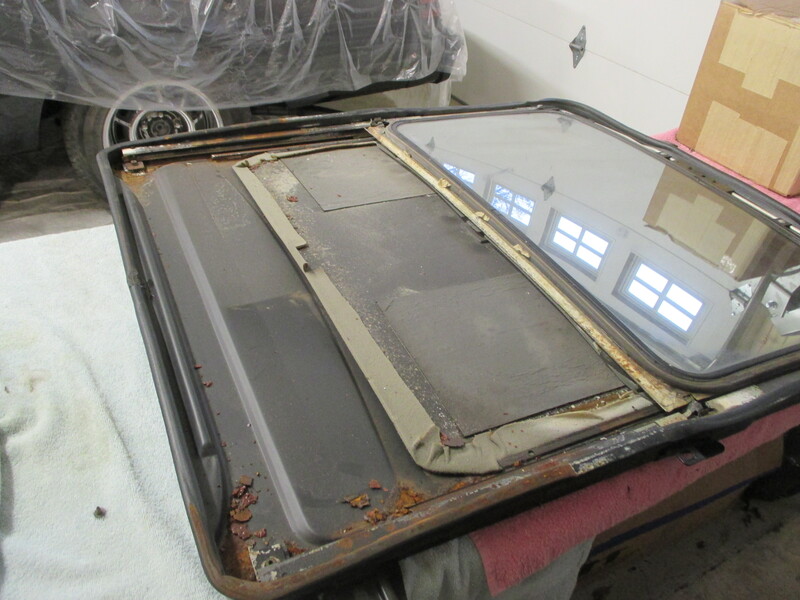 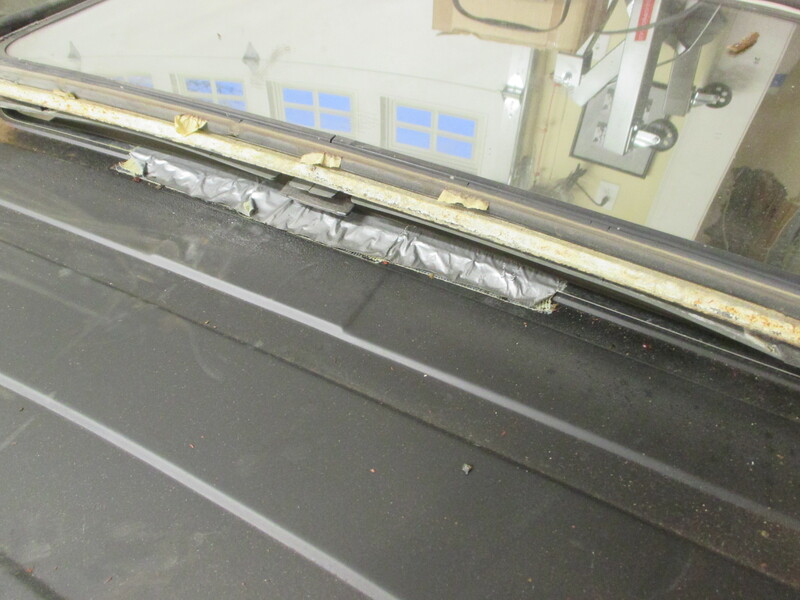 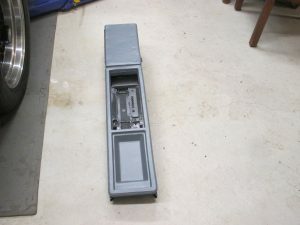 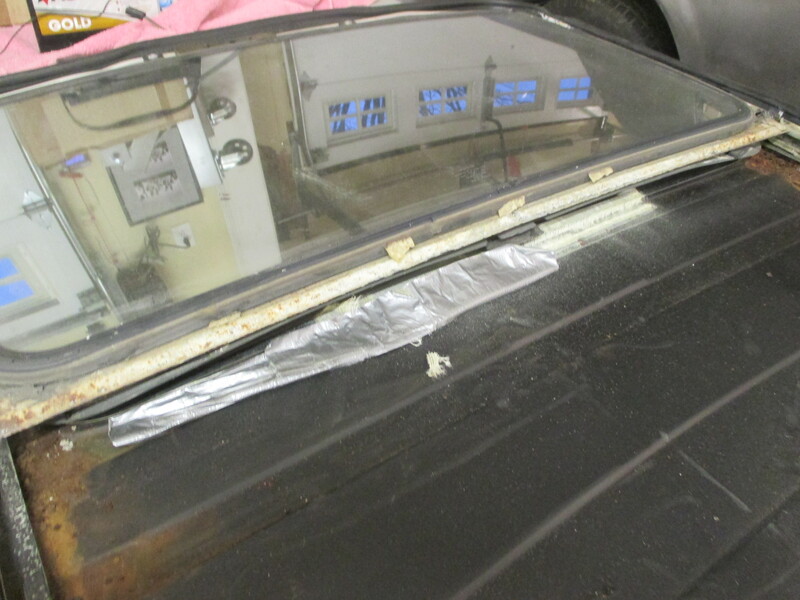 Sunroof assembly is in rough shape. 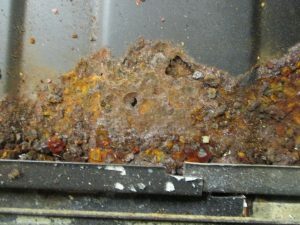 A drain tube was clogged and a lot of water sat in the assembly. 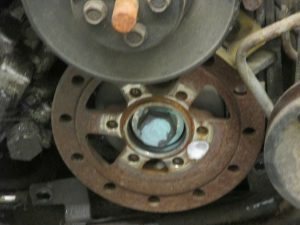 The track are rusty and somewhat corroded. This may be beyond repair. 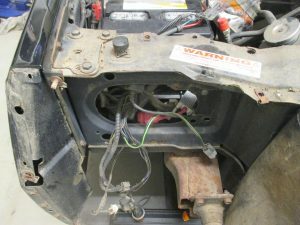 When its being held together with duct tape we may have to find another one. 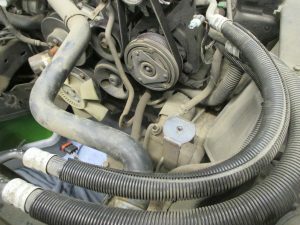 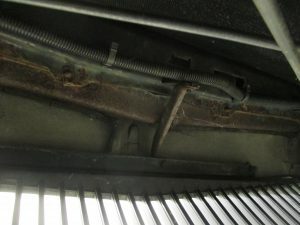 Sunroof drain hoses as you can see the front driver’s side is clear but the front passenger’s side was crushed inside the door hinge and created a water back-up into the assembly. 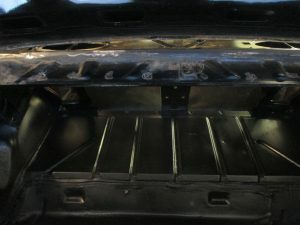 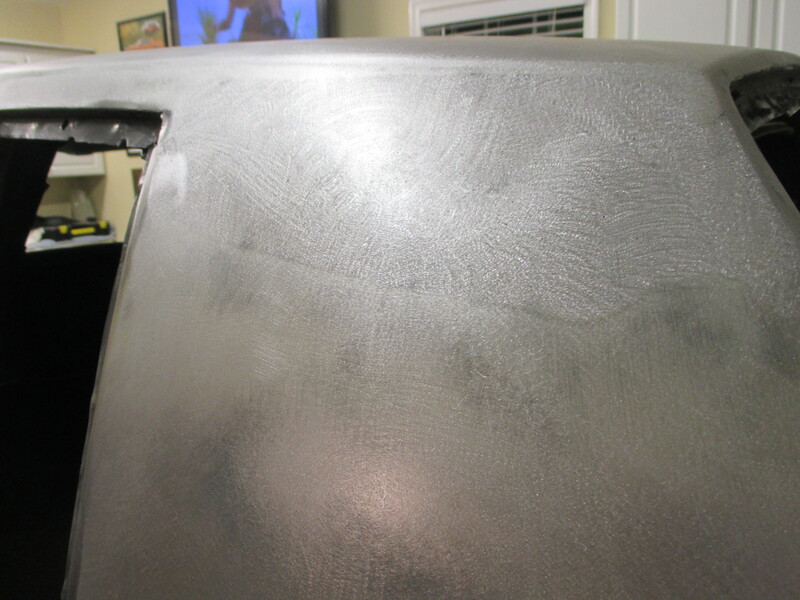 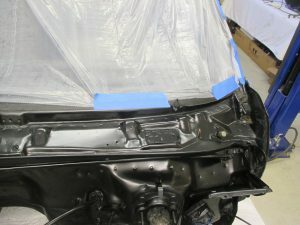 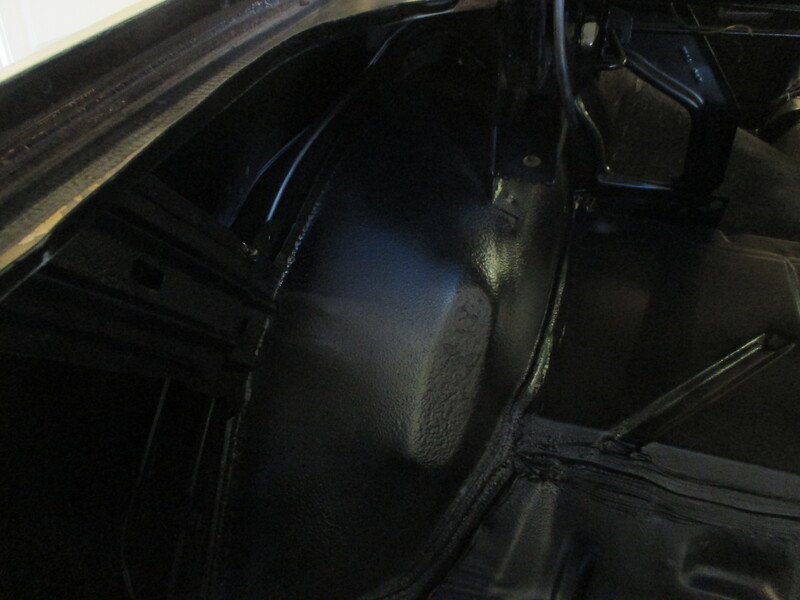 Trunk has been stripped, sealed and painted. 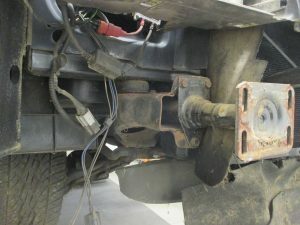 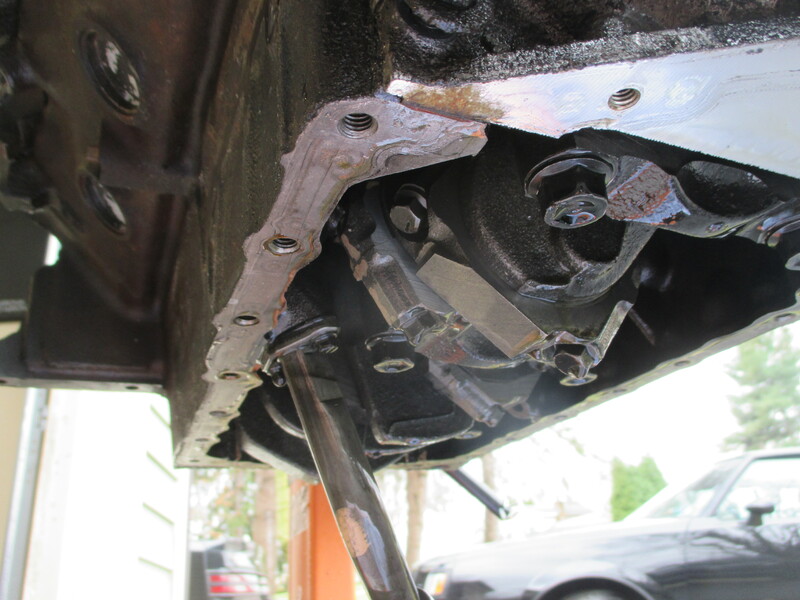 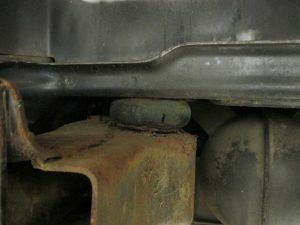 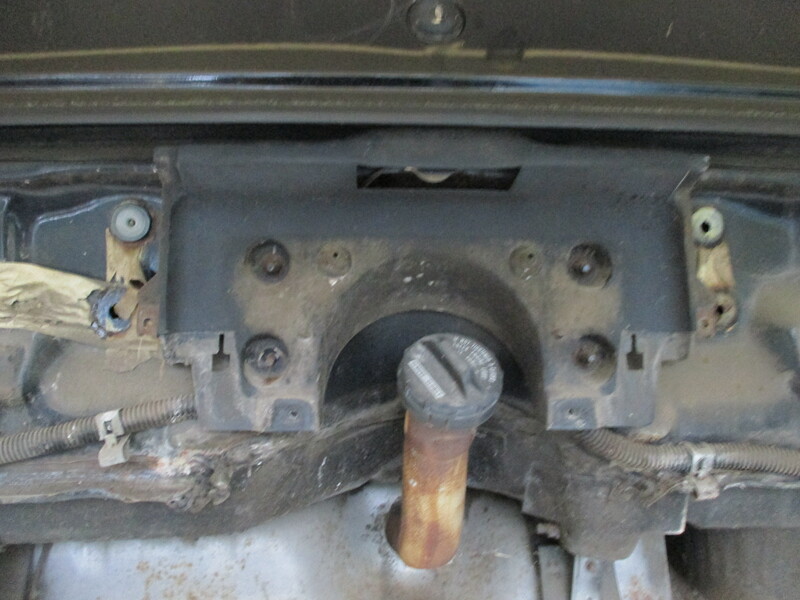 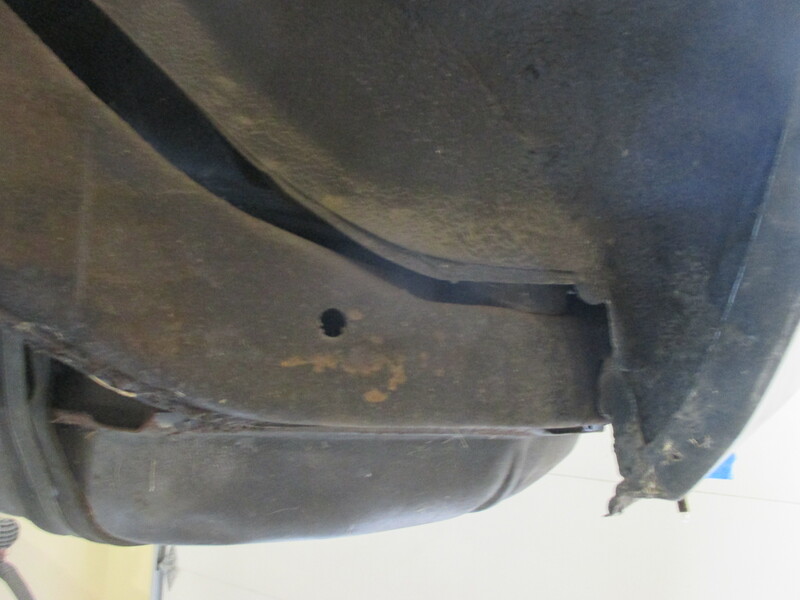 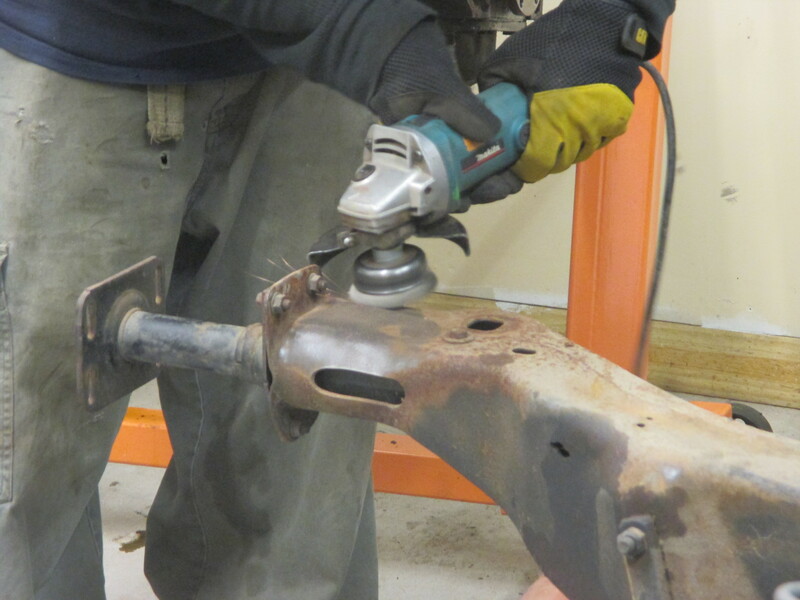 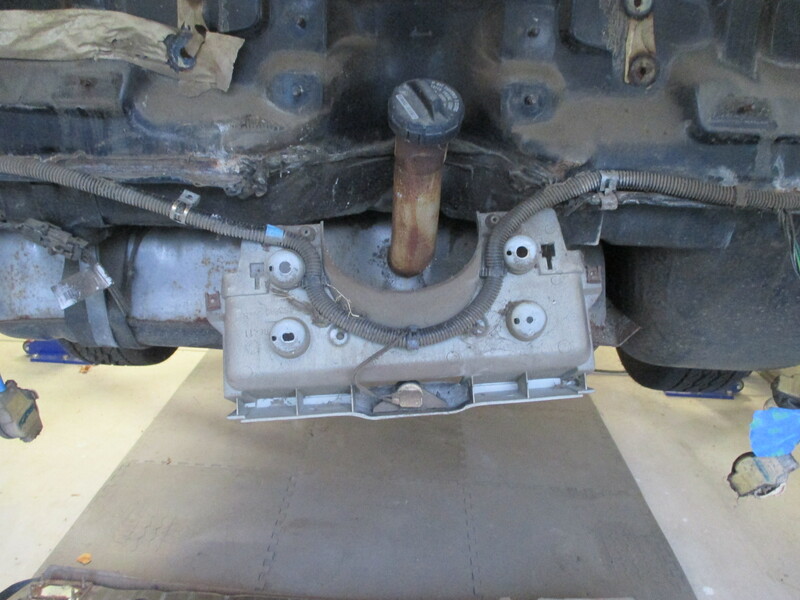 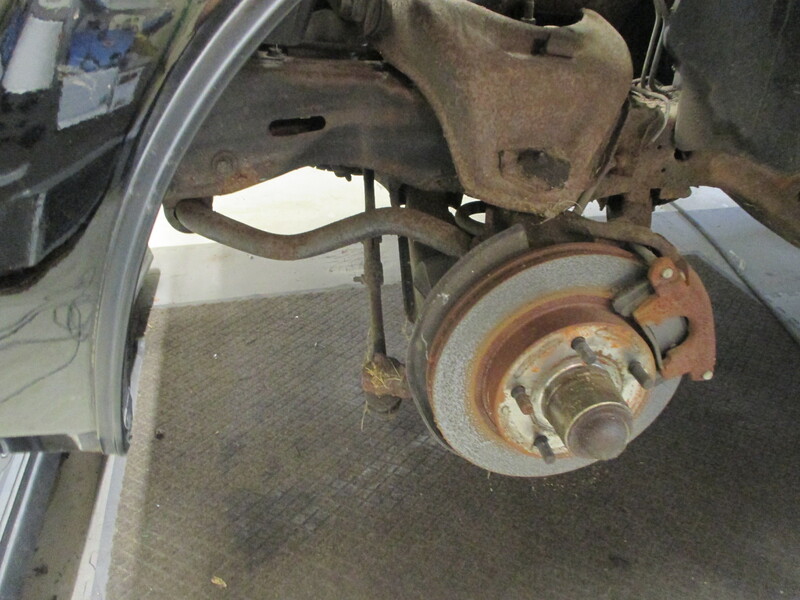 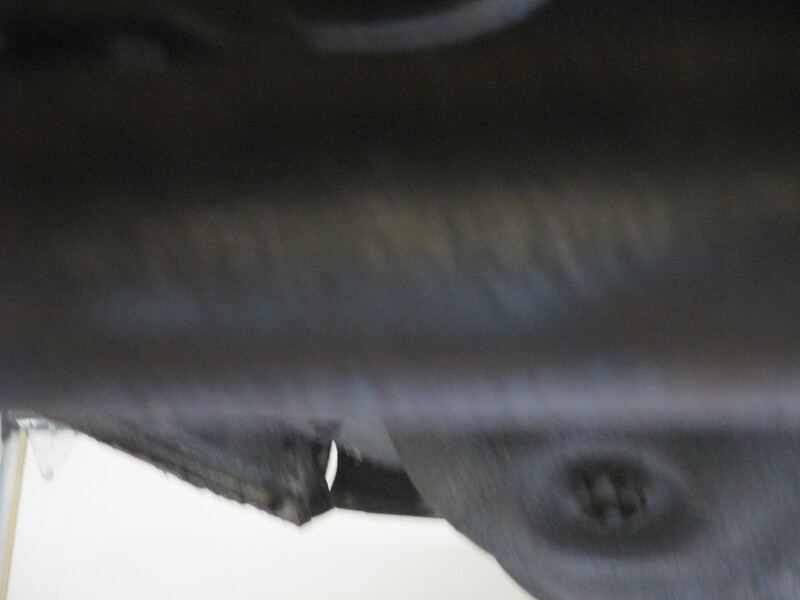 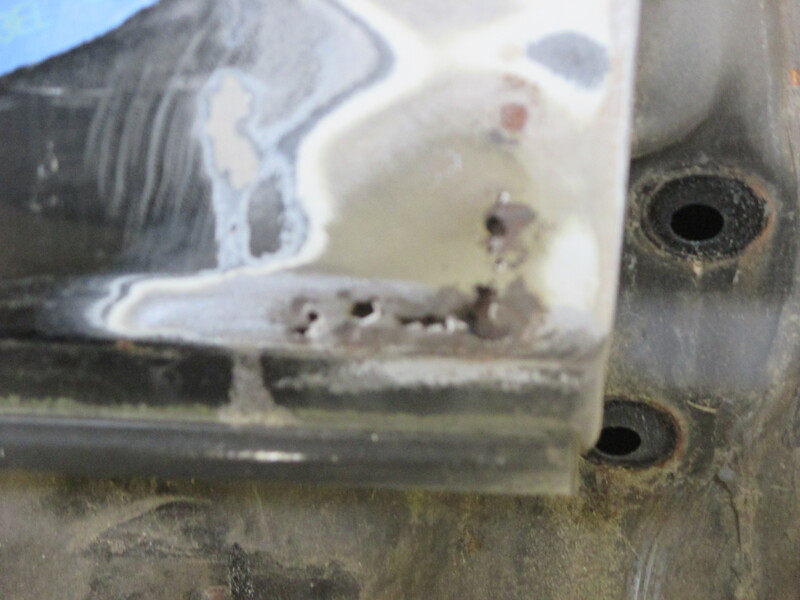 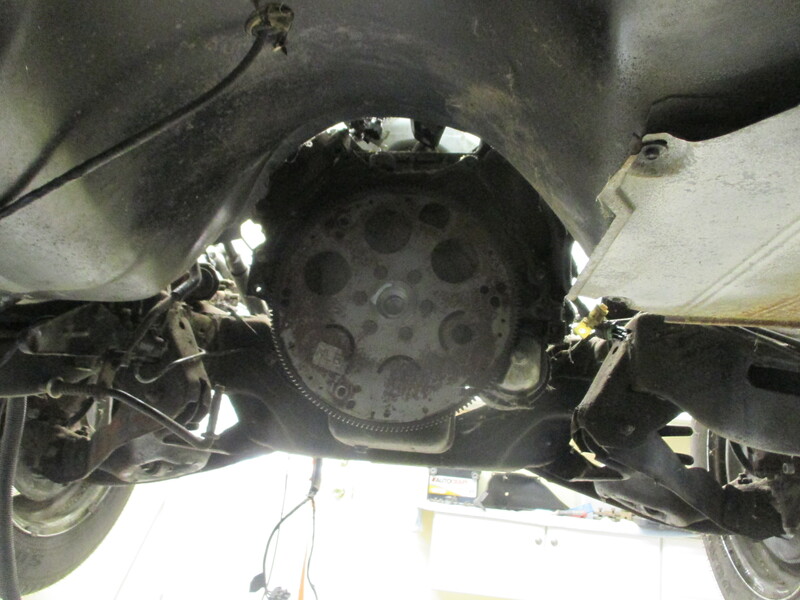 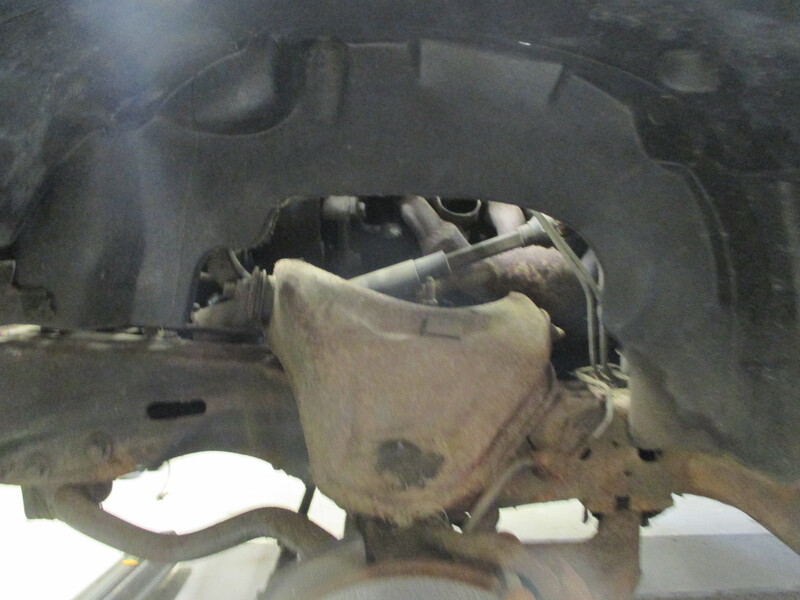 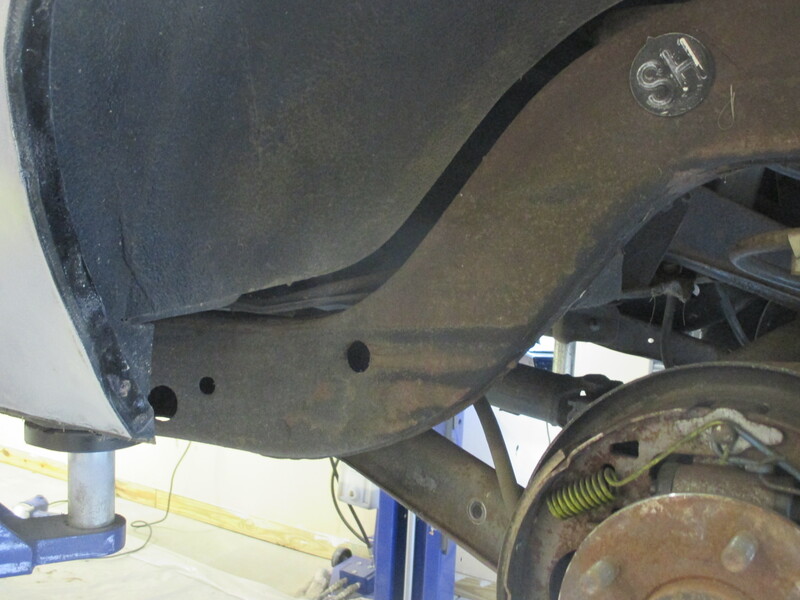 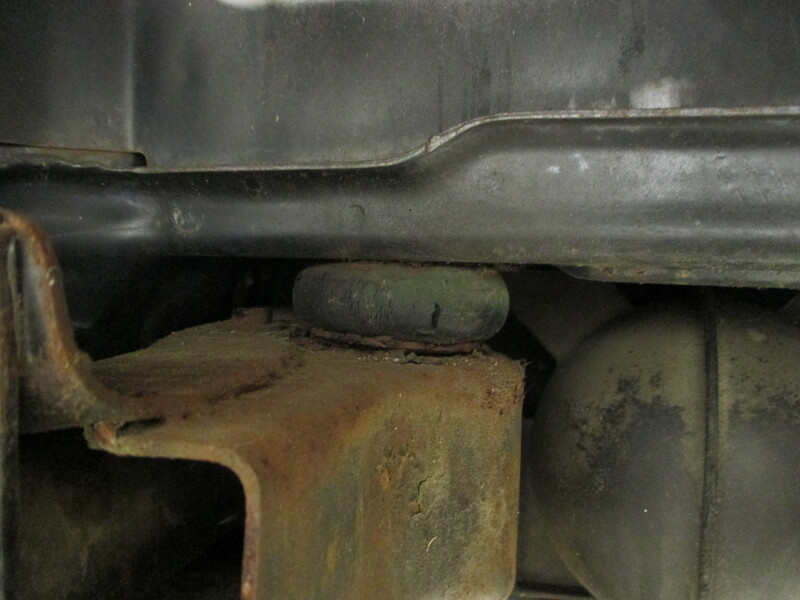 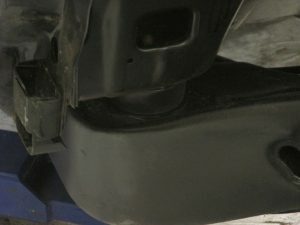 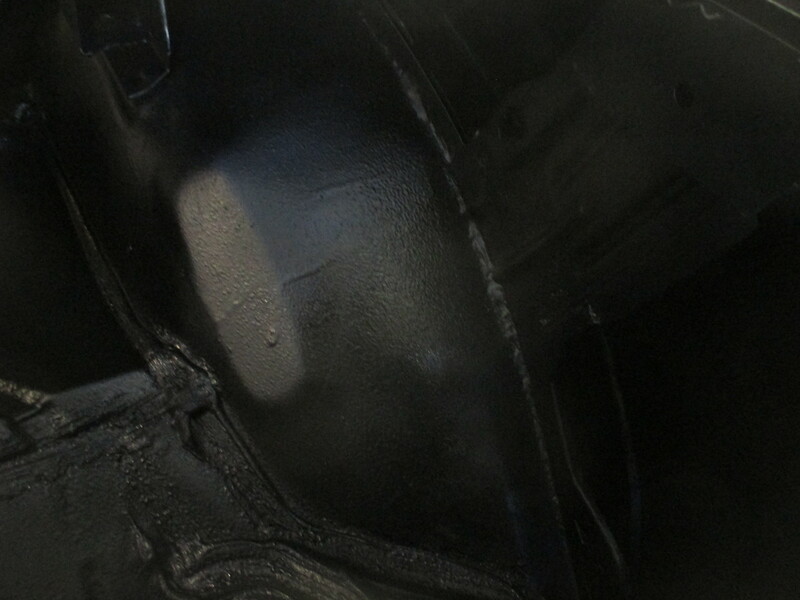 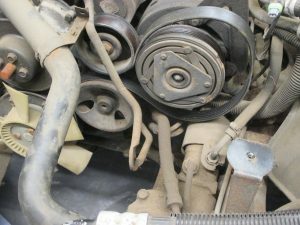 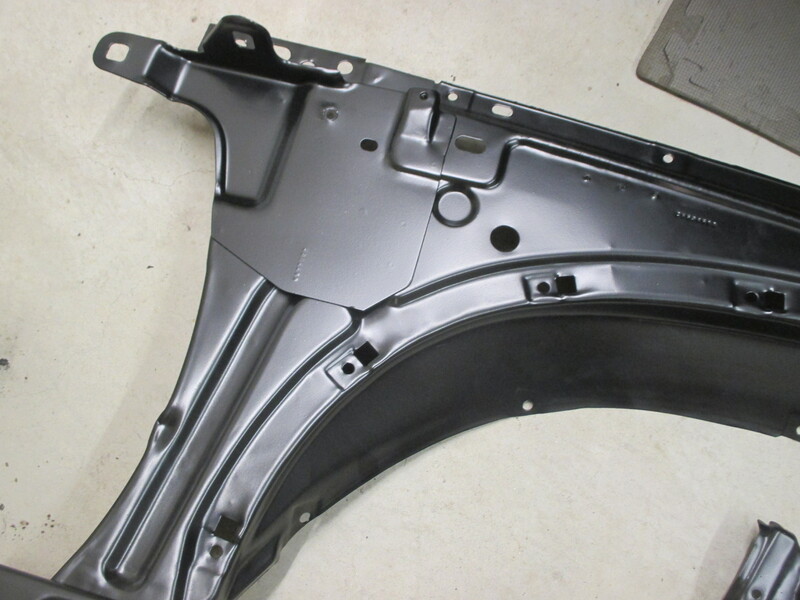 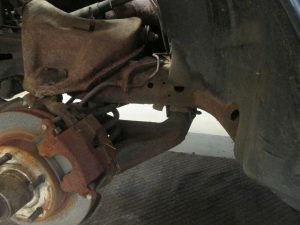 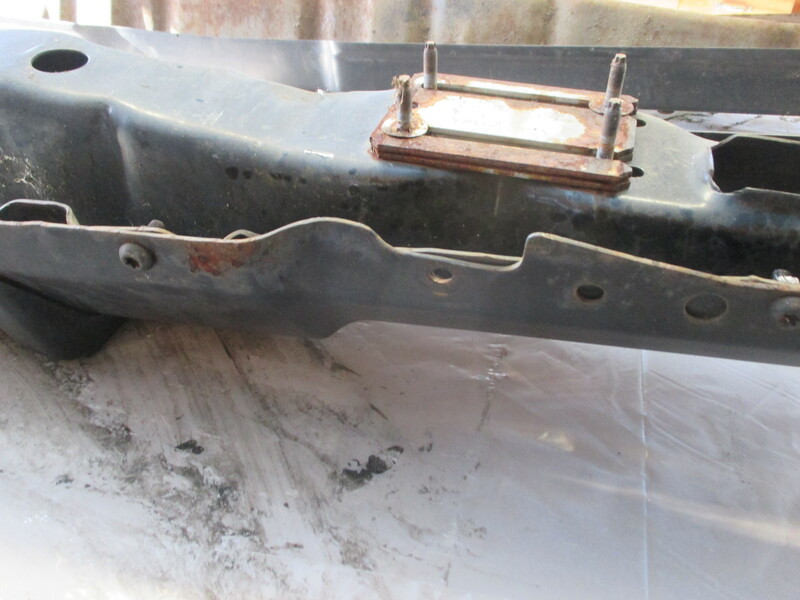 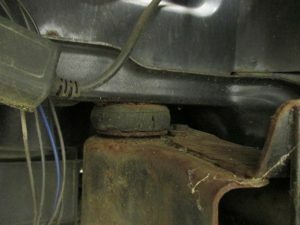 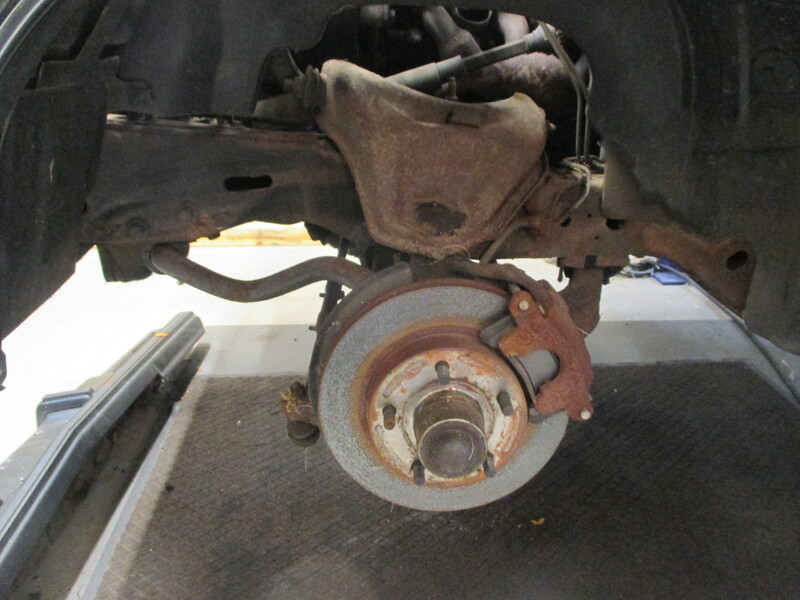 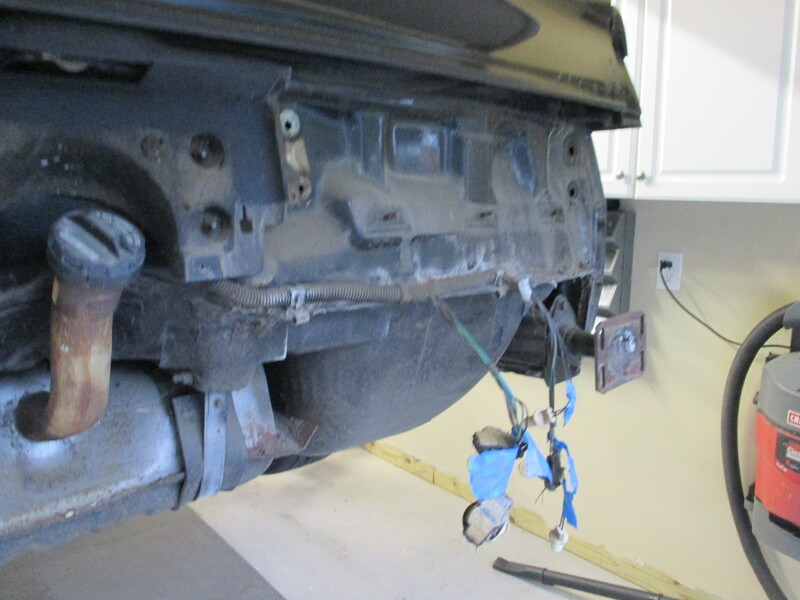 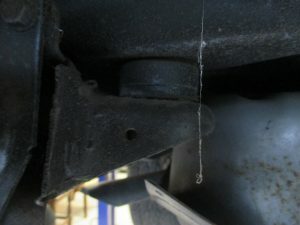 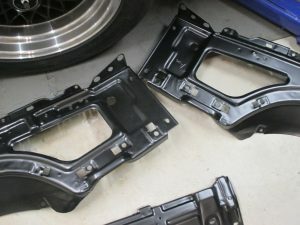 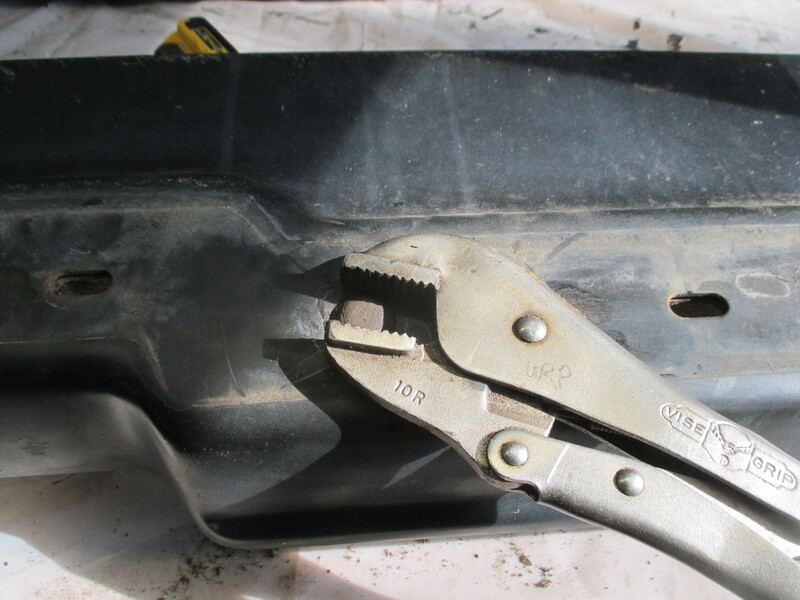 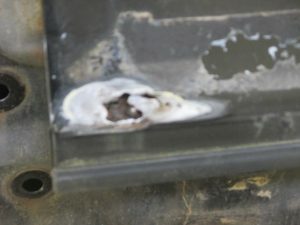 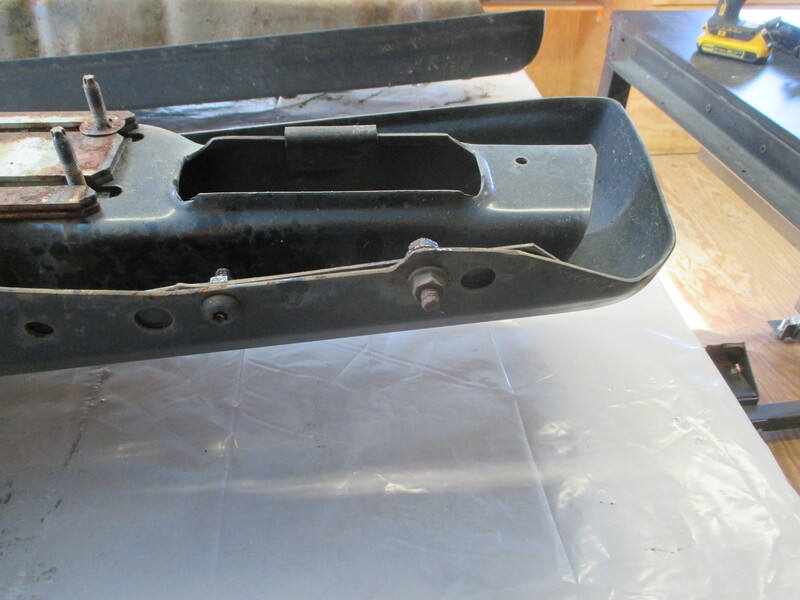 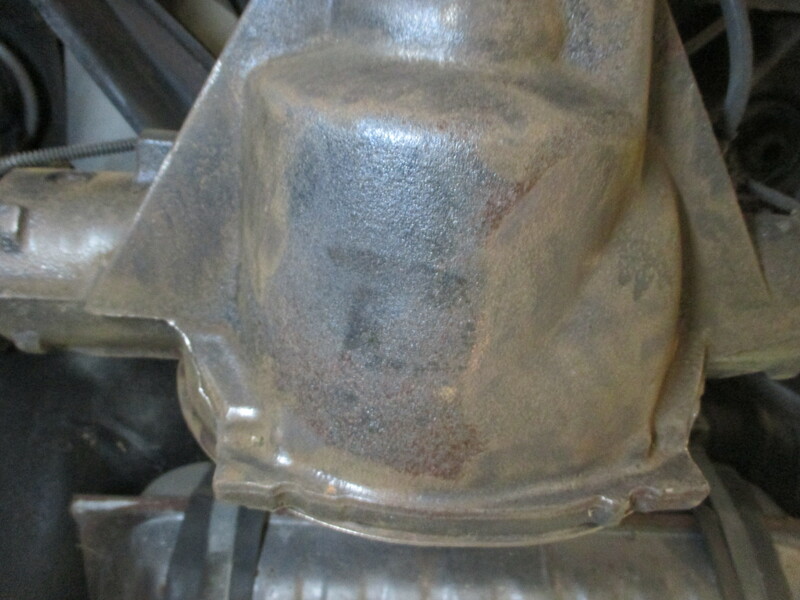 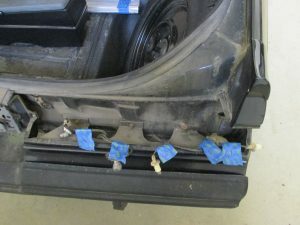 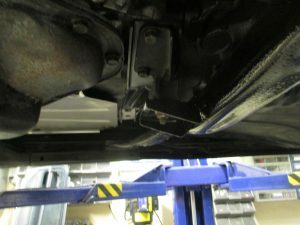 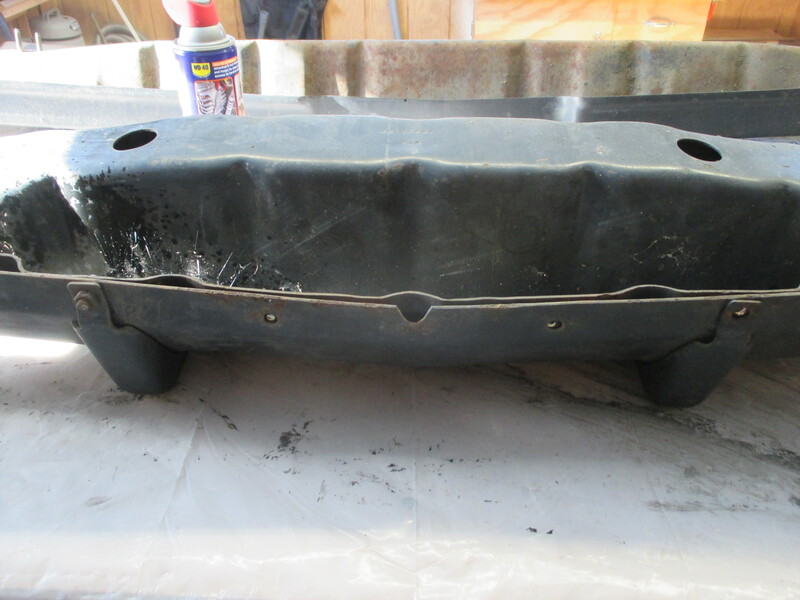 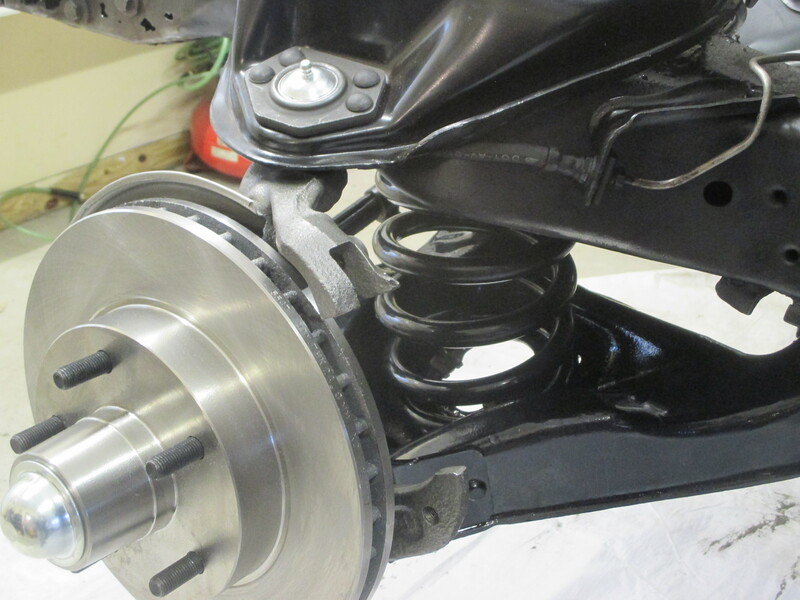 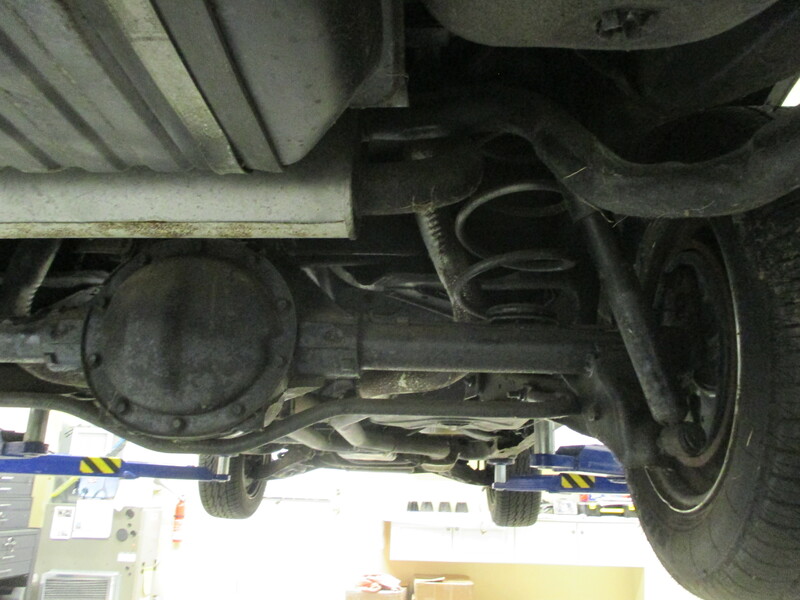 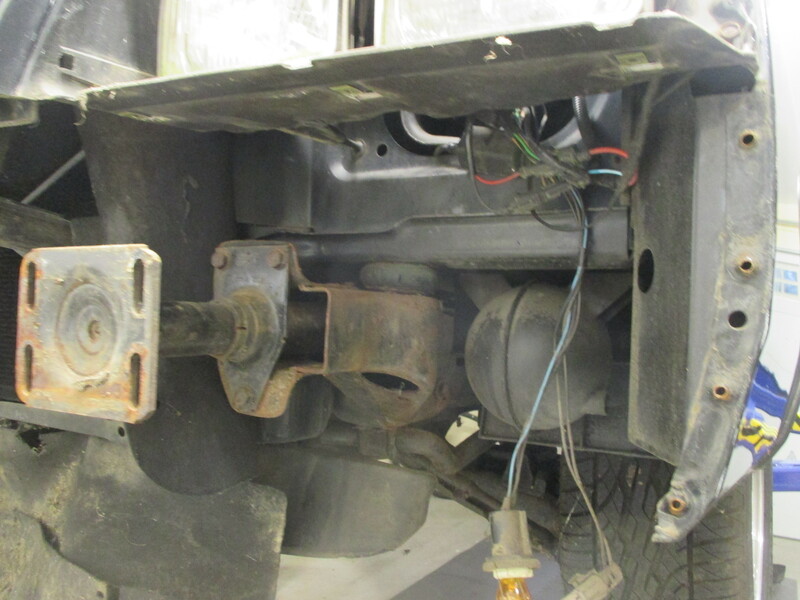 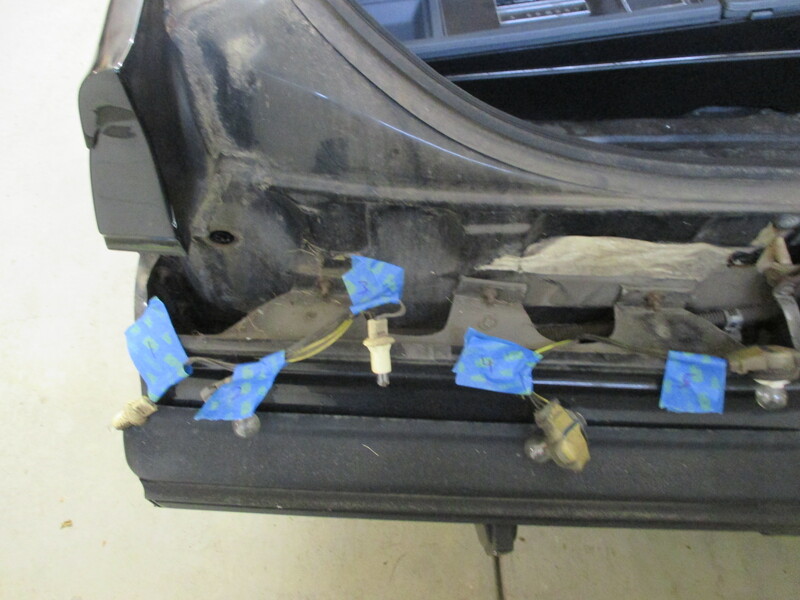 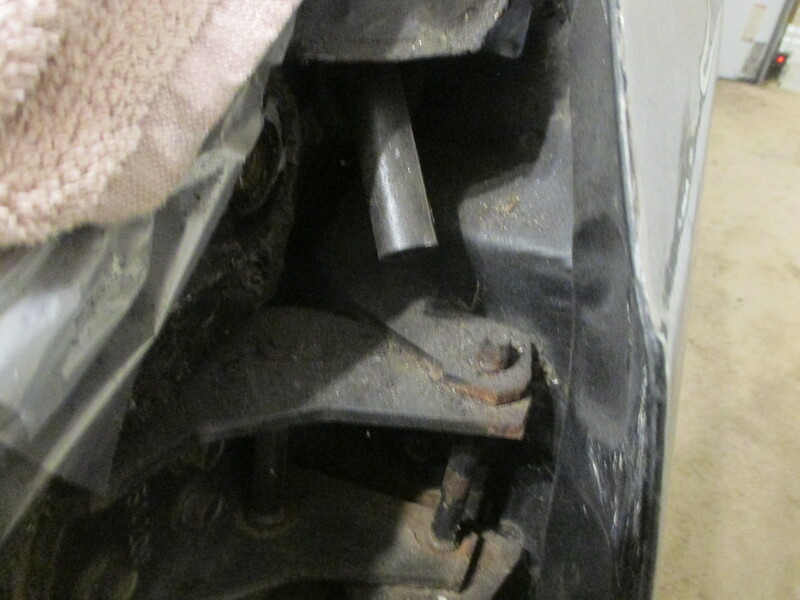 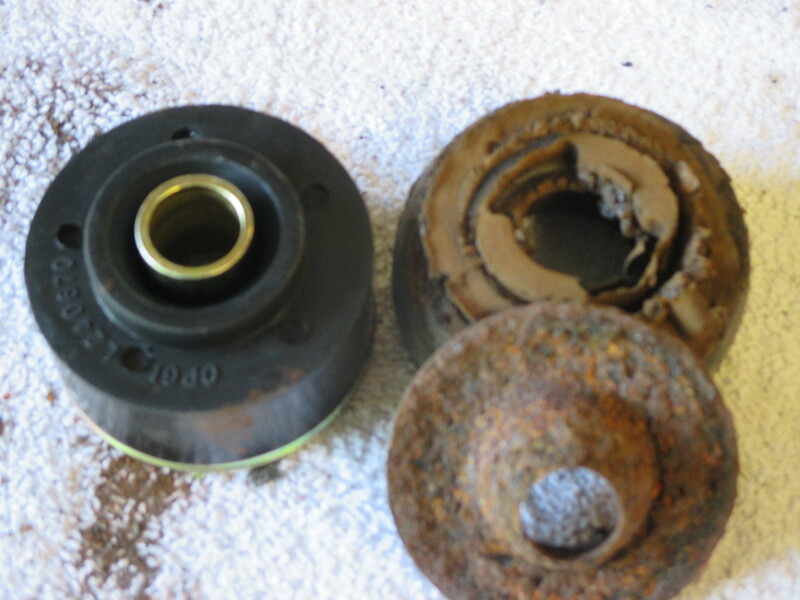 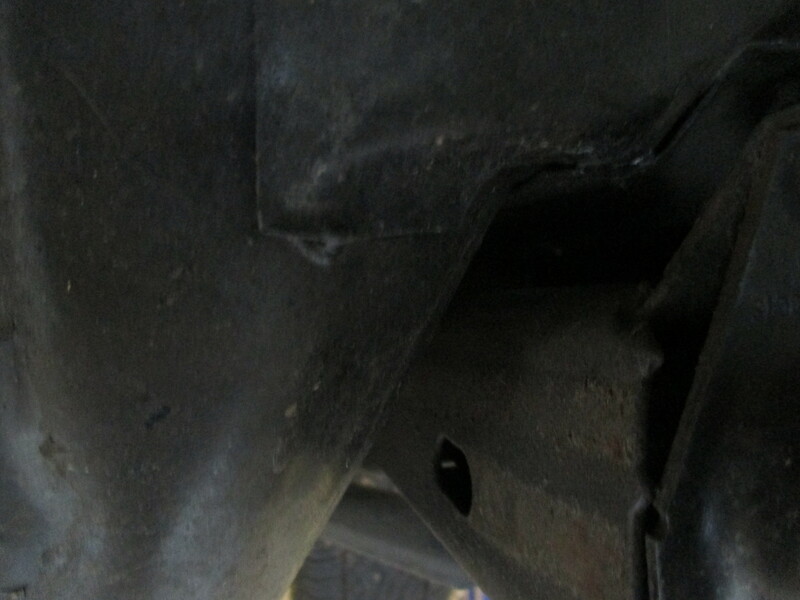 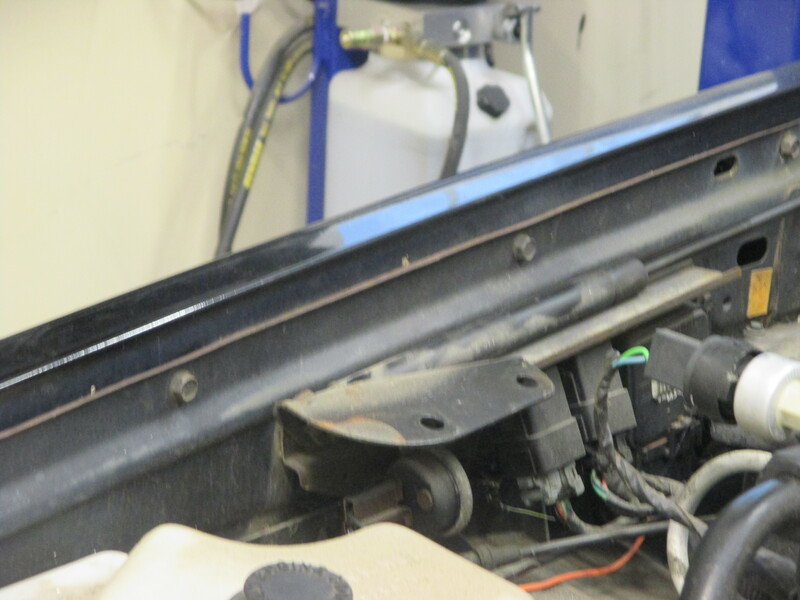 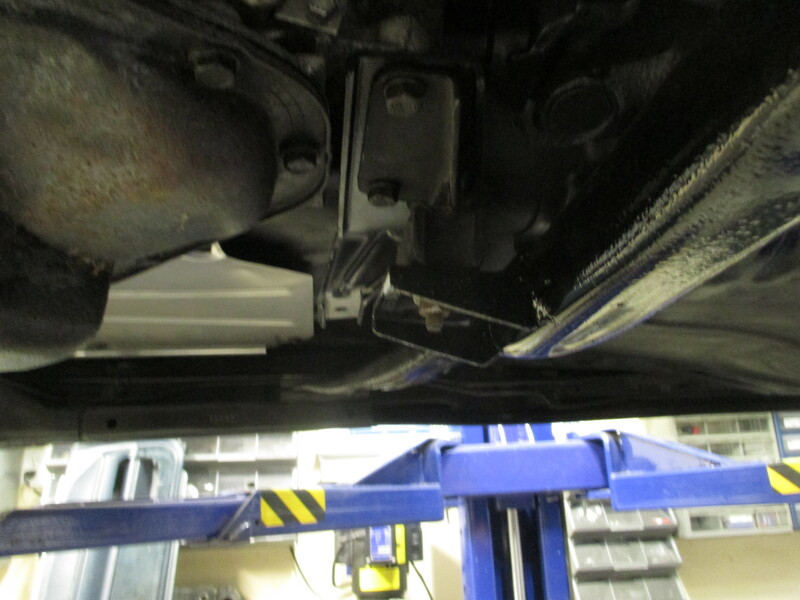 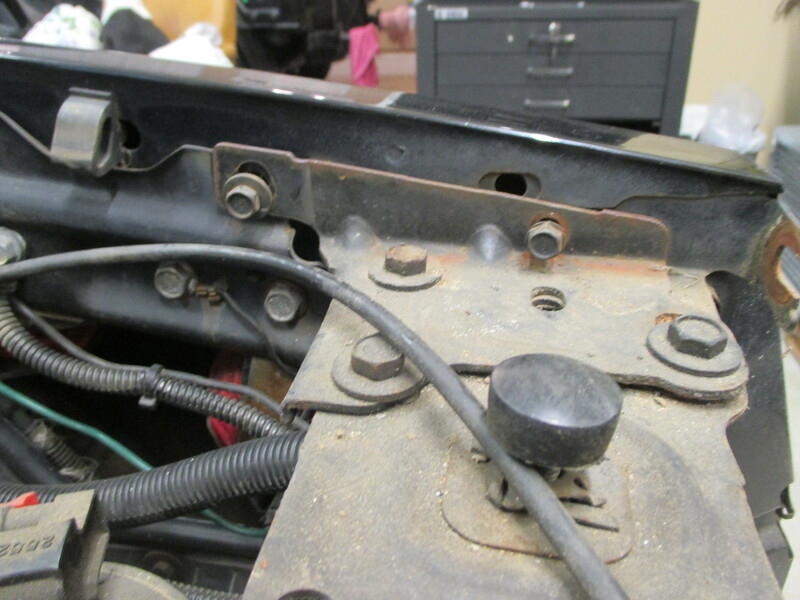 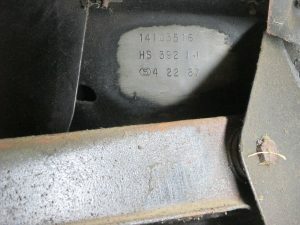 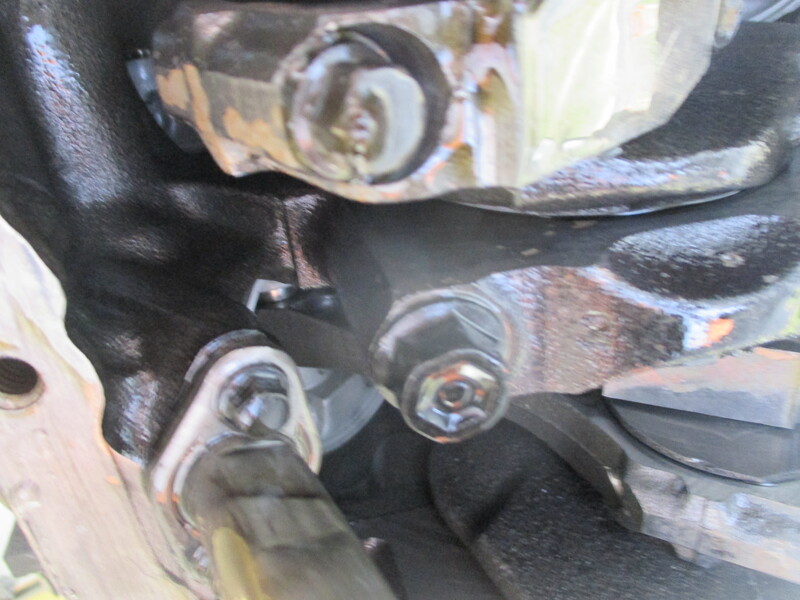 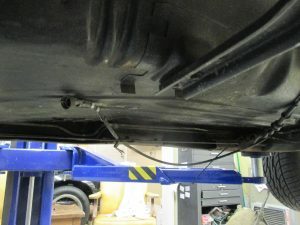 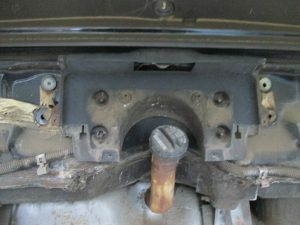 Bumpers can be a challenge over time the bolts get rusted and can become difficult to remove. These bumpers took over 5 hrs just to disassemble. 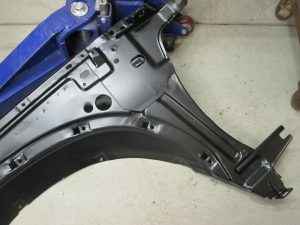 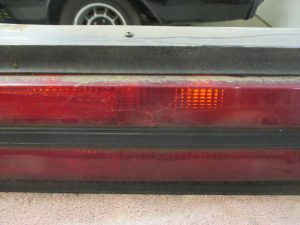 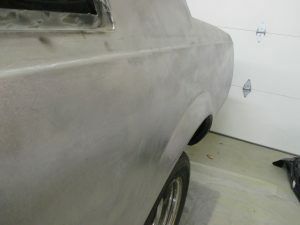 However the bumper have no dent, ding or bondo and are nice and straight. 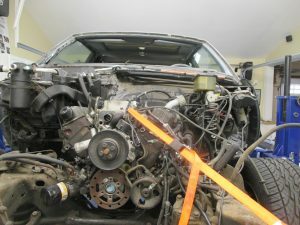 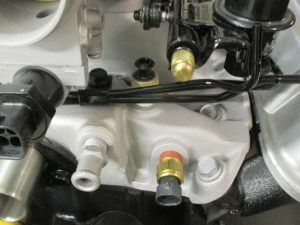 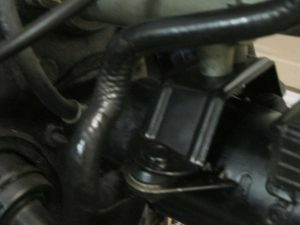 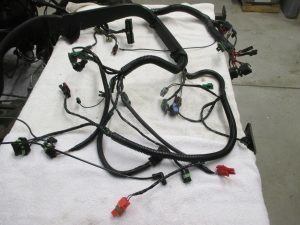 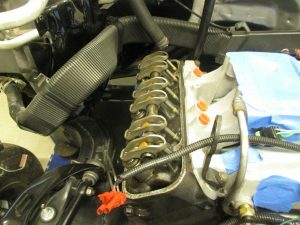 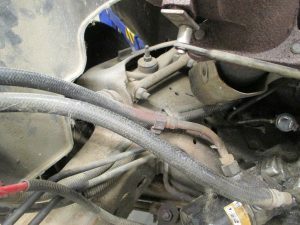 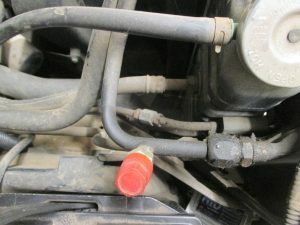 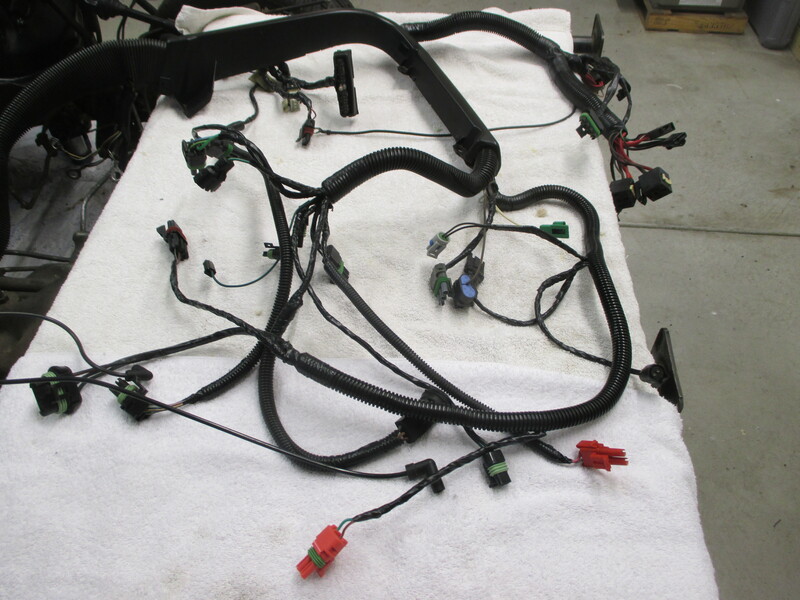 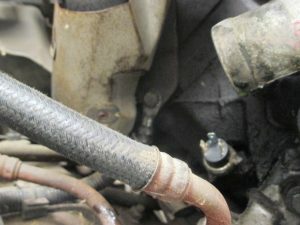 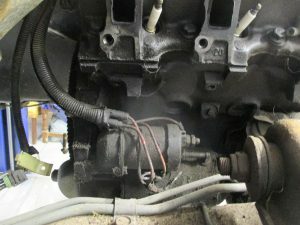 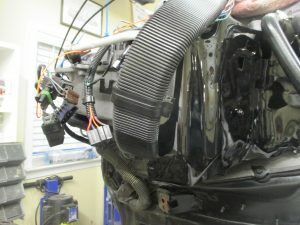 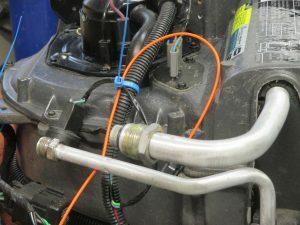 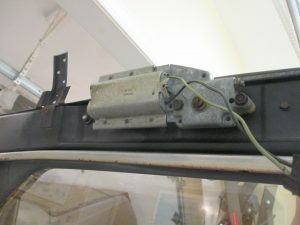 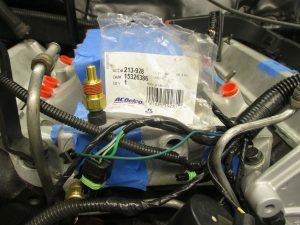 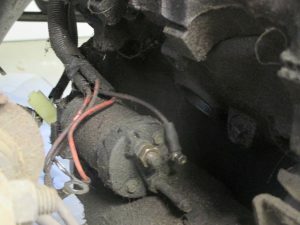 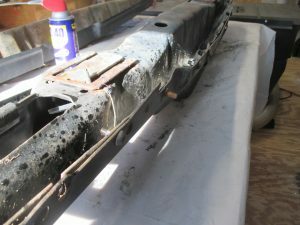 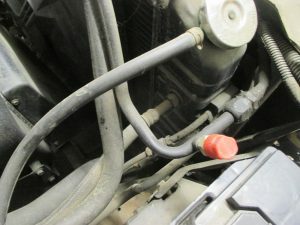 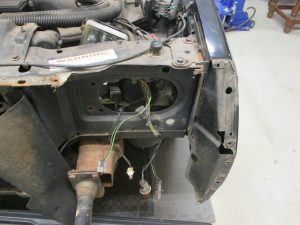 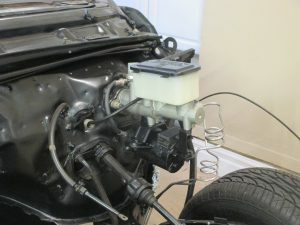 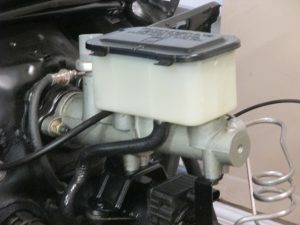 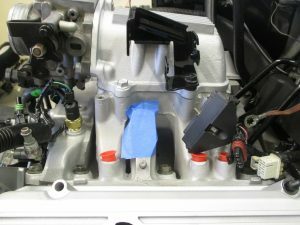 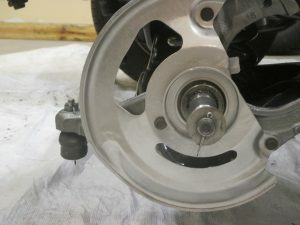 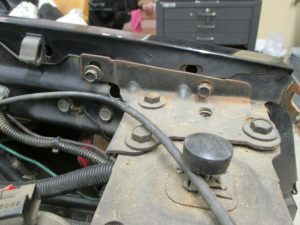 Completely restored engine wire harness with new connectors, looms and heat resistant tape. Powder coated A/C heat shield and fire stripped and painted to factory color. 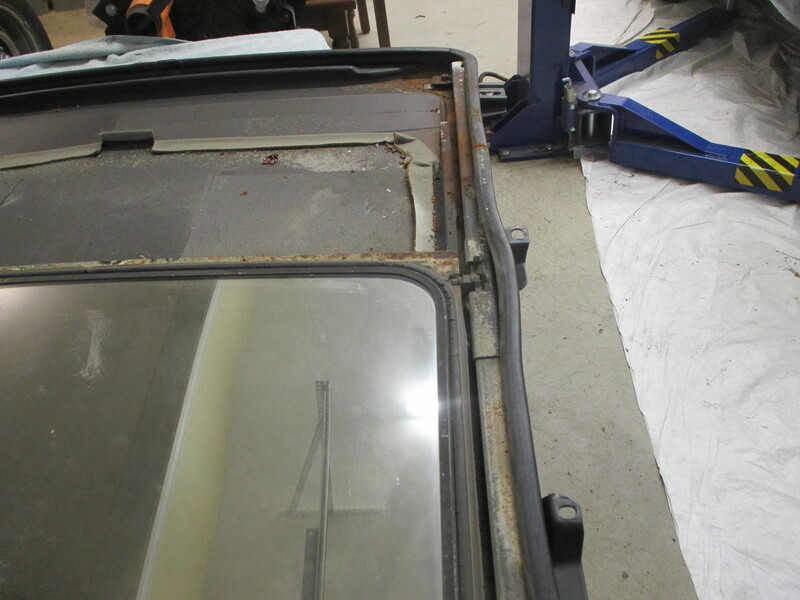 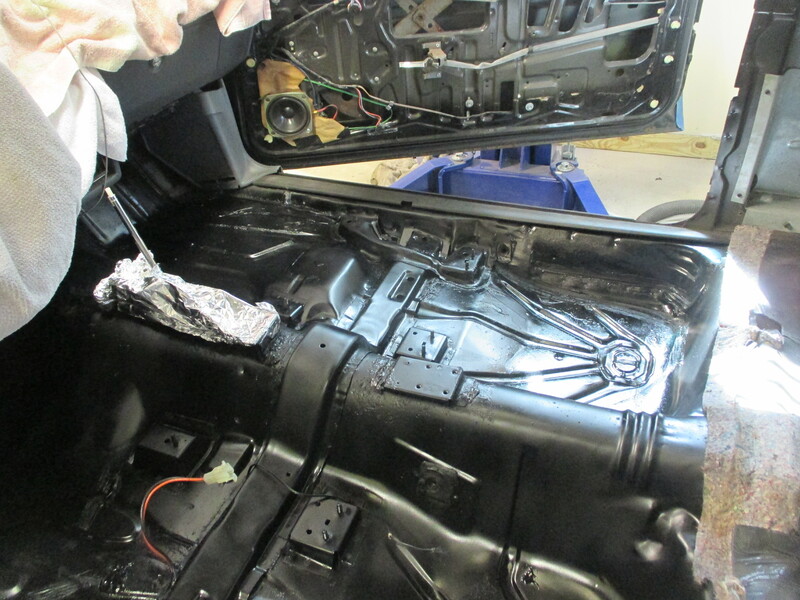 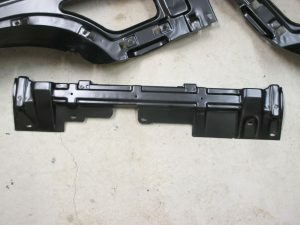 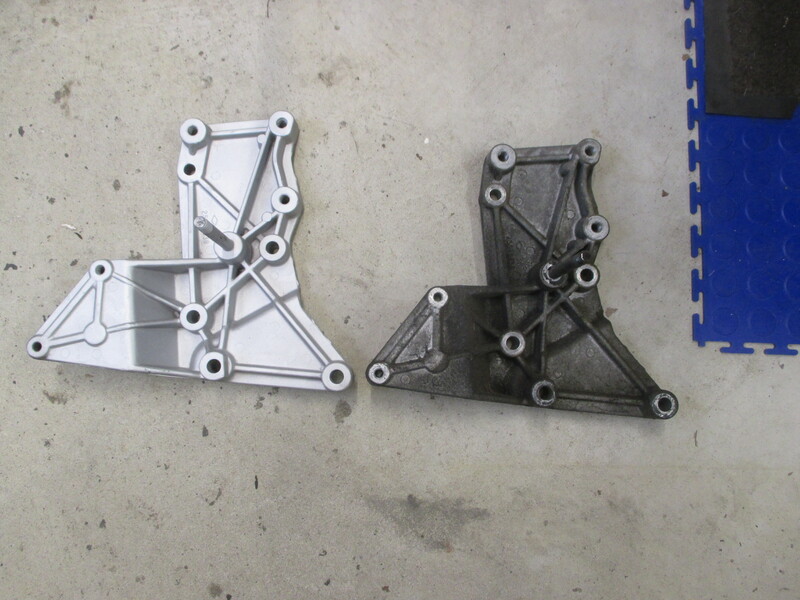 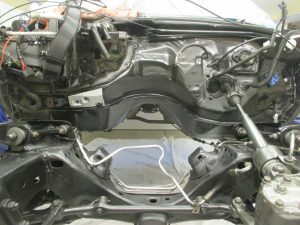 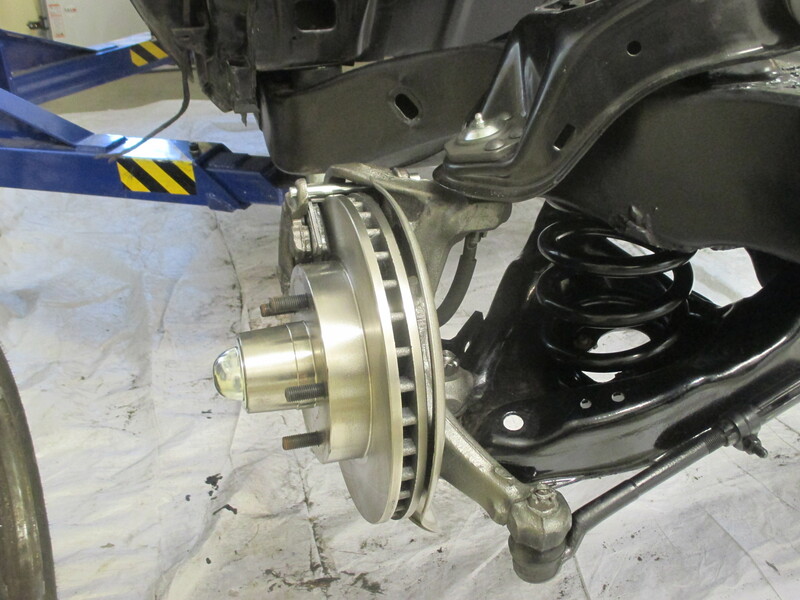 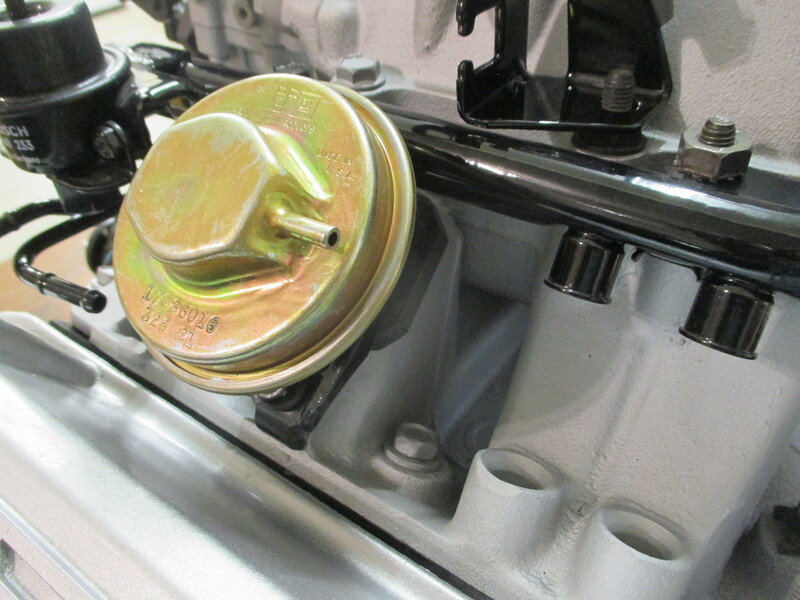 To keep our projects moving along interior components are restored simultaneously with other parts of the car. 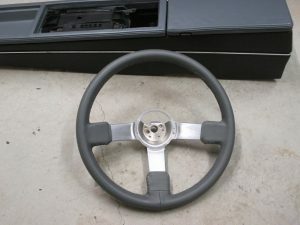 Below if the restored steering wheel, console seats. 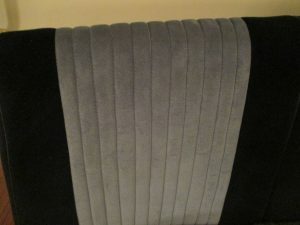 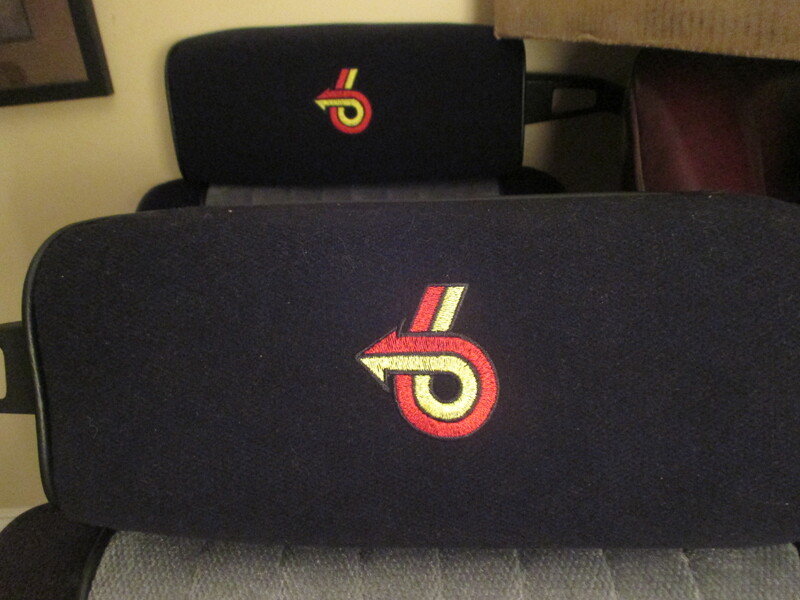 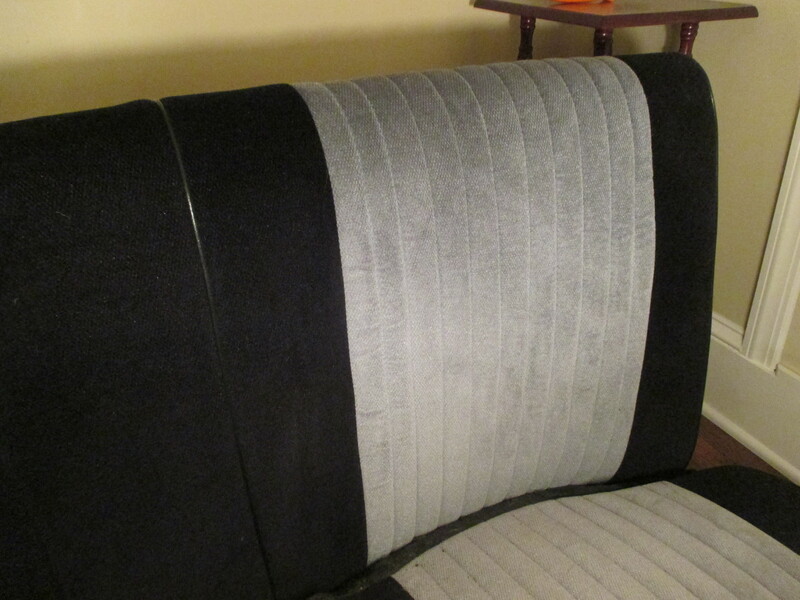 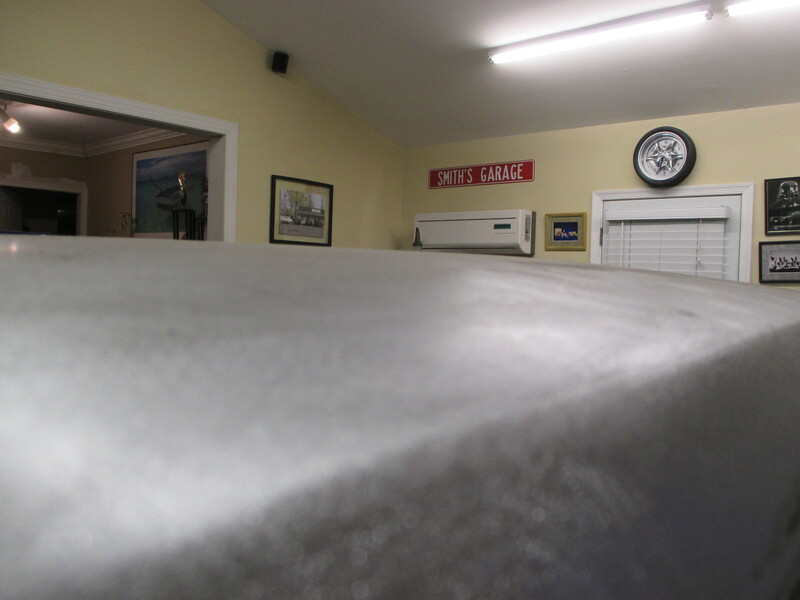 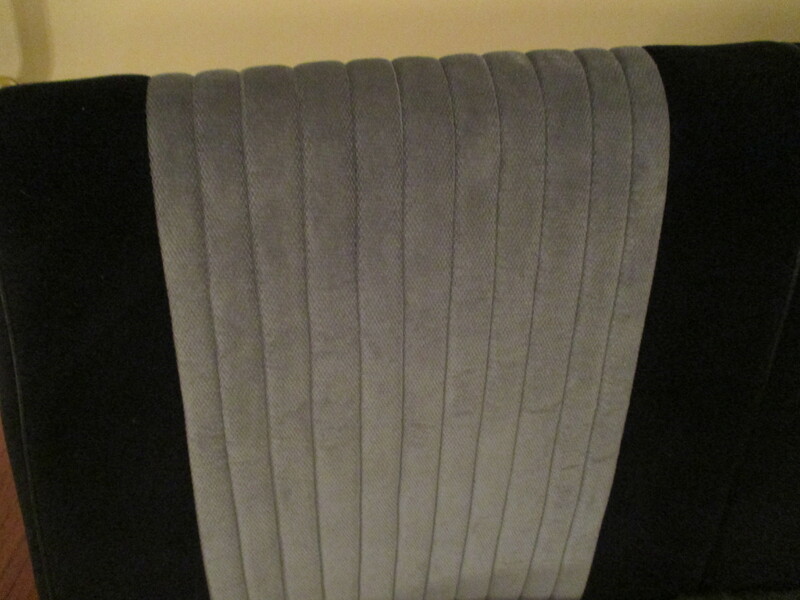 The seats have been restored with original date coded gray and black palex material. Each car if done with material from the same role so that the color matches perfectly. 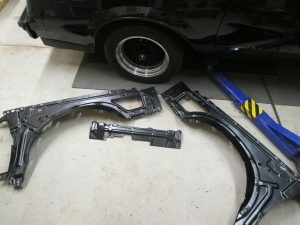 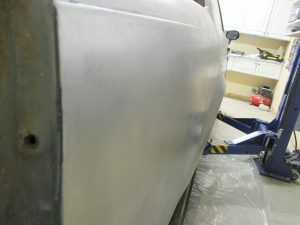 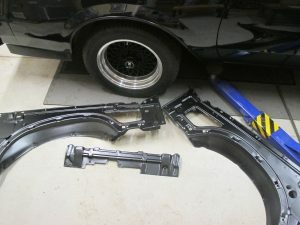 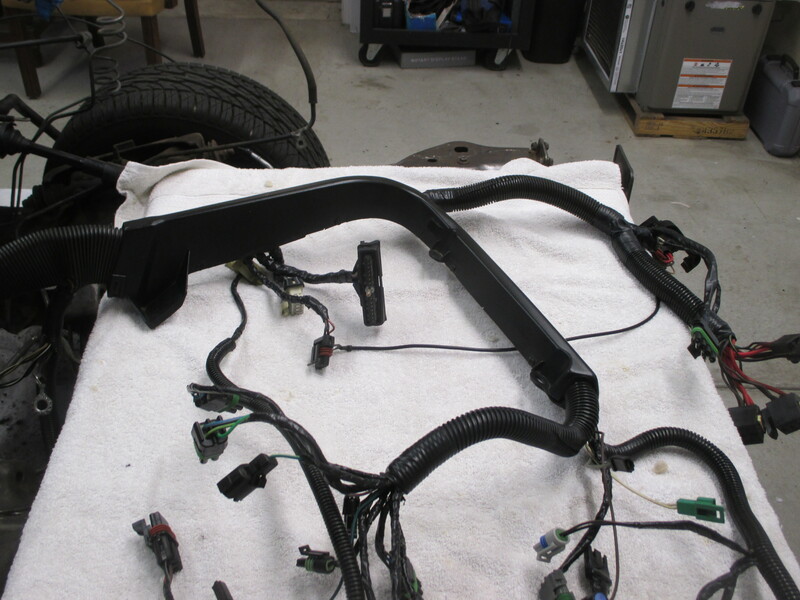 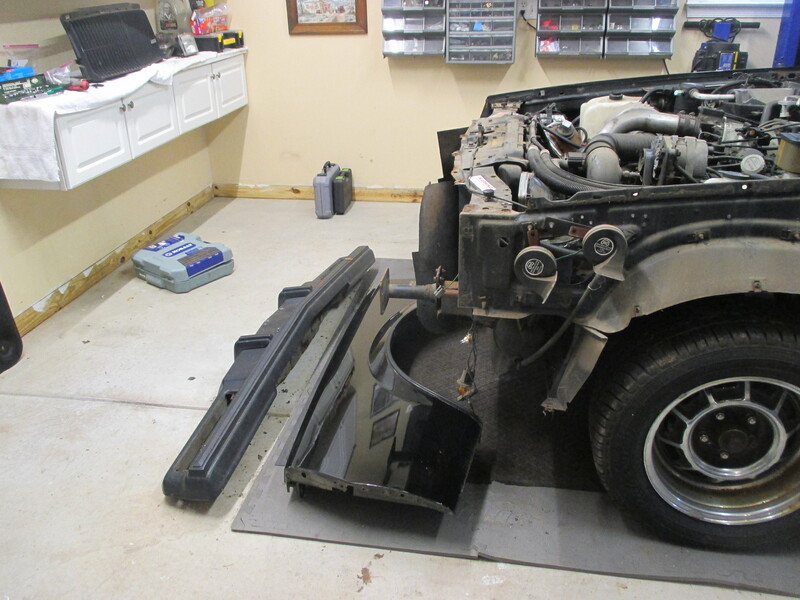 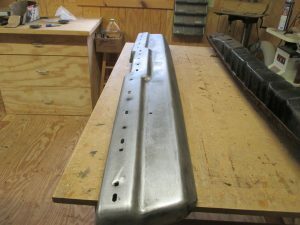 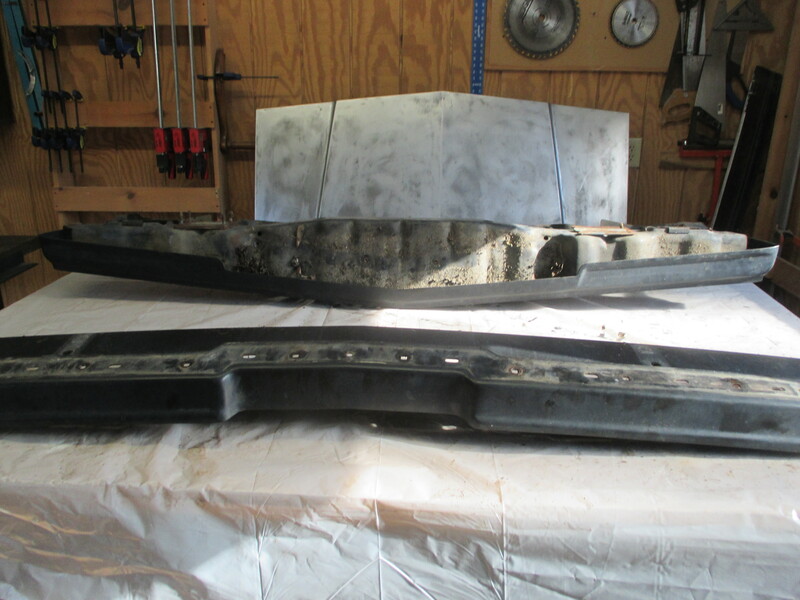 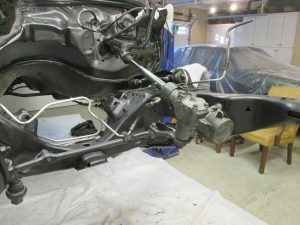 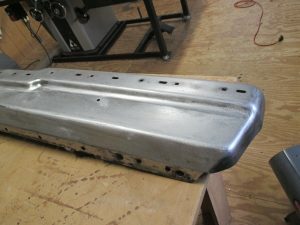 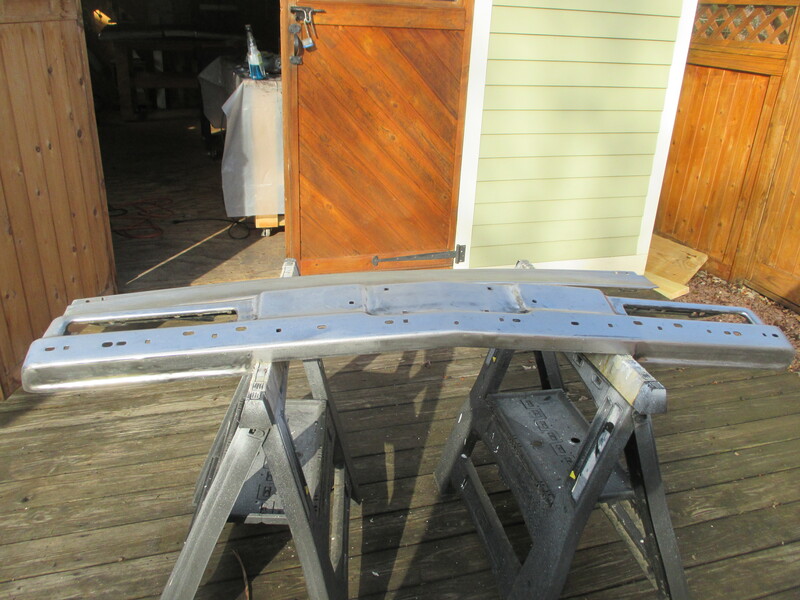 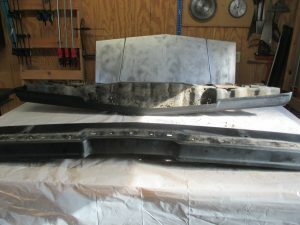 Work has begun to prep the firewall and front frame rails for refinishing. 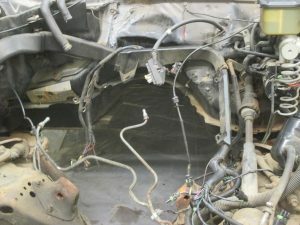 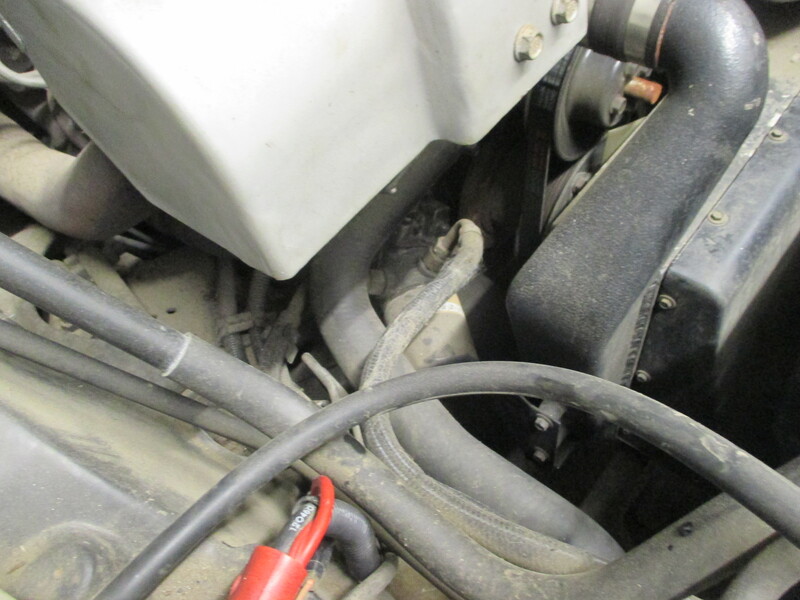 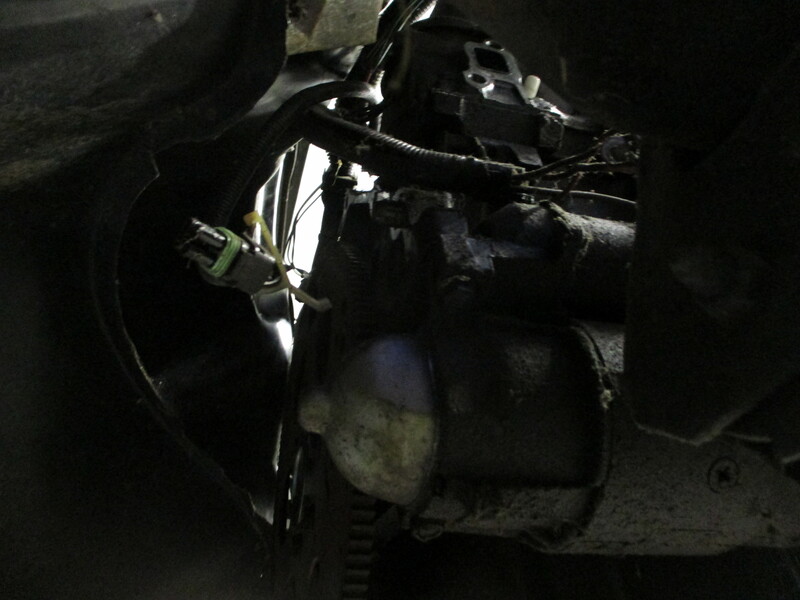 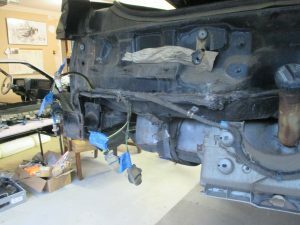 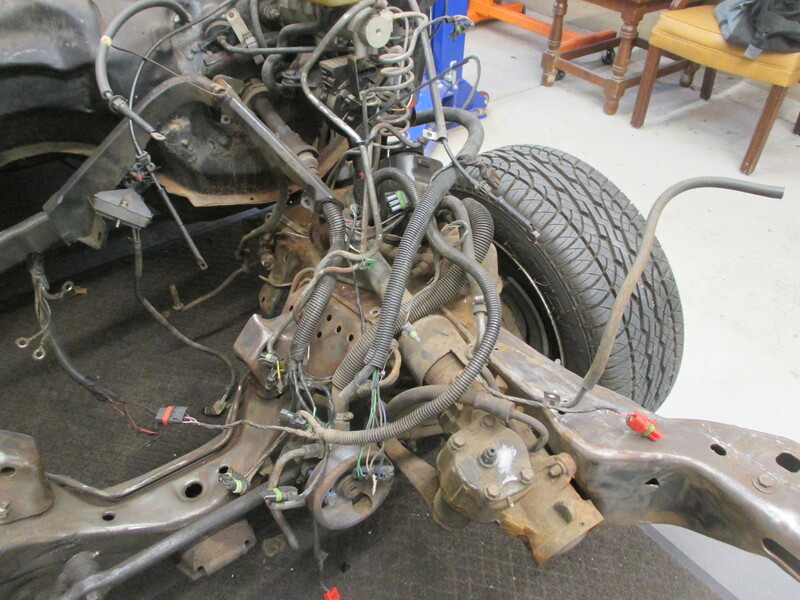 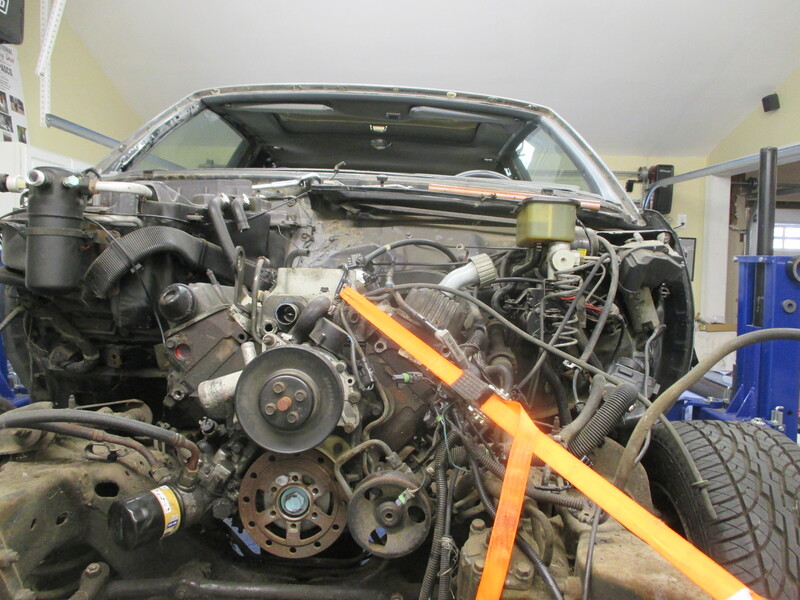 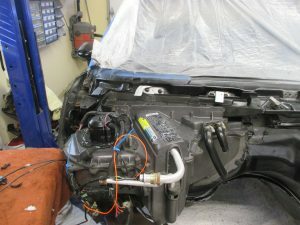 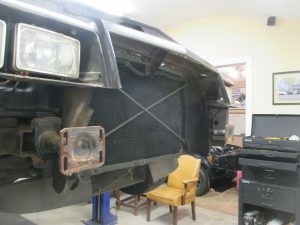 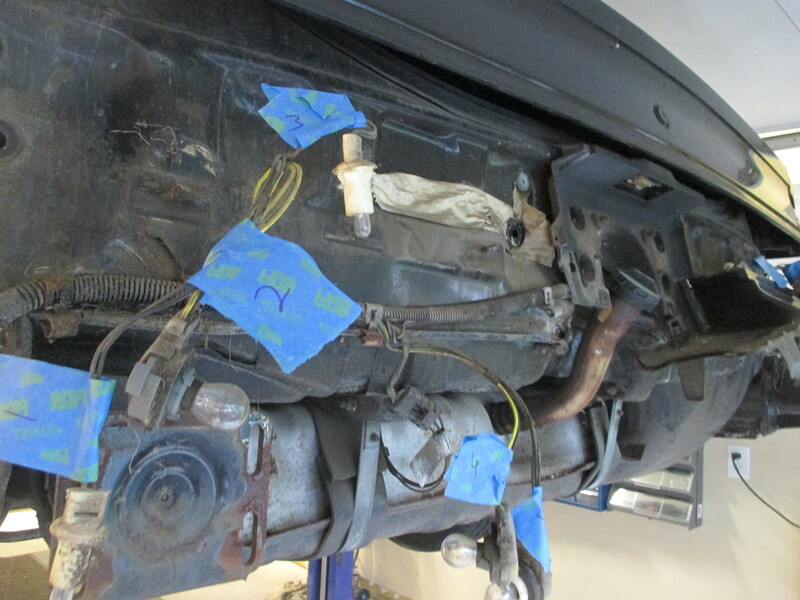 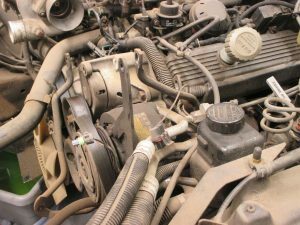 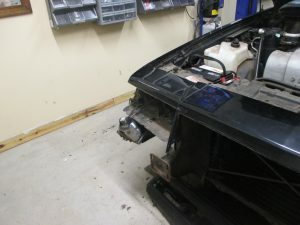 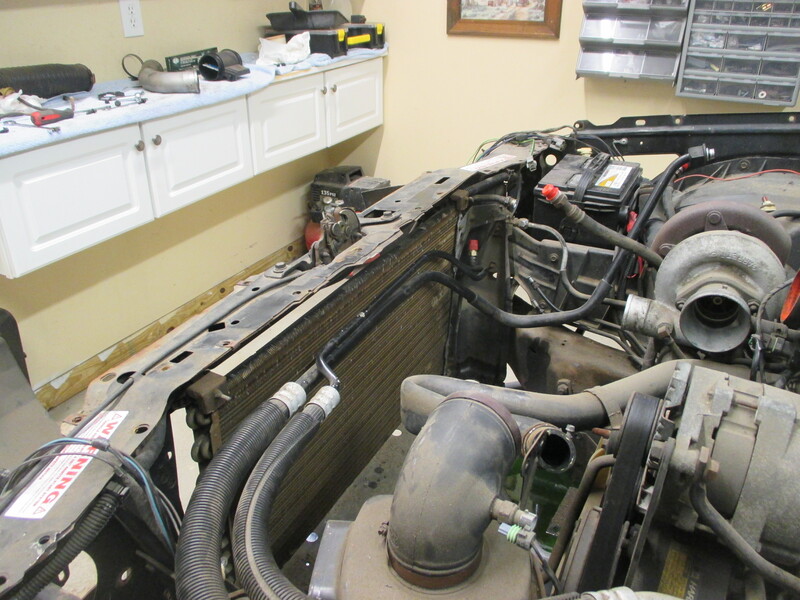 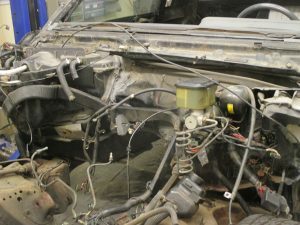 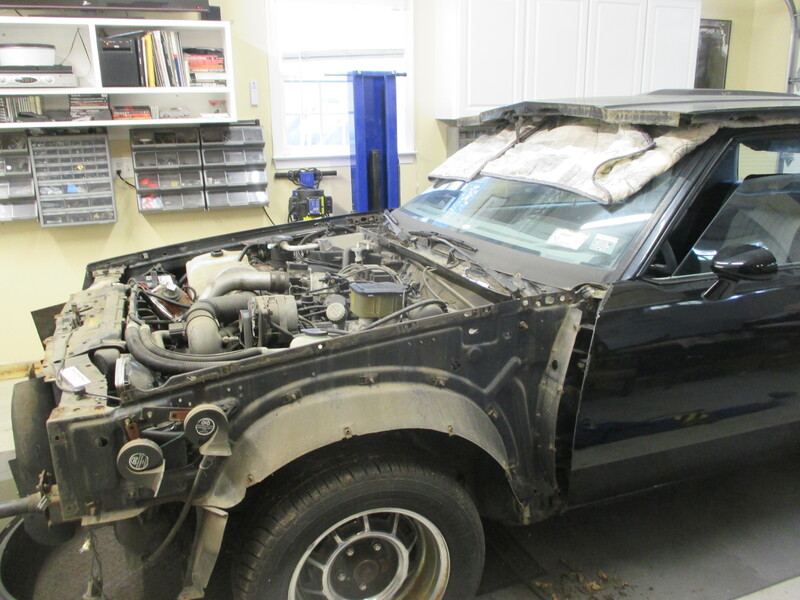 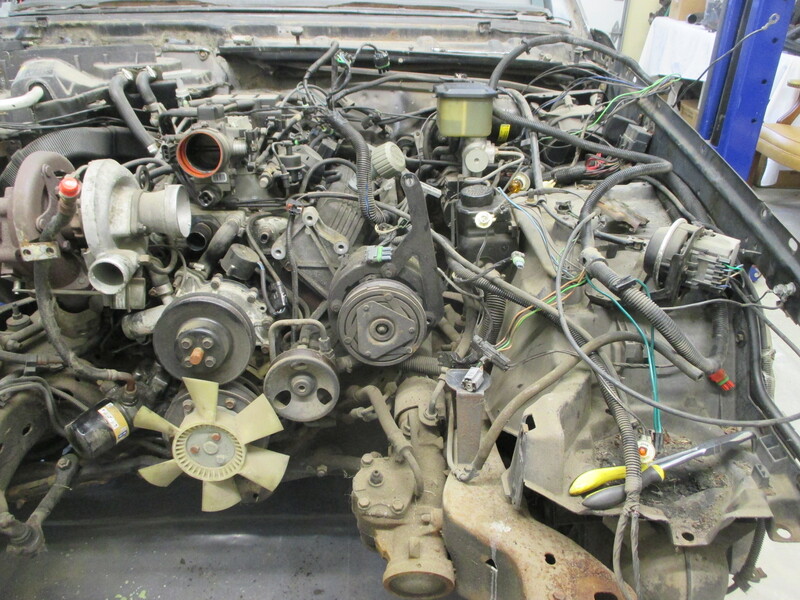 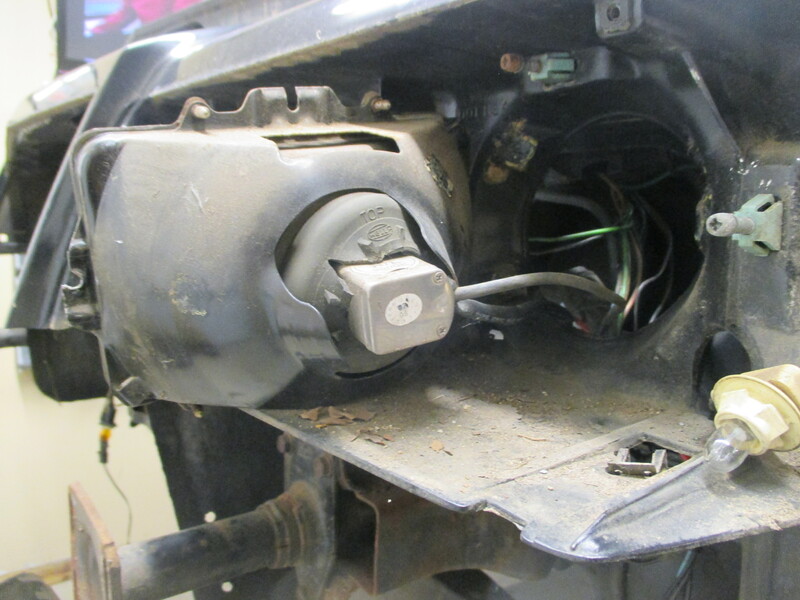 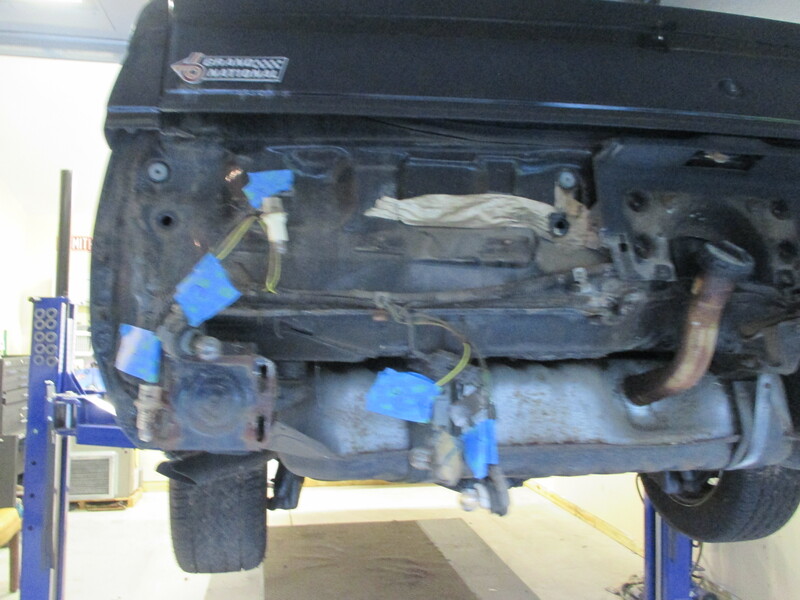 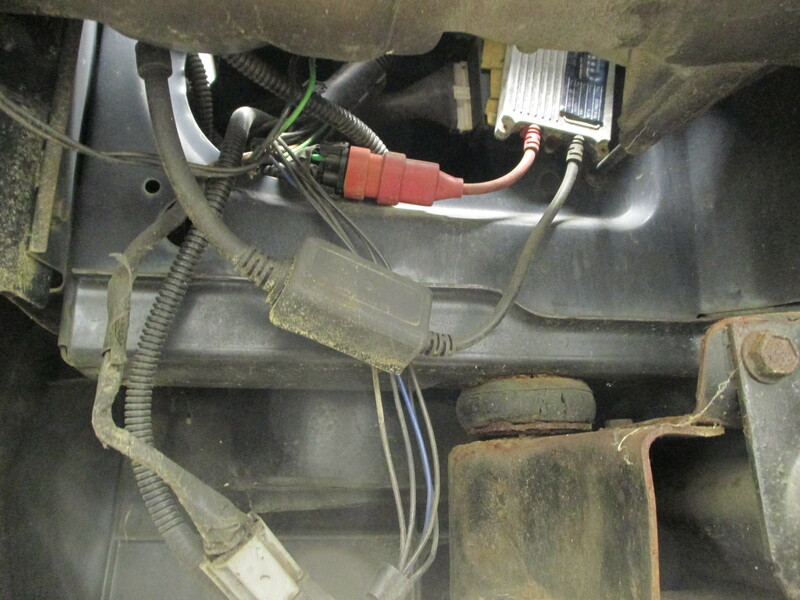 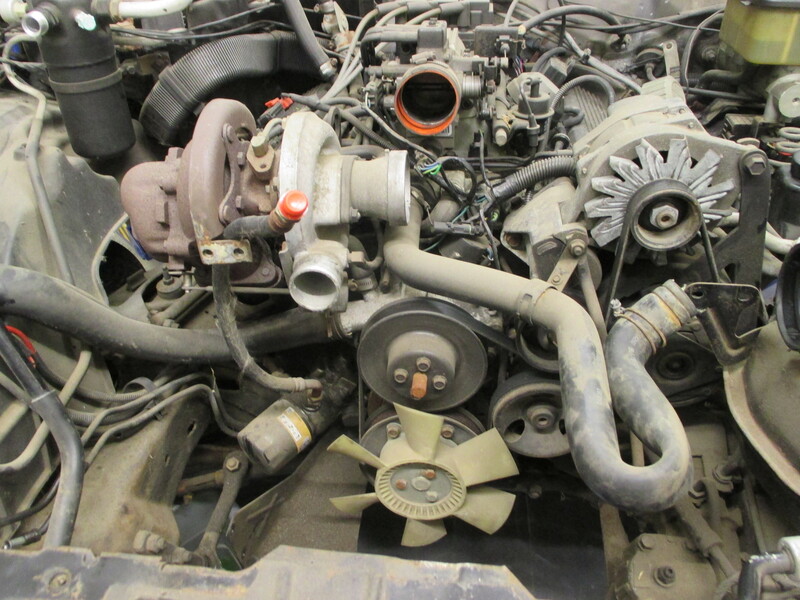 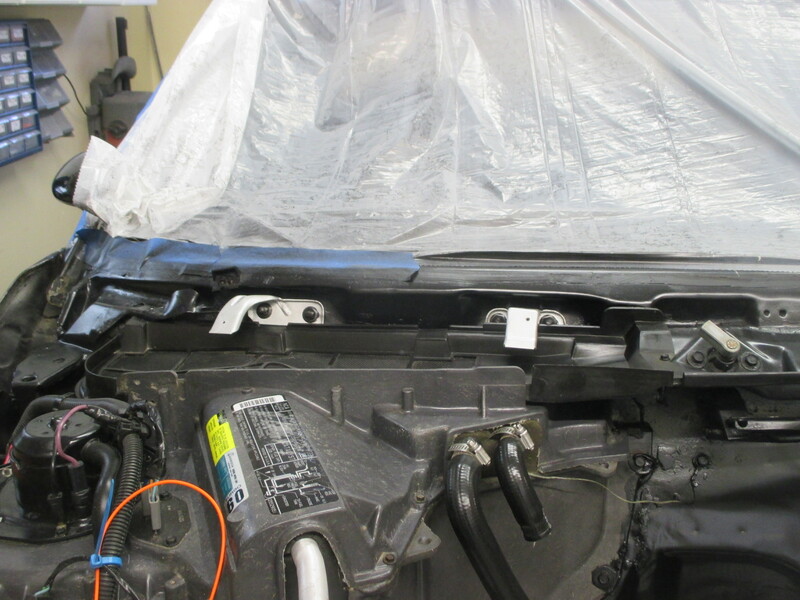 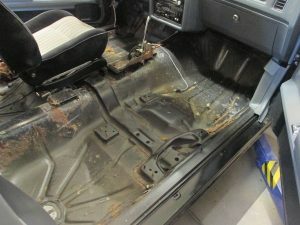 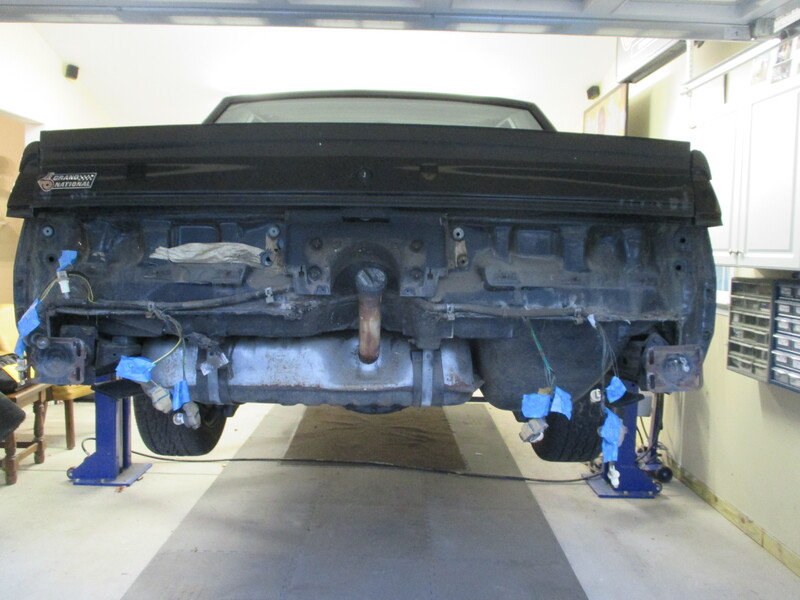 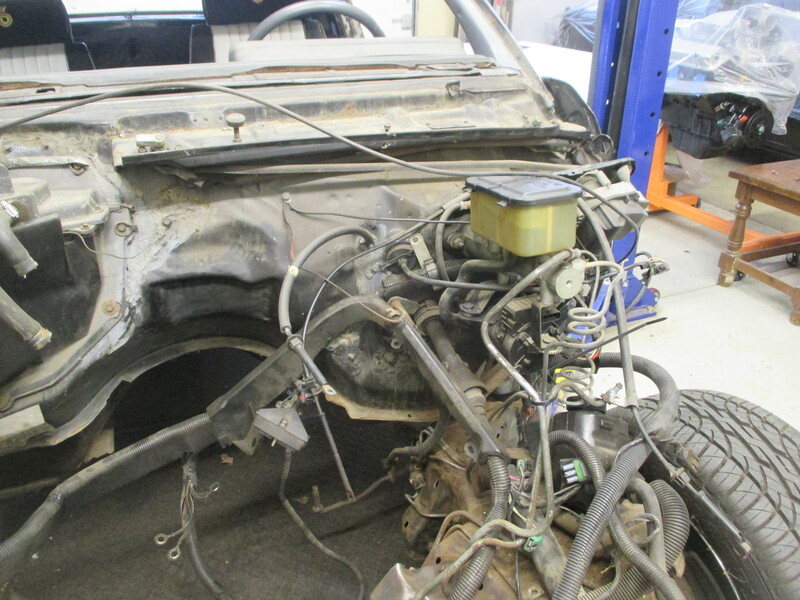 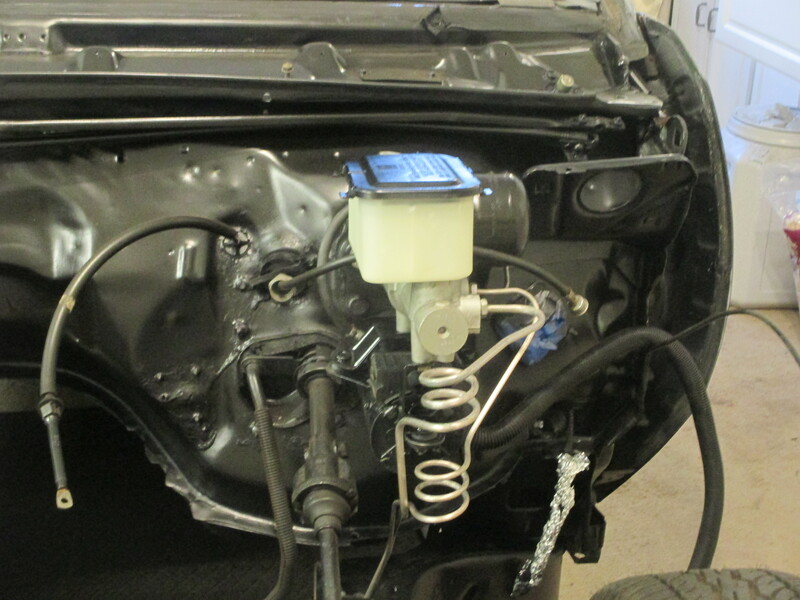 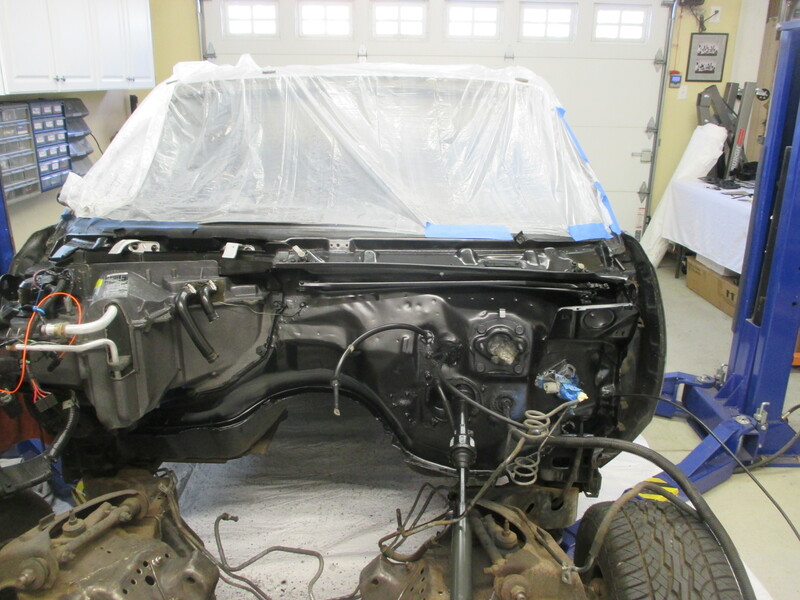 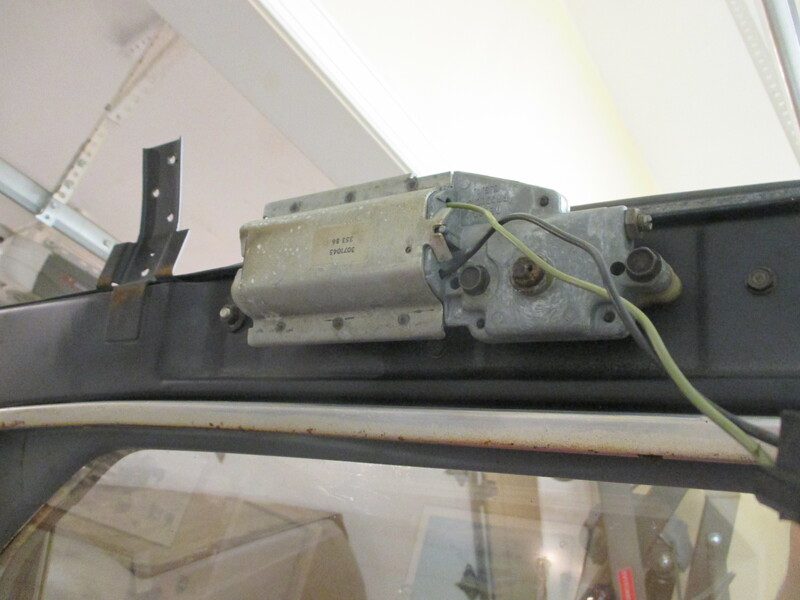 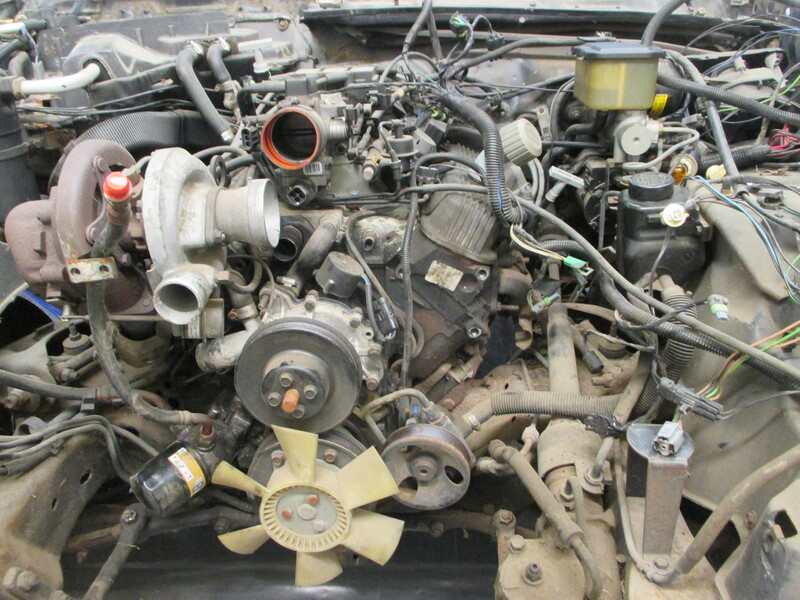 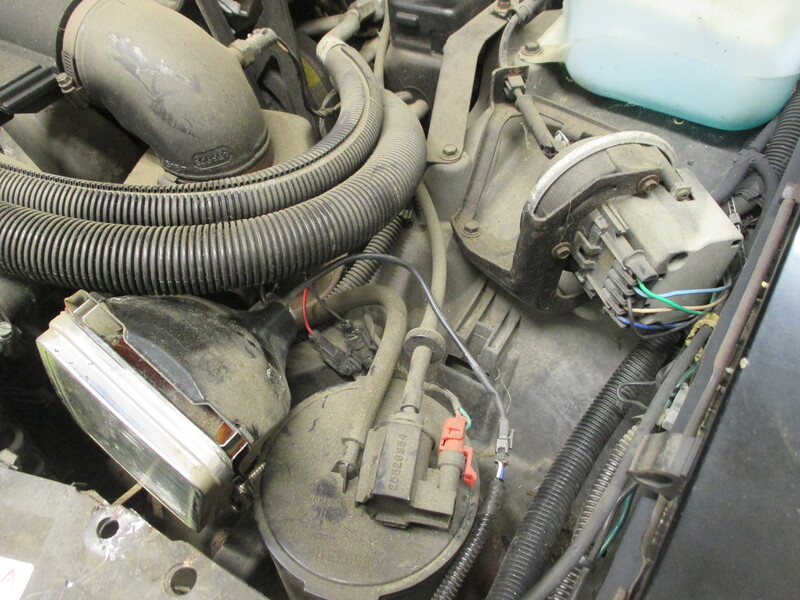 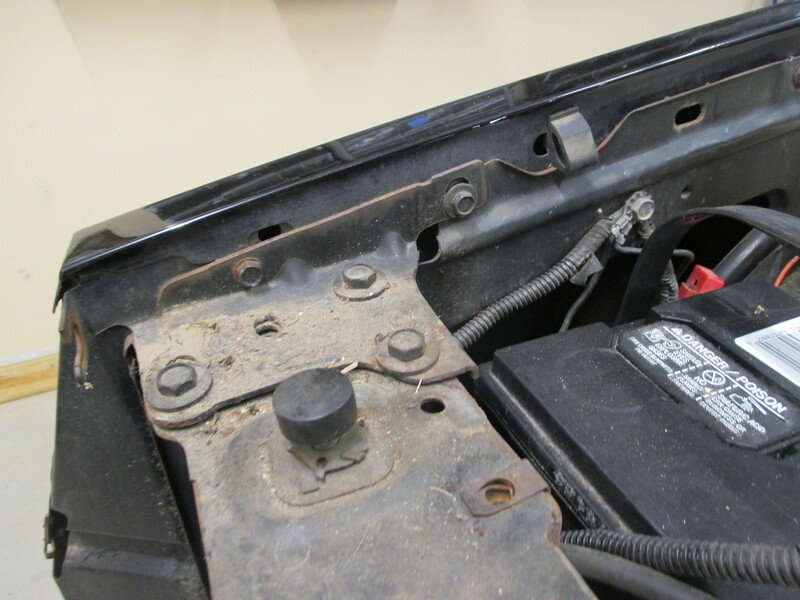 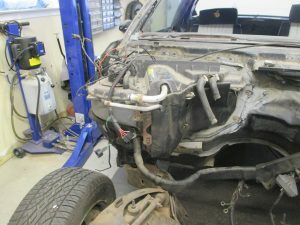 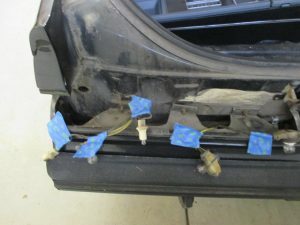 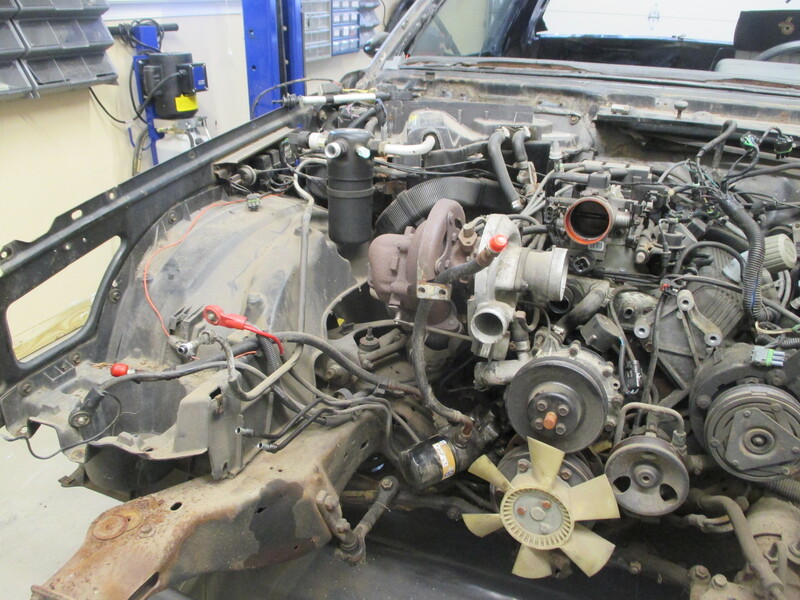 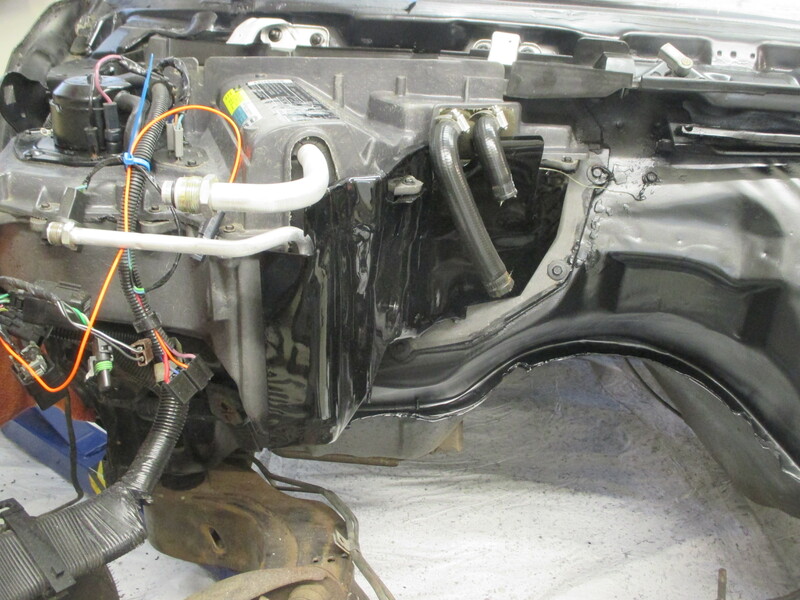 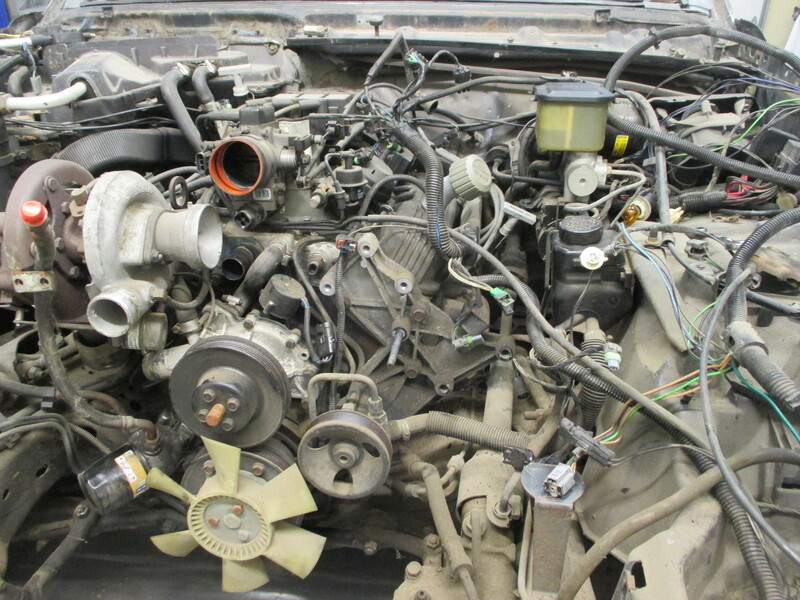 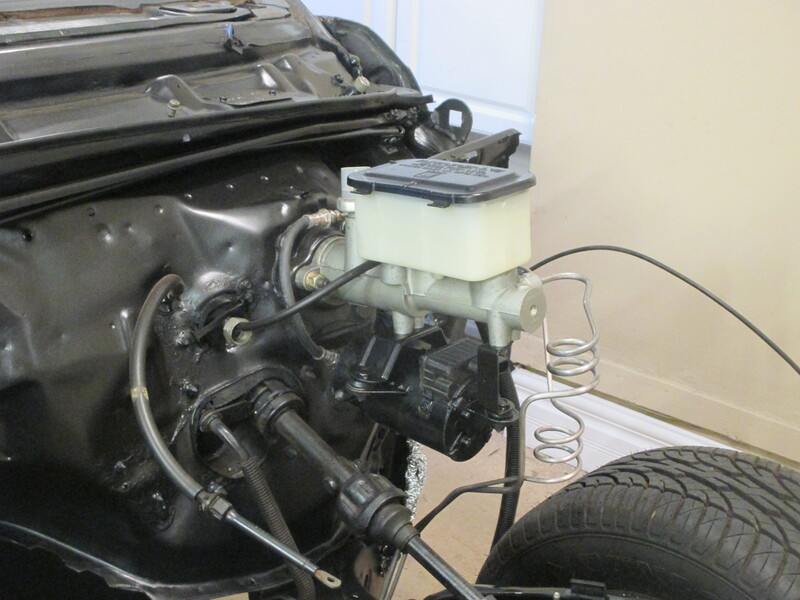 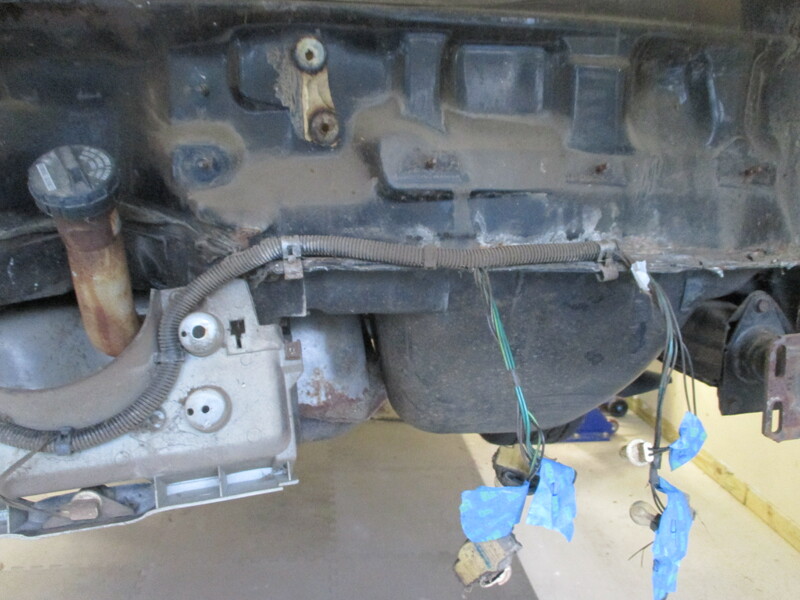 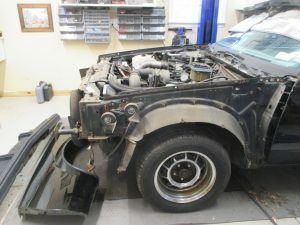 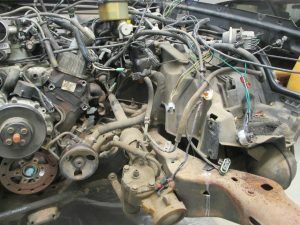 this will also be the time all of the engine compartment wiring will be fully restored. 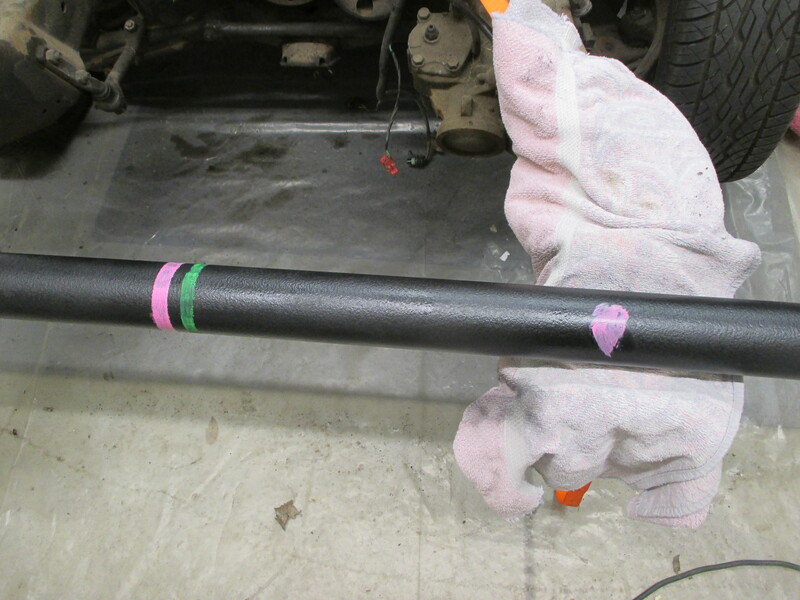 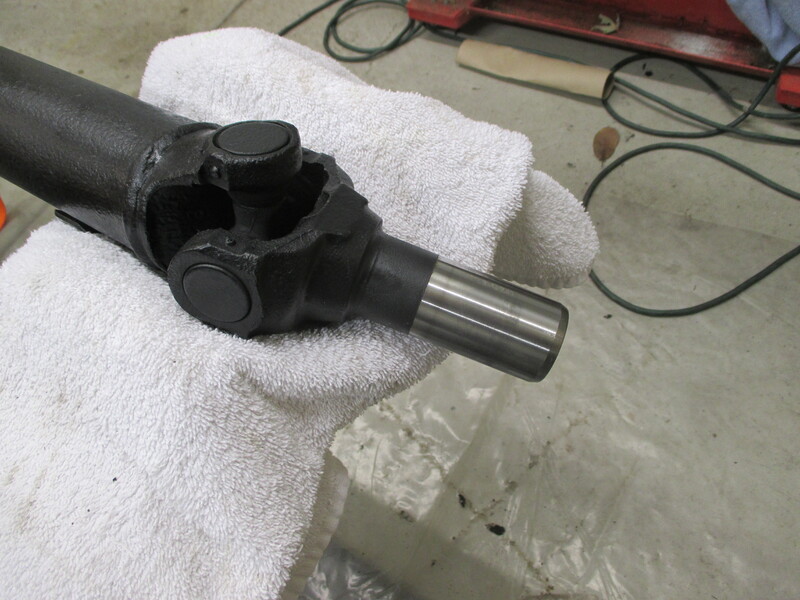 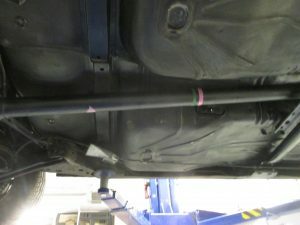 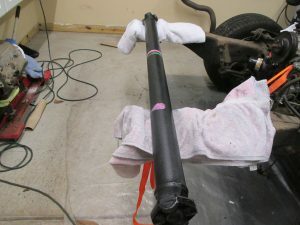 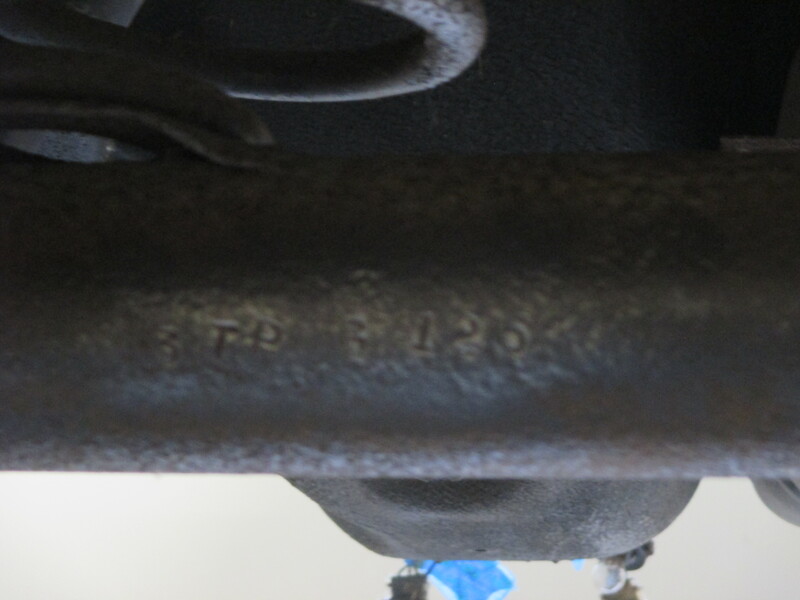 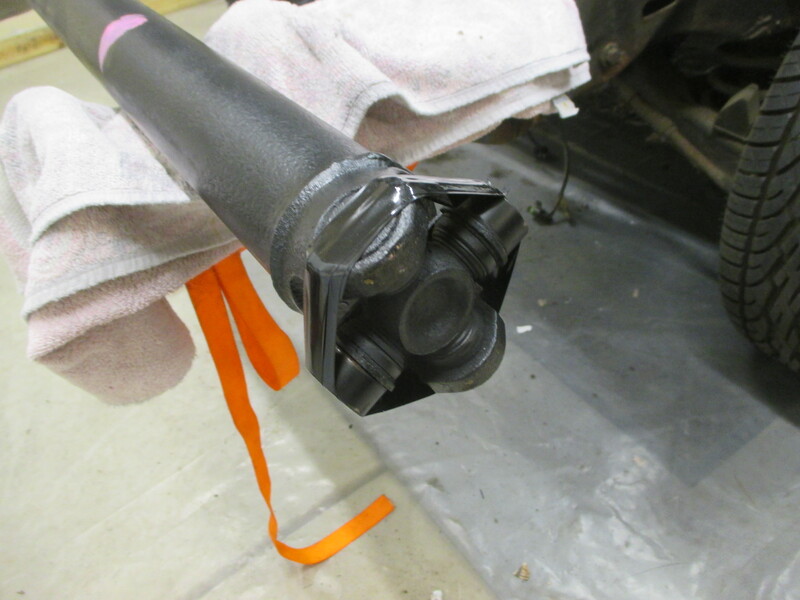 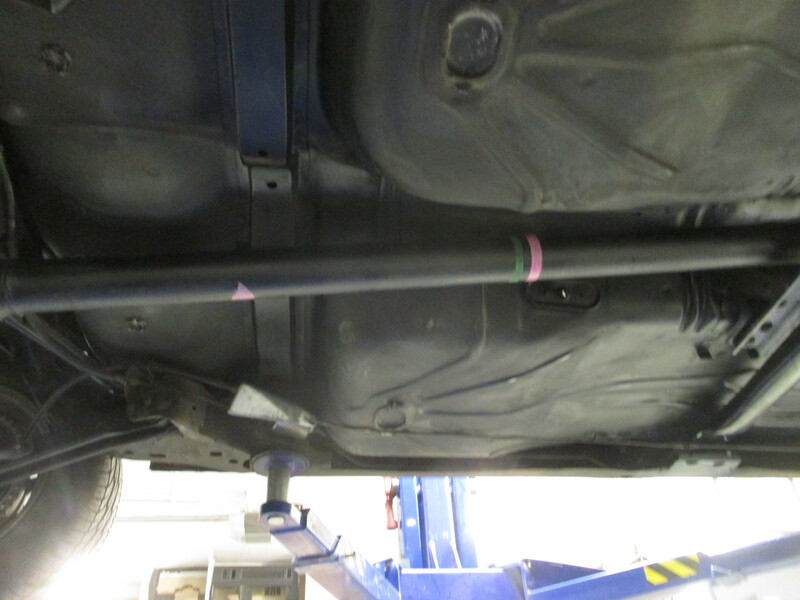 Restored driveshaft including original factory markings. 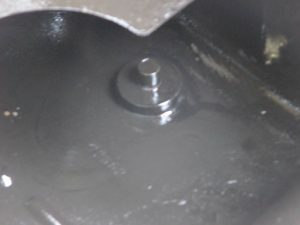 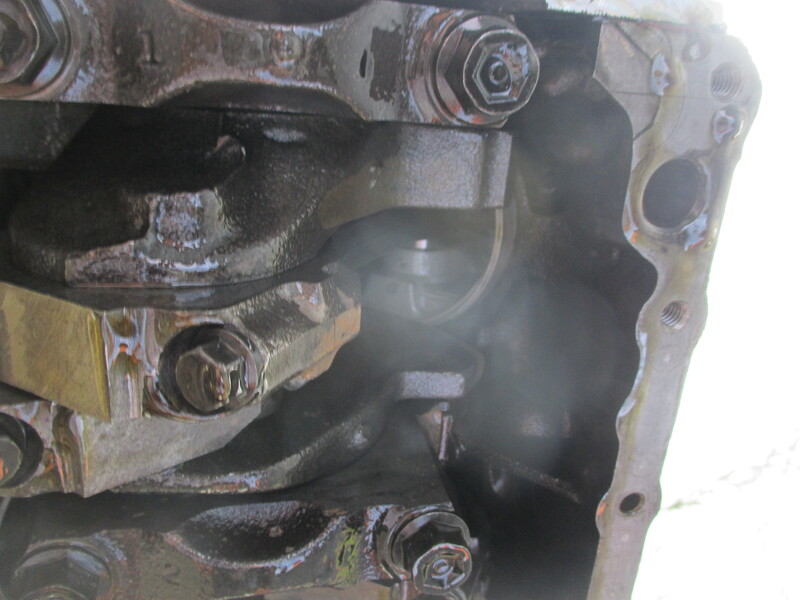 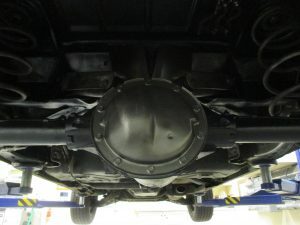 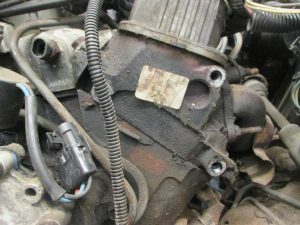 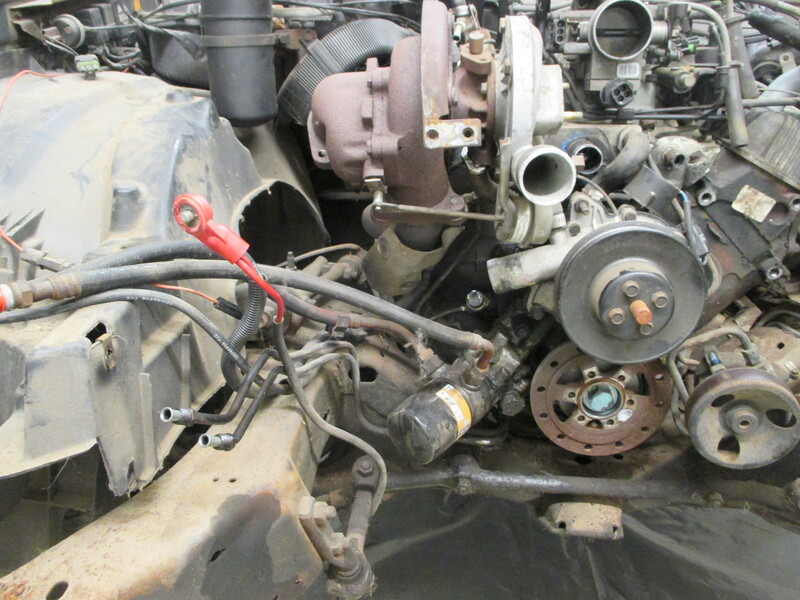 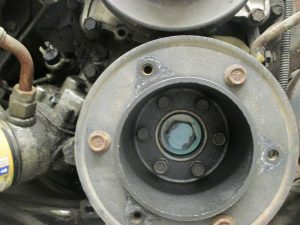 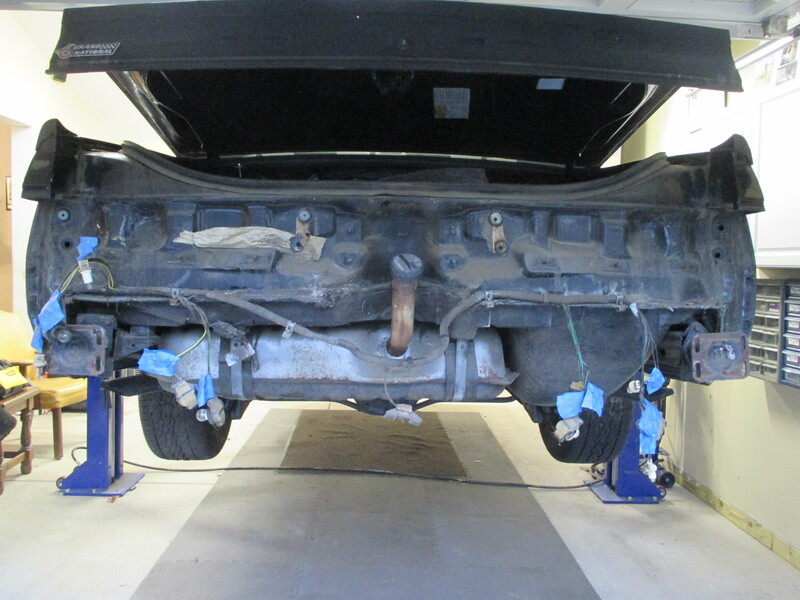 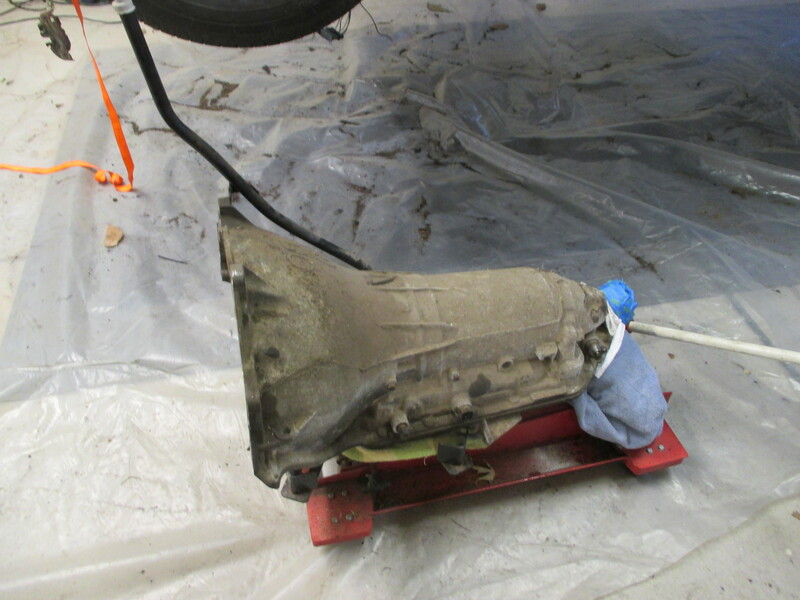 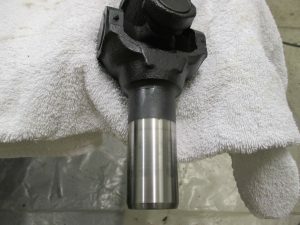 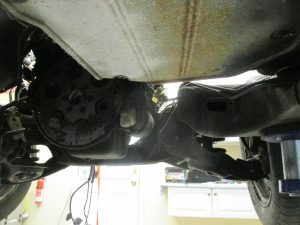 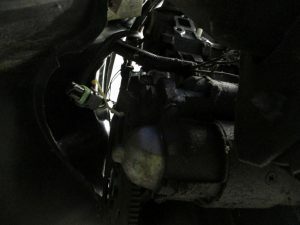 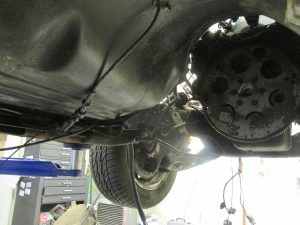 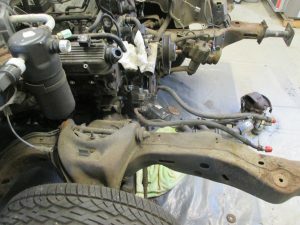 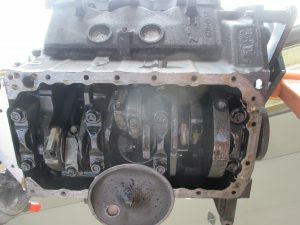 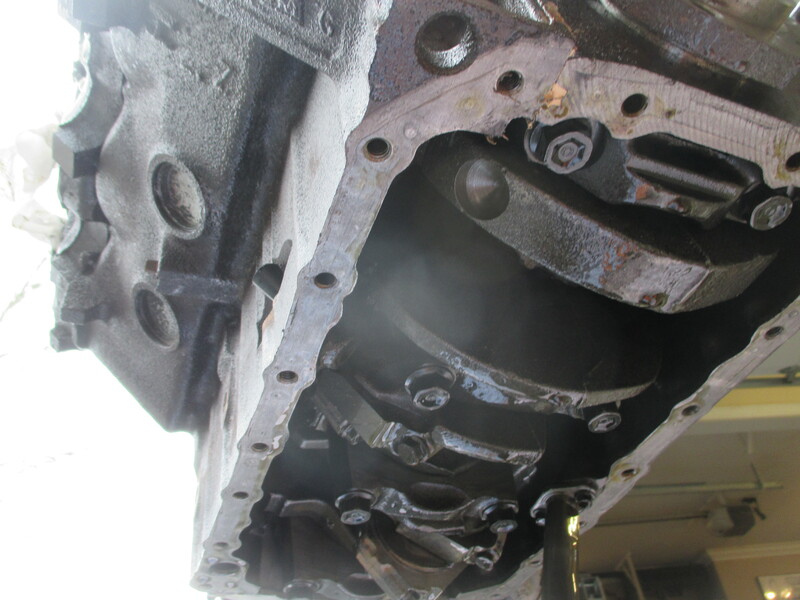 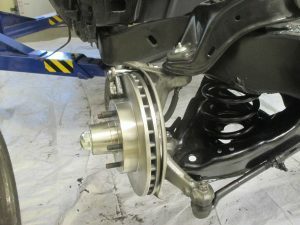 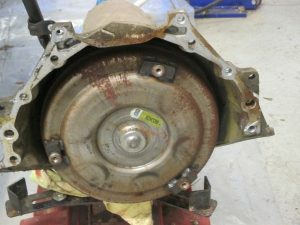 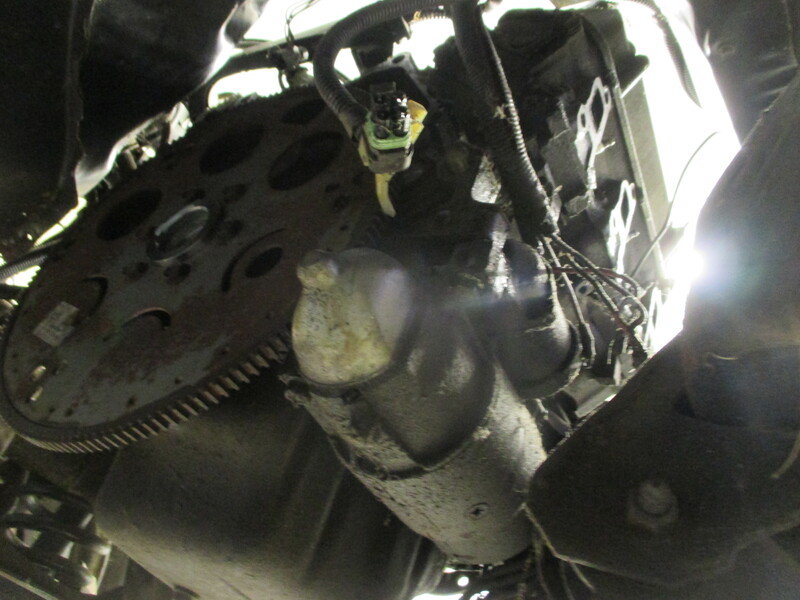 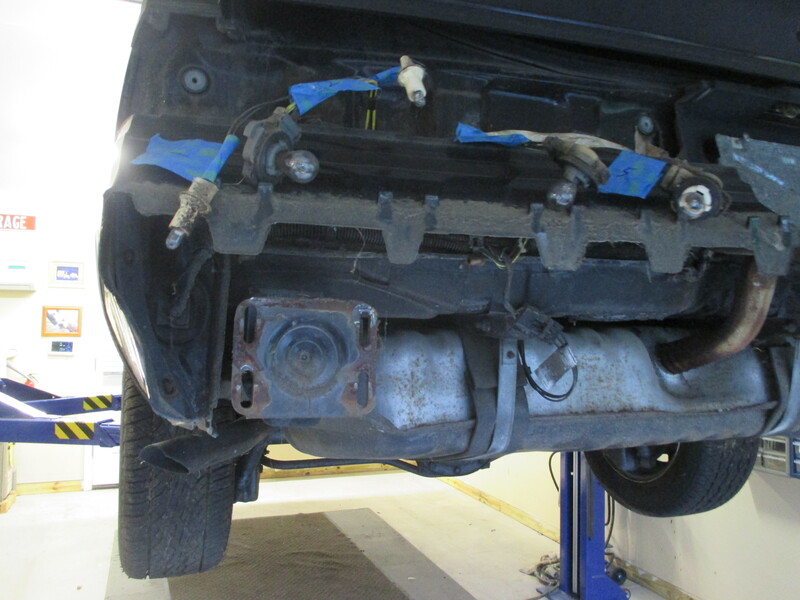 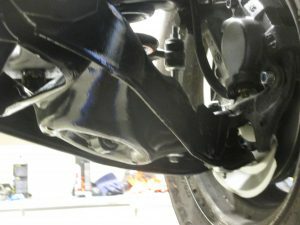 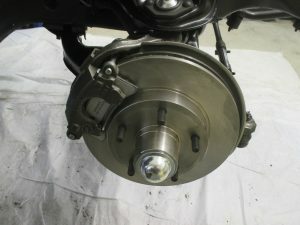 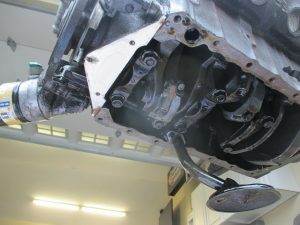 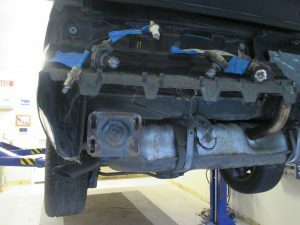 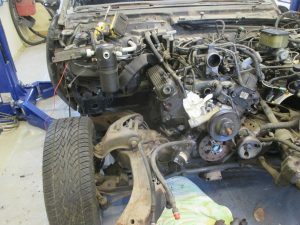 The transmission was removed and inspected. The fluid is a nice cherry red with no burnt odor. 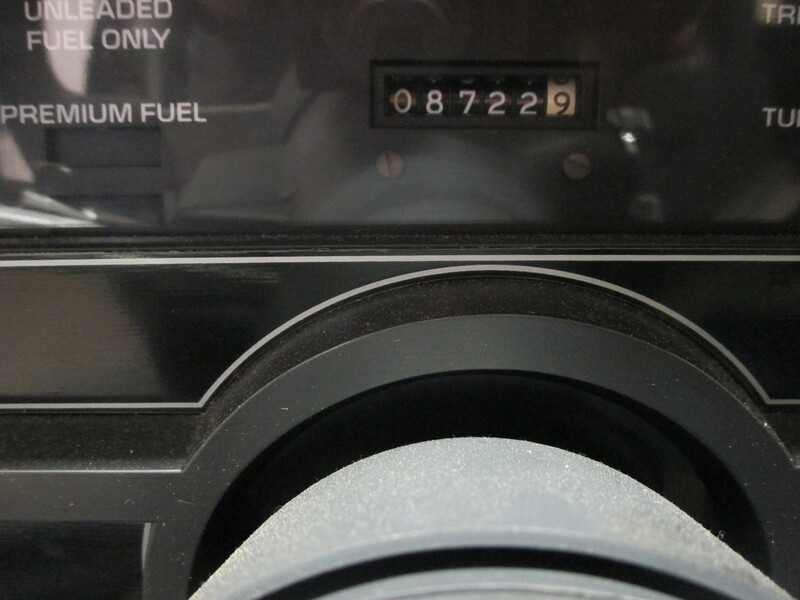 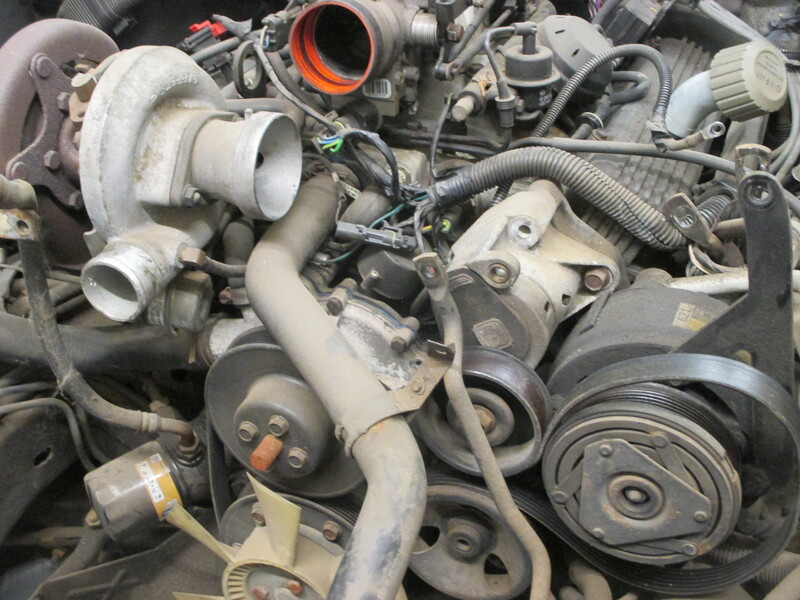 It will get a complete servicing with a new filter gaskets etc. 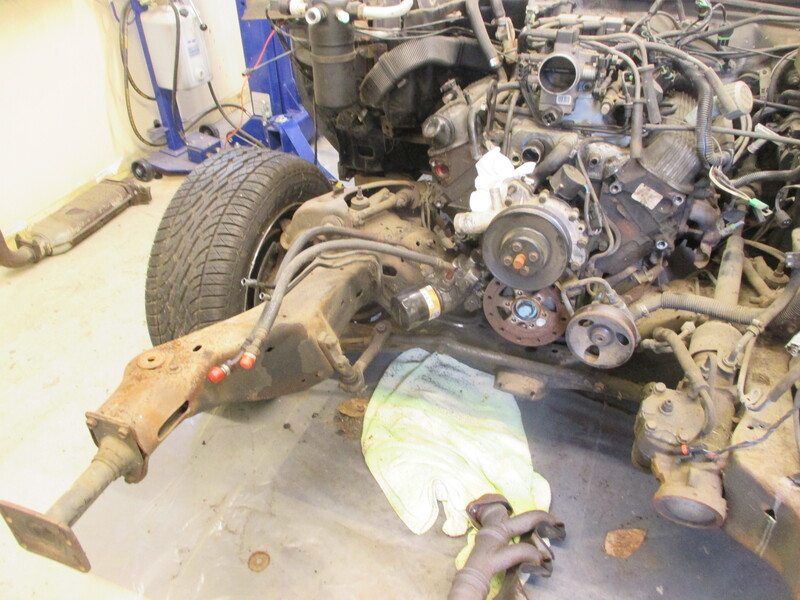 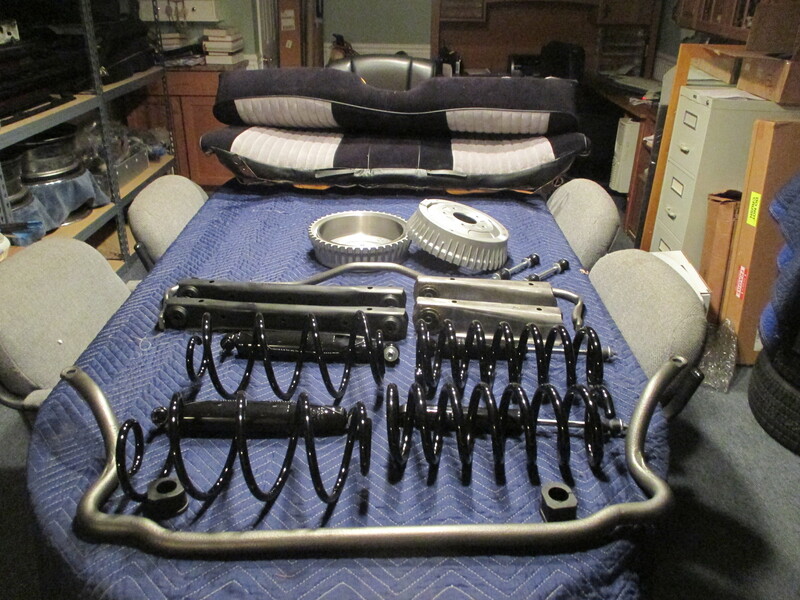 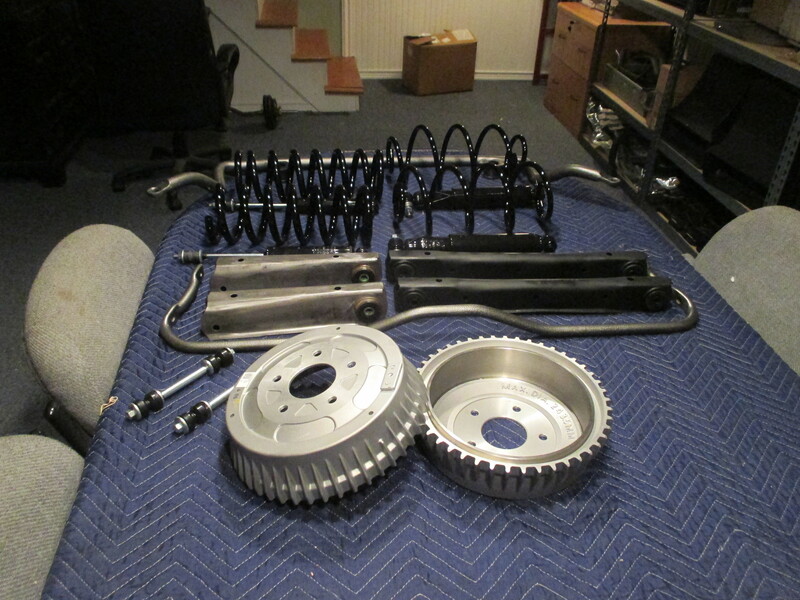 In order front clip, motor accessory and motor disassembly. 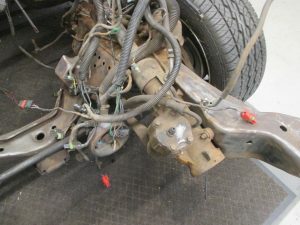 Each item is removed labeled and stored with its specific nuts and bolts. 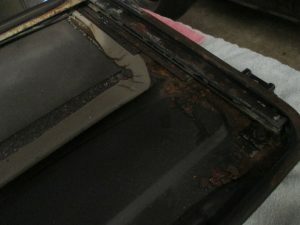 Every item removed will be replaced or restored. Many more pictures on the way!!!!! 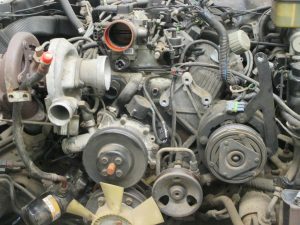 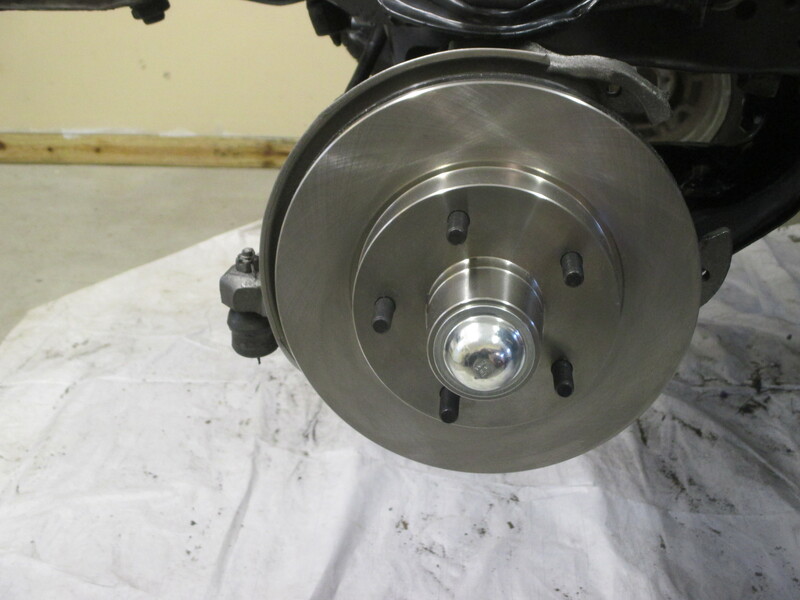 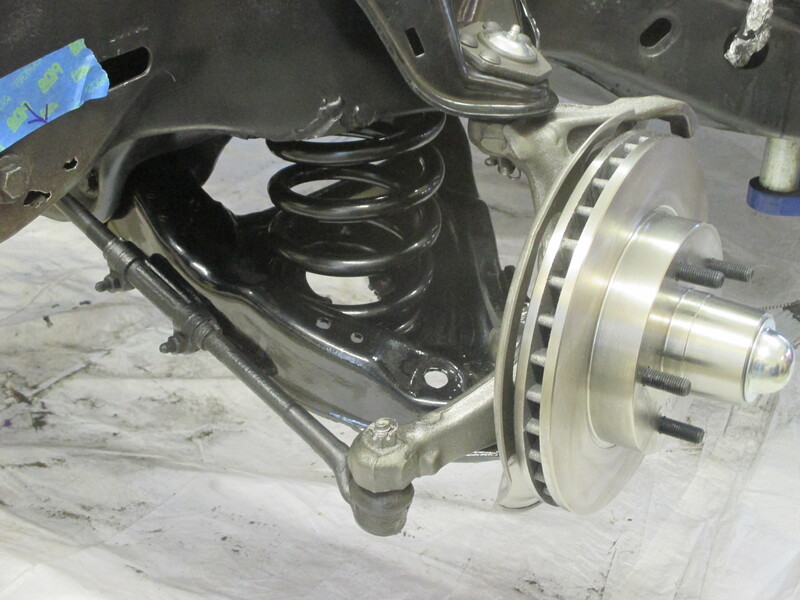 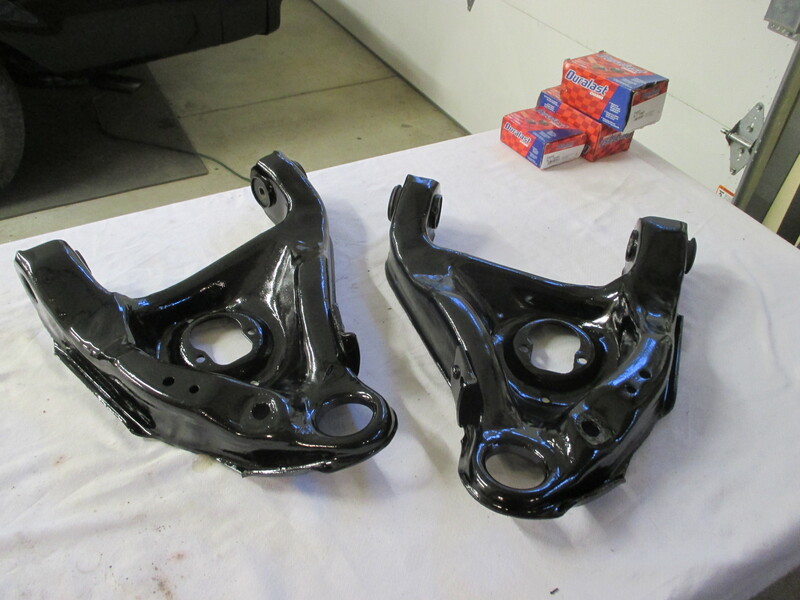 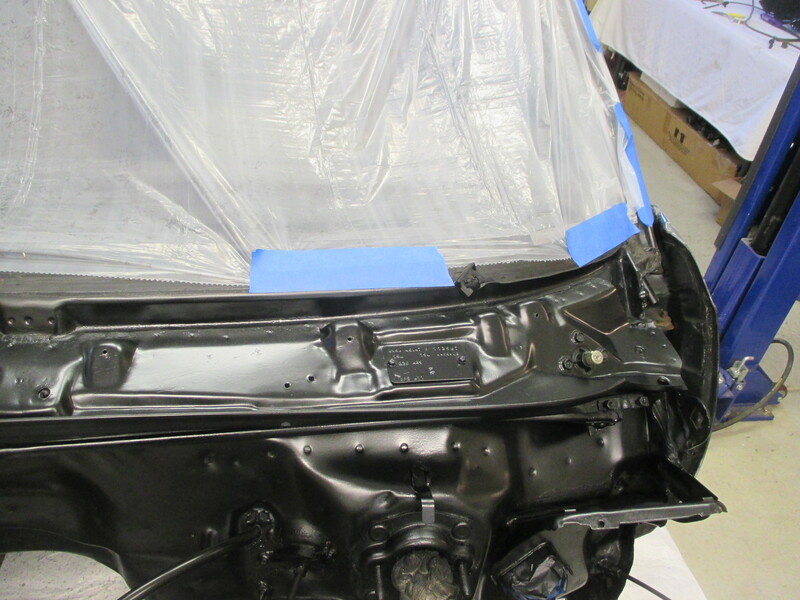 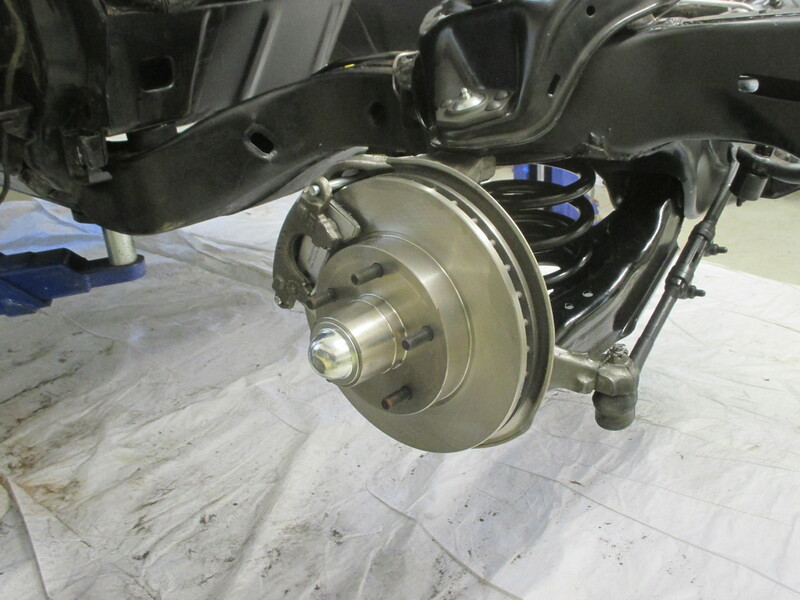 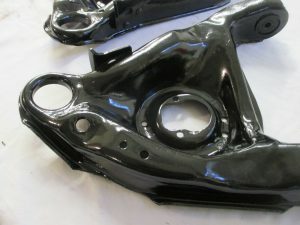 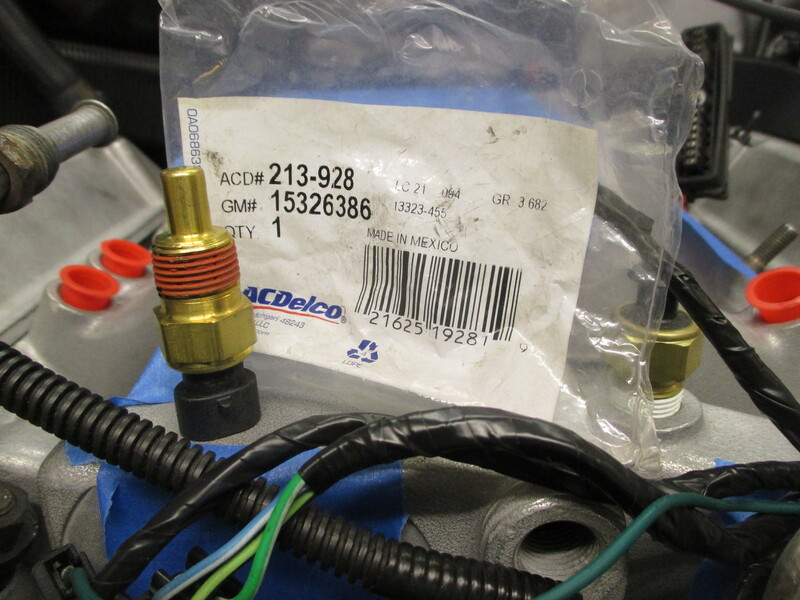 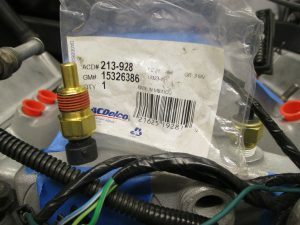 Including items that have already been restored for you car. 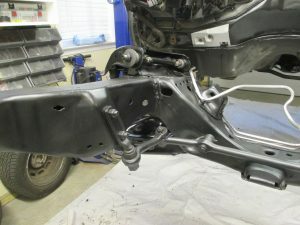 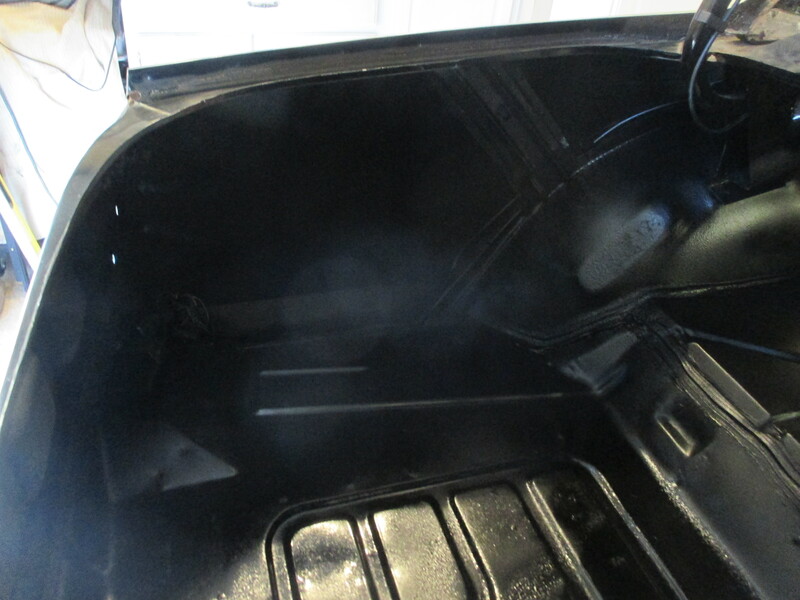 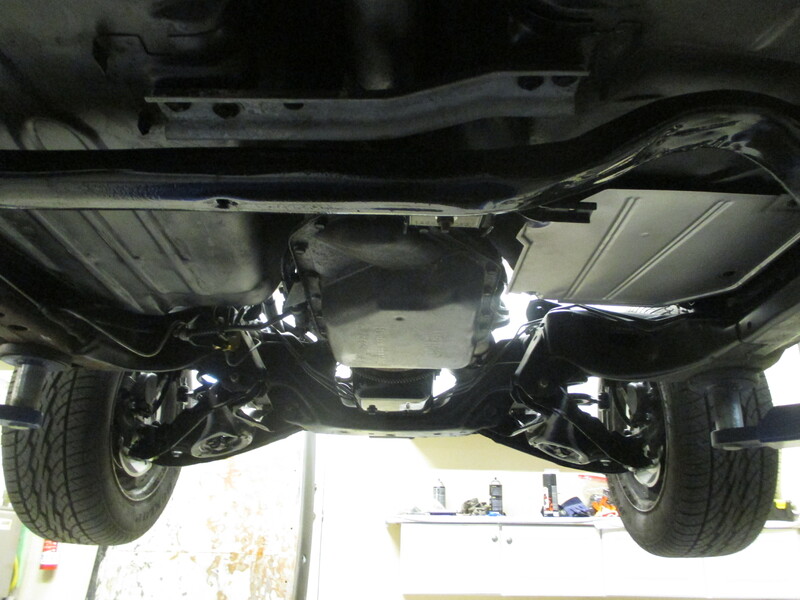 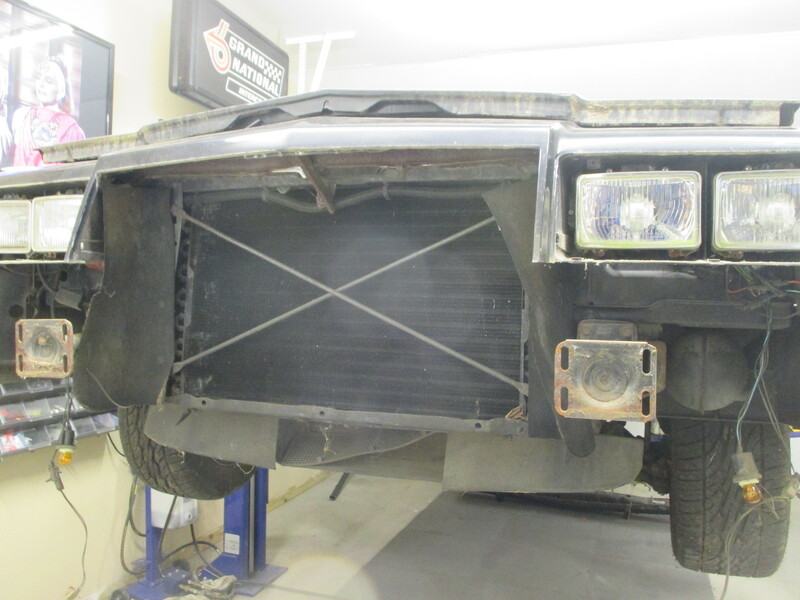 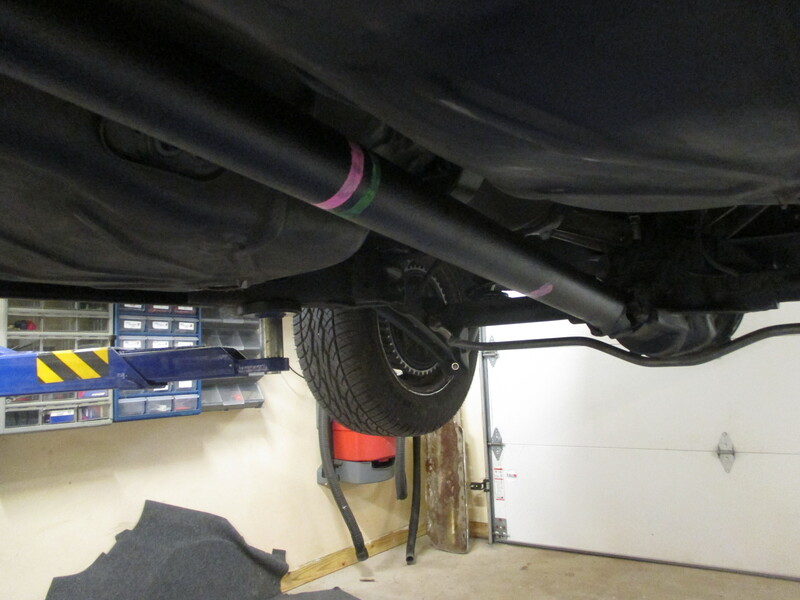 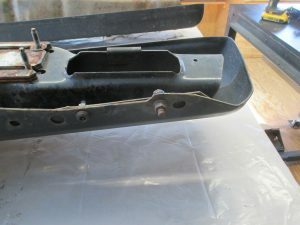 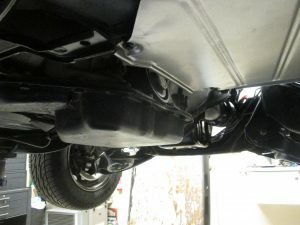 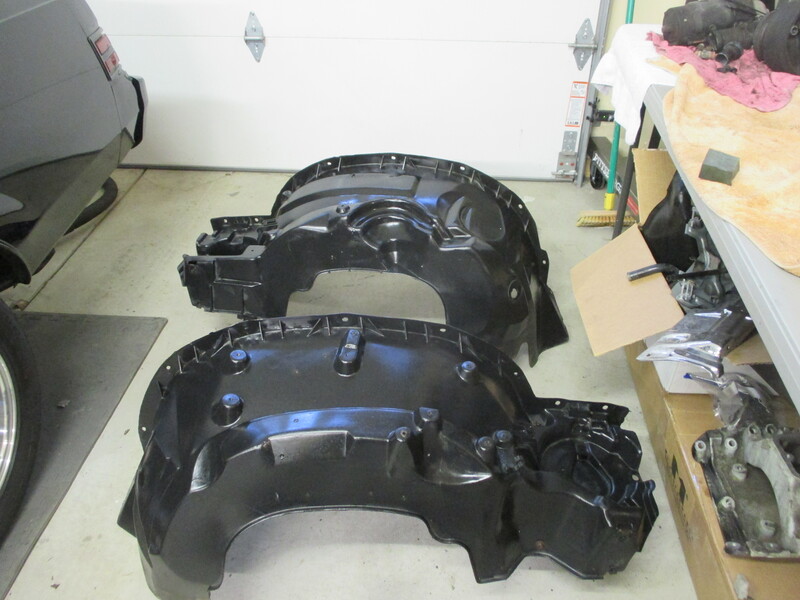 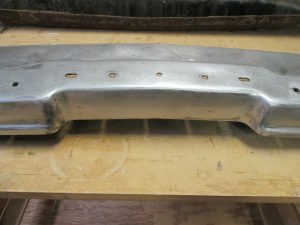 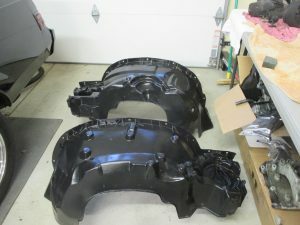 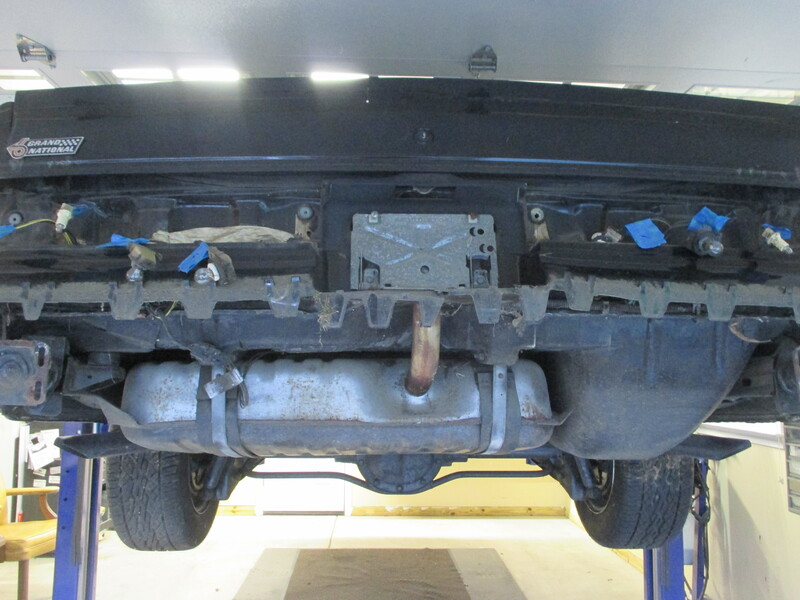 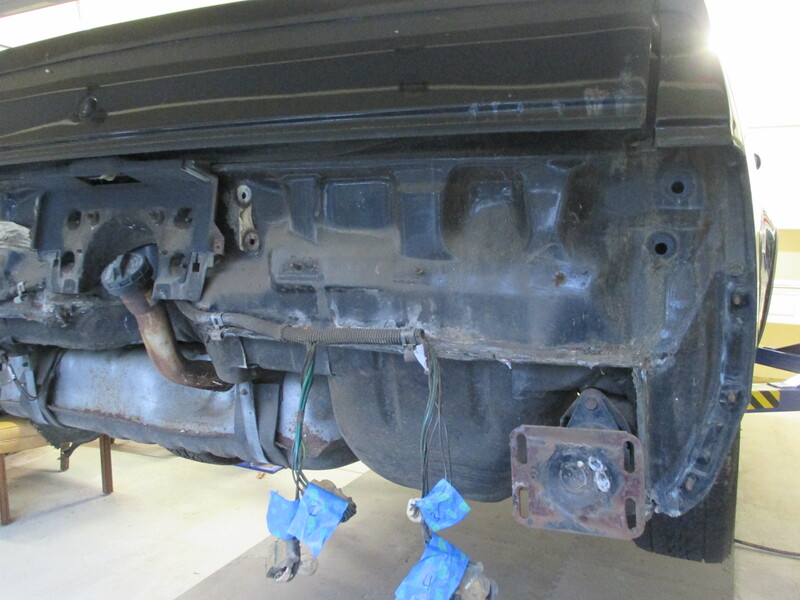 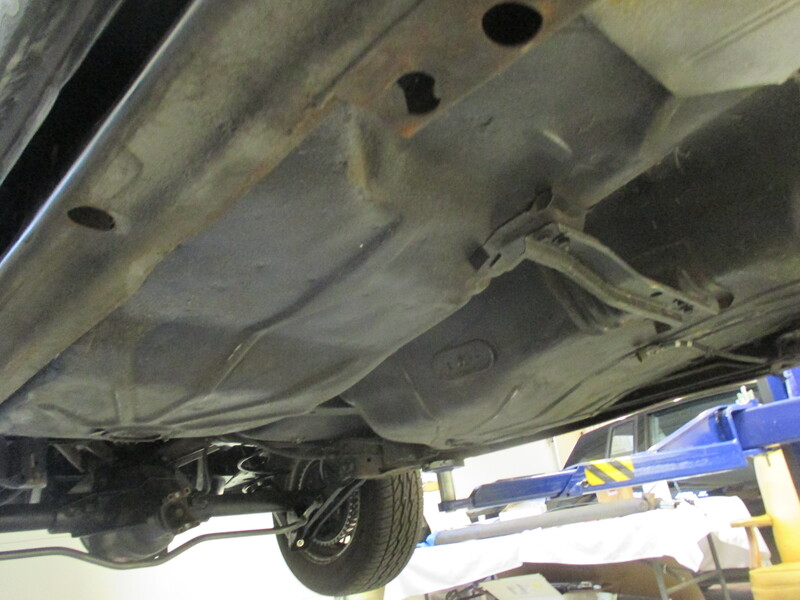 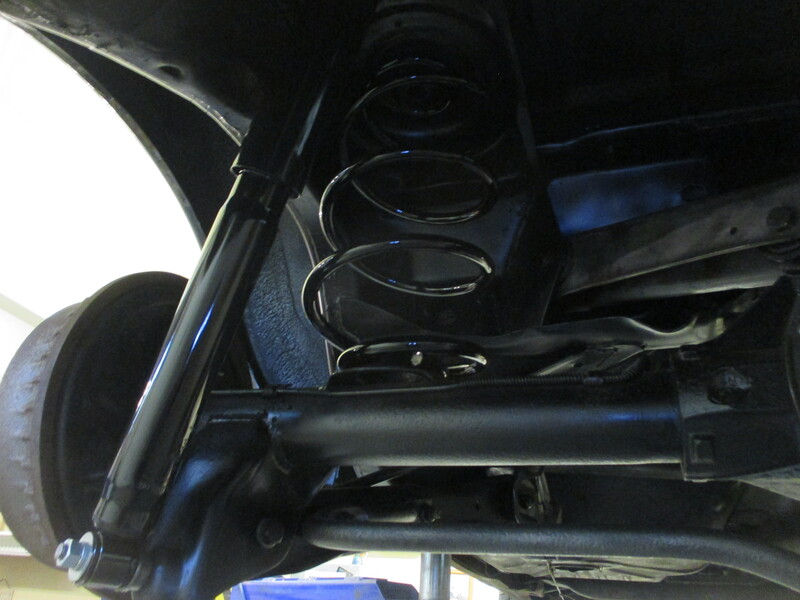 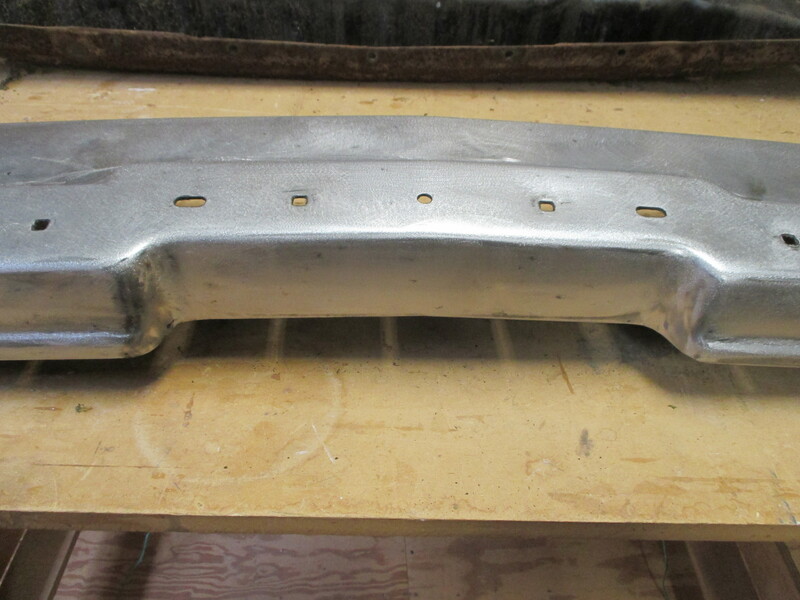 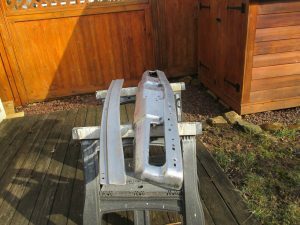 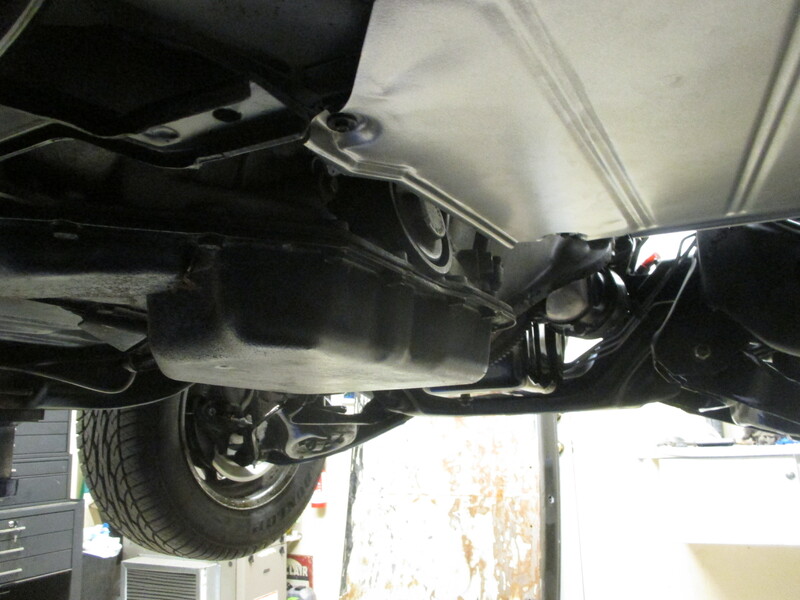 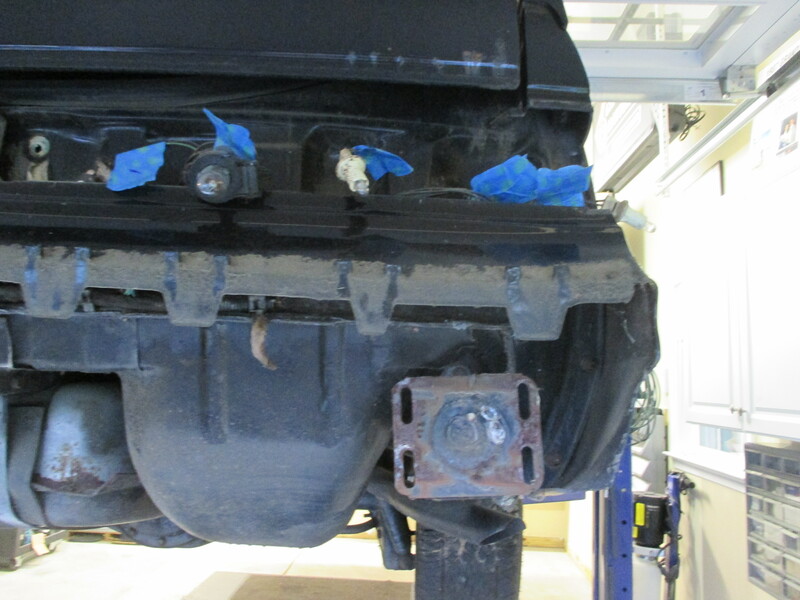 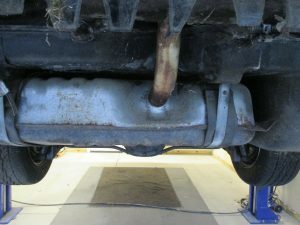 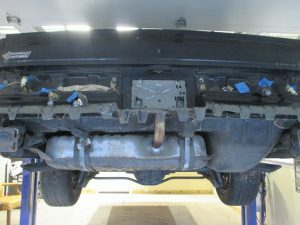 Under area of trunk was stripped and painted with a 2 part chassis paint, rear frame rails also done and original muffler brackets completely restored. 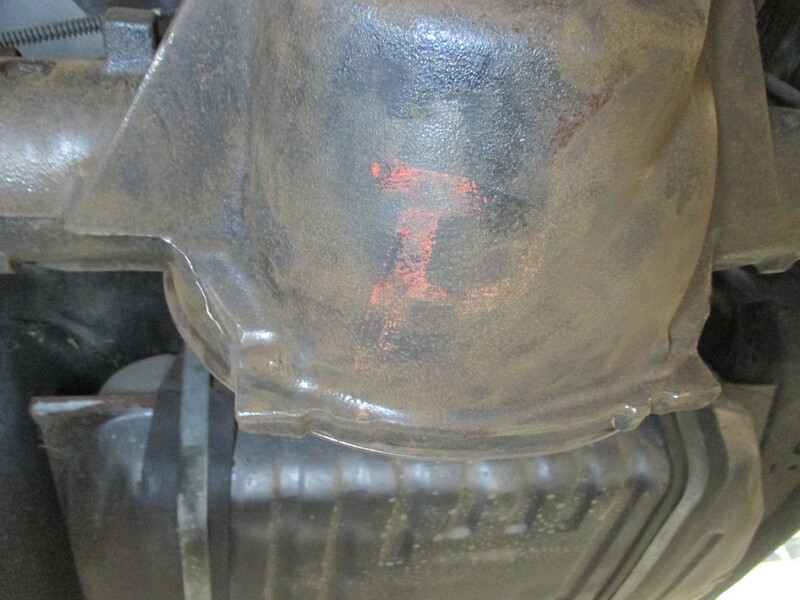 Also note that the letter “P” was also restored in the factory color. 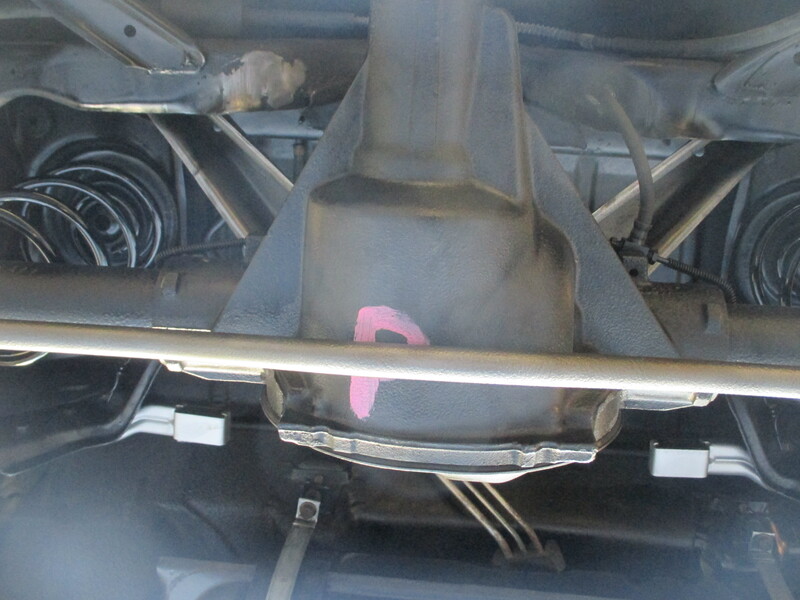 The “P” was written so that the person on the assembly line knew that this car received a POSI rear. 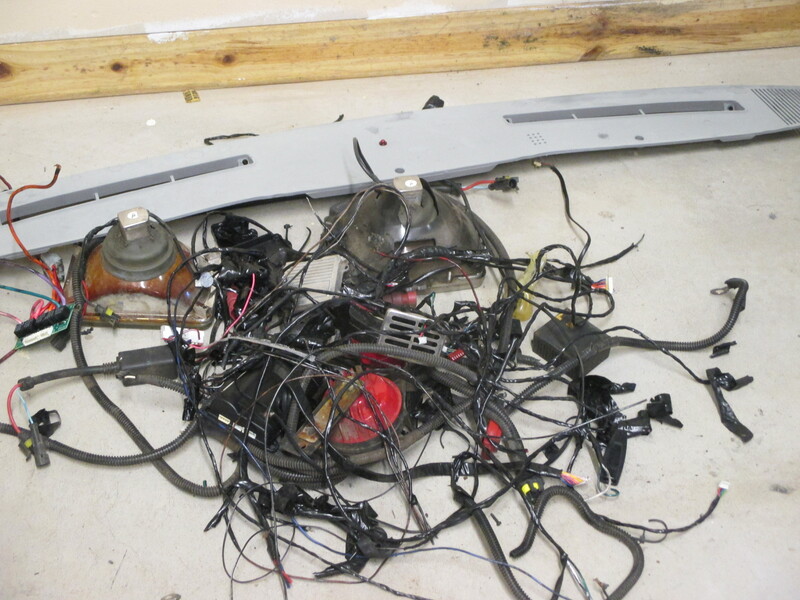 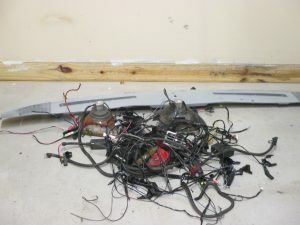 These are all the wires that don’t belong in a turbo Buick. 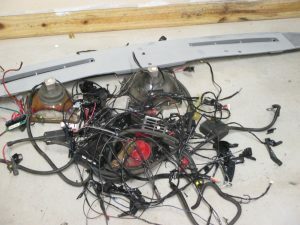 Many years of alarms and remote start systems leave yards of wires that don’t belong and many original wires missing or damaged. 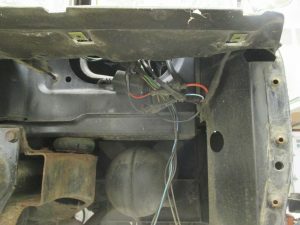 All of the offending wires were removed and and repairs/replace made to the original wiring. 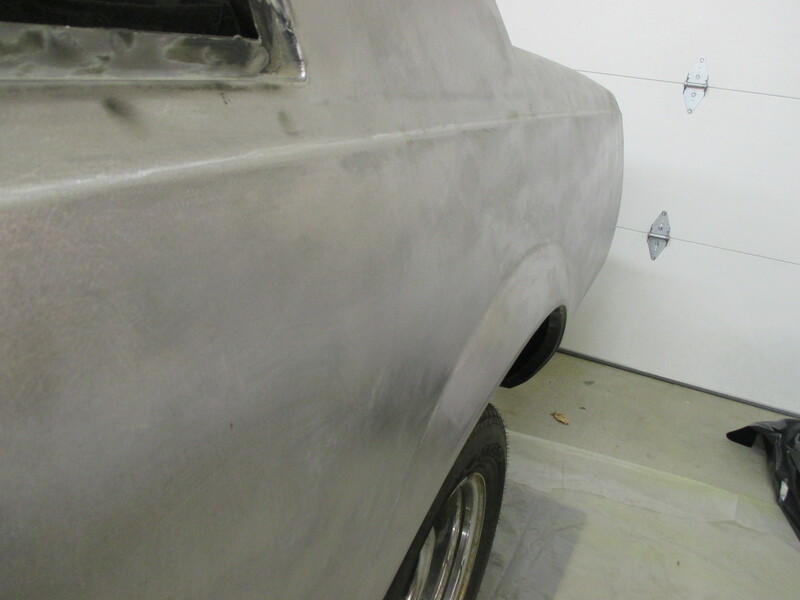 The main body of this car is solid, with no dents or bondo. 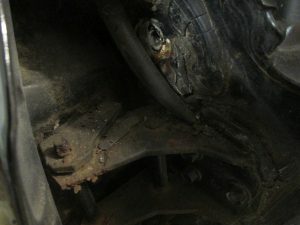 Old suspension has seen better days. 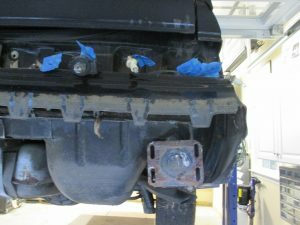 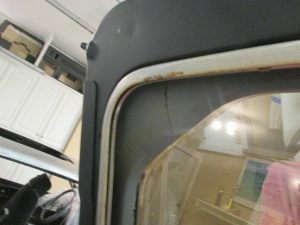 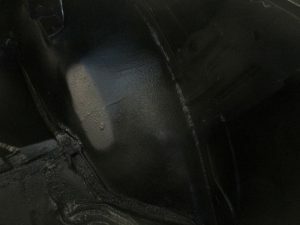 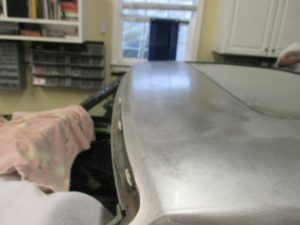 We did uncover some of the original makings including the “P” painted on the rear indicating that the car has a Posi rear. 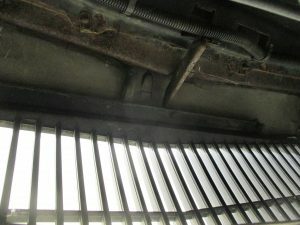 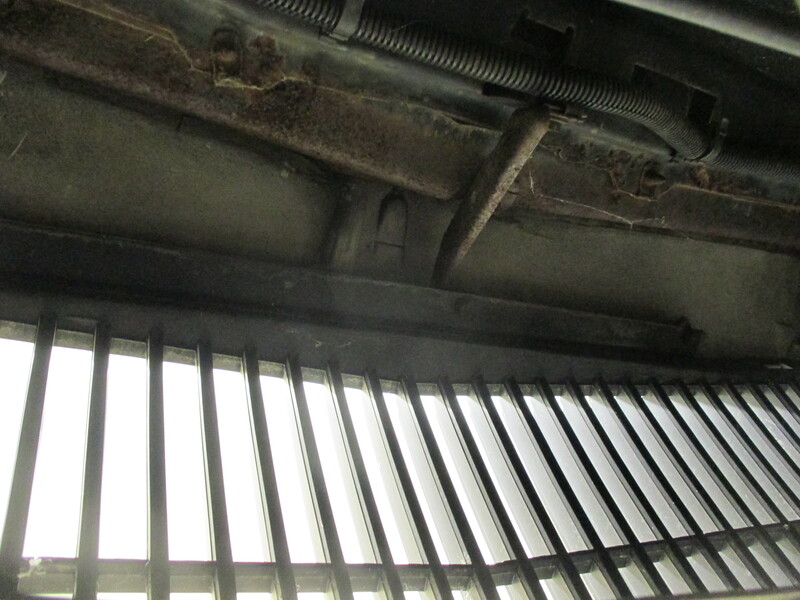 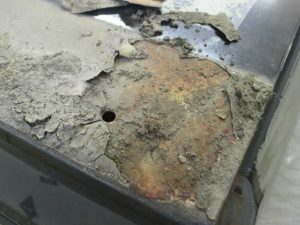 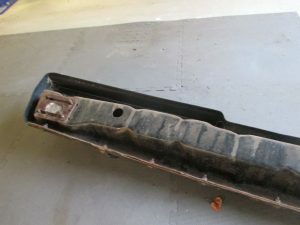 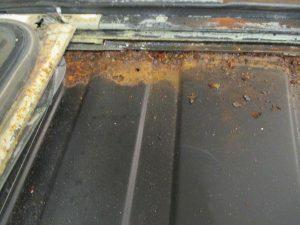 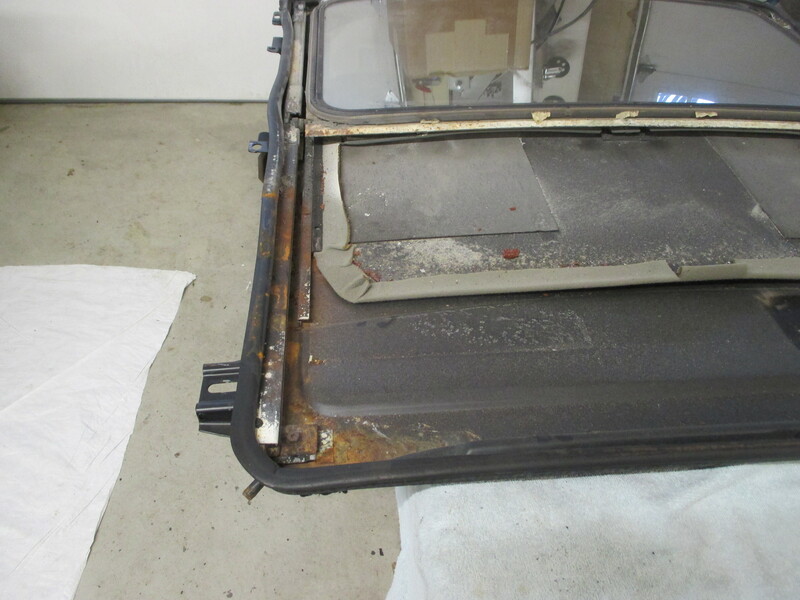 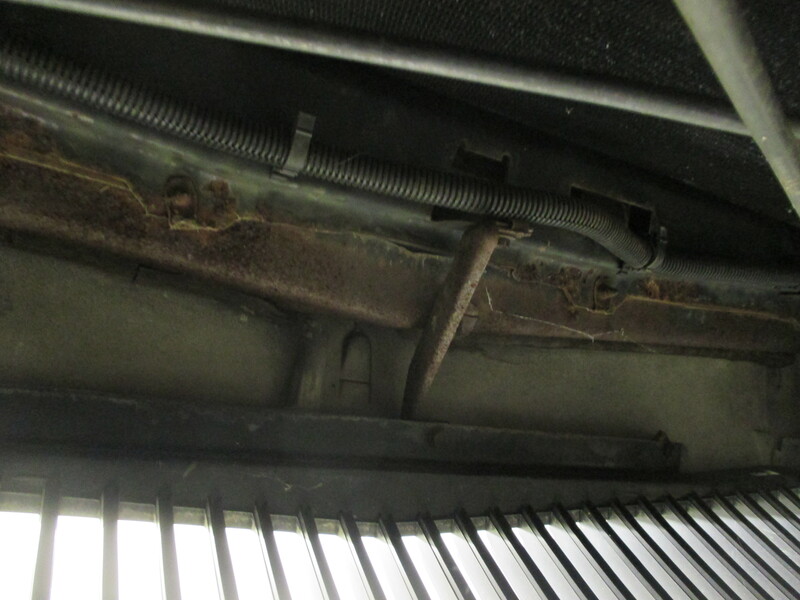 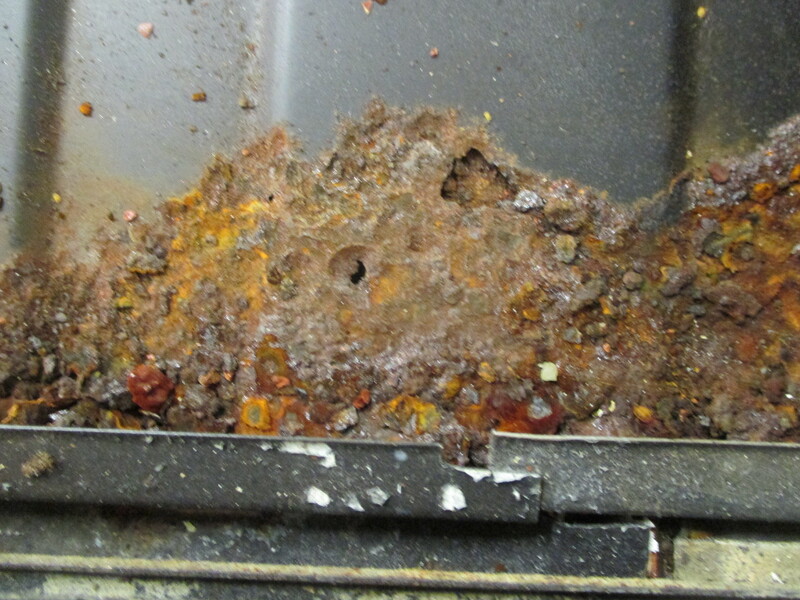 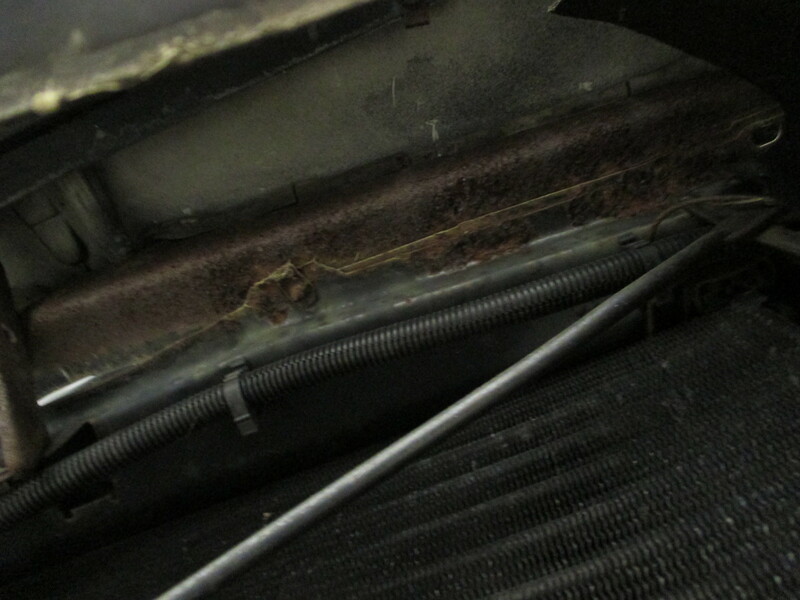 The trunk has extensive rust and both doors have a lot of rust on the lower edge. 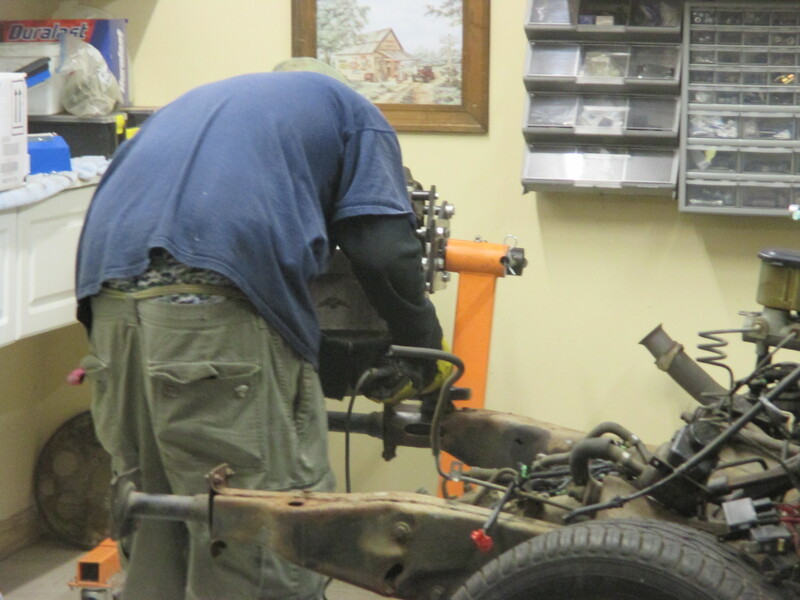 Tune in to the build, much more to come……………..
All of our cars a carefully taken apart with each part cataloged, labeled and stored.